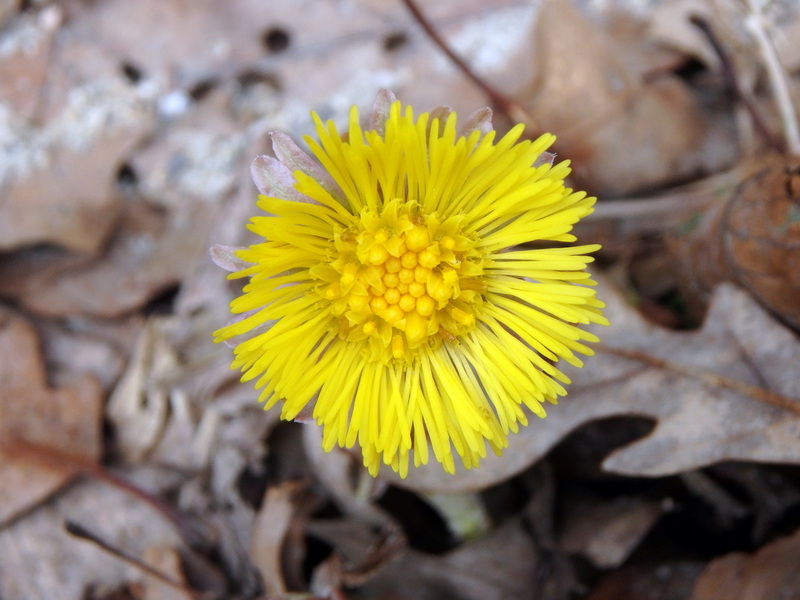 I had given up on finding any coltsfoot flowers (Tussilago farfara) last week and then there they were, blooming in a roadside ditch. 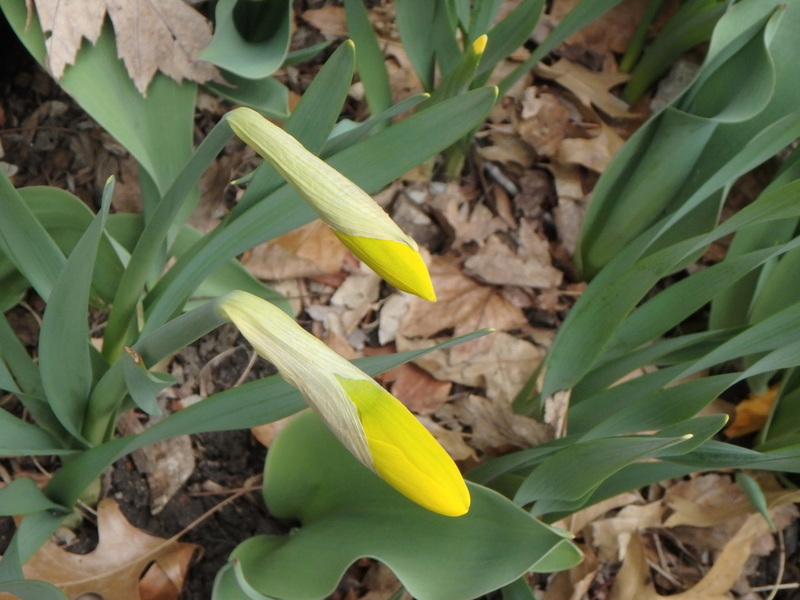 I was thinking that I was just too early but a 70 degree day must have triggered their bloom. But not only them; many flowers appeared literally overnight. 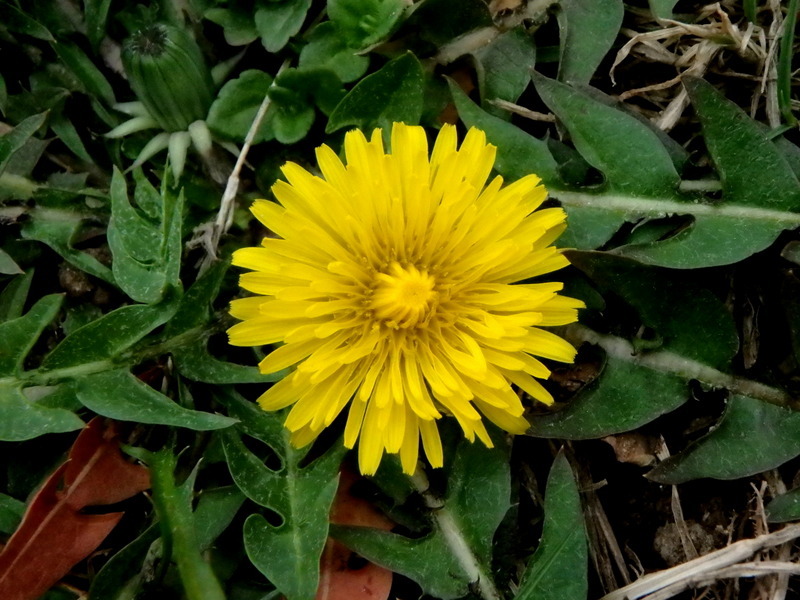 From a distance a coltsfoot blossom might look like a dandelion but the flowers are often smaller than dandelions and they are usually flat, rather than the mounded shape of a dandelion. 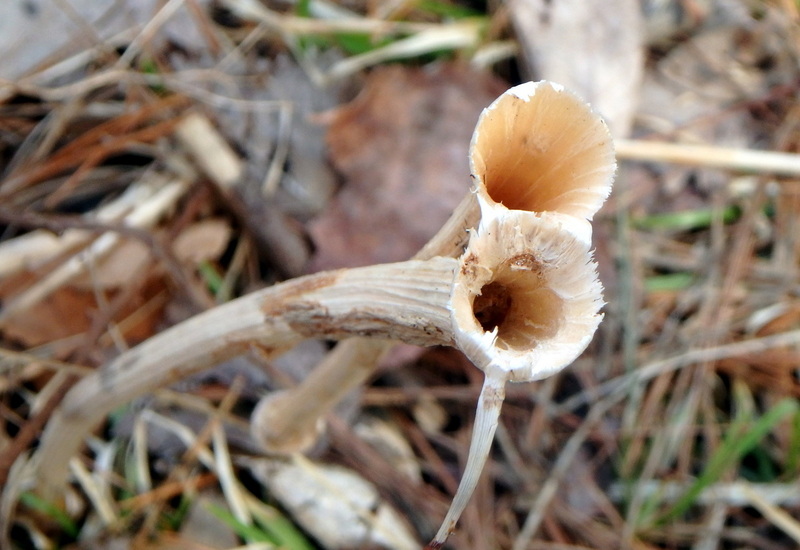 But the real clincher is the stem, which is scaly like that seen here. Dandelion stems are smooth. They’re very pretty little flowers but they aren’t with us long. Depending on the weather and how hot it gets I’ve seen them disappear in two weeks. 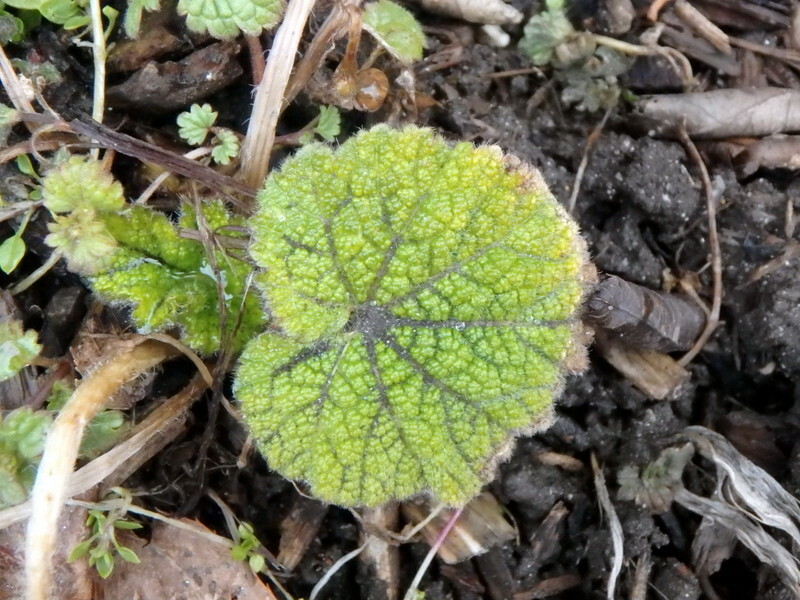 Coltsfoot is native to Europe and Asia and was brought here by early settlers. It has been used medicinally for centuries and another name for it is coughwort. 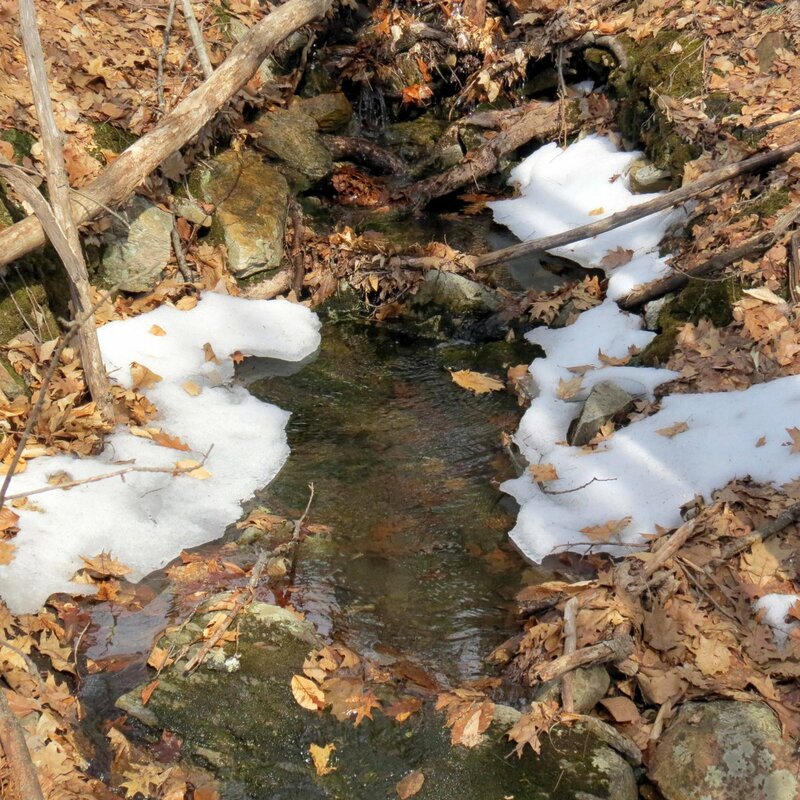 I went to the place where spring beauties grow last Saturday afternoon and though I saw a plant or two I didn’t see a single blossom. 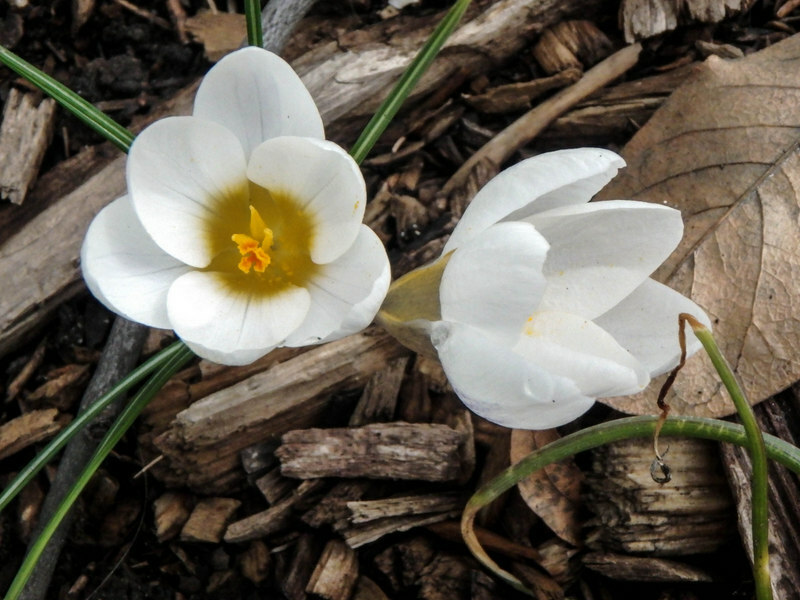 Then on Sunday, less than 24 hours later, there were 5 or 6 blossoms so it has started, and soon there will be thousands of them carpeting the forest floor. They’re such small flowers; each one is only slightly bigger than an aspirin, but there is a lot of beauty packed into a small package. For me spring isn’t really here until I hear the sad fee-bee mating call of the black capped chickadee and see these beautiful little flowers. Now I’ve seen and heard both and there’s no turning back; spring is in my bones. 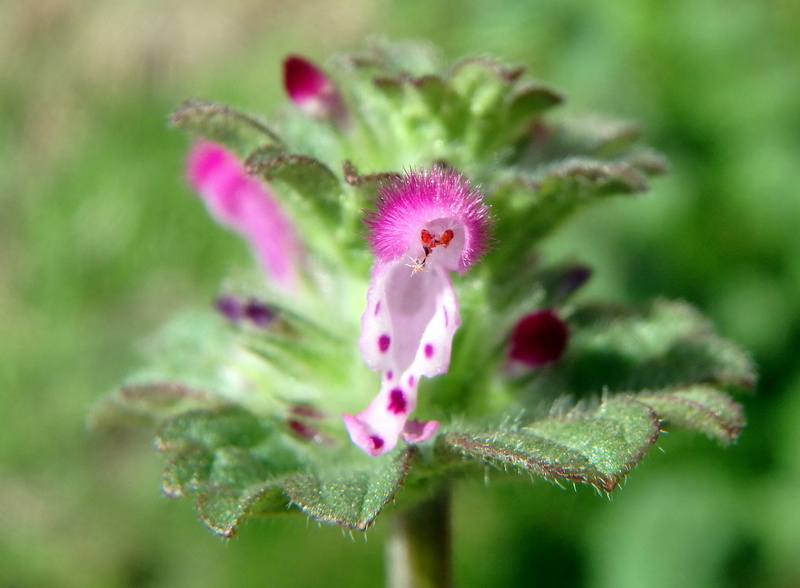 Henbit (Lamium amplexicaule) gets its common name from the way chickens peck at it. The plant is in the mint family and apparently chickens like it. The amplexicaule part of the scientific name means clasping and describes the way the hairy leaves clasp the stem. 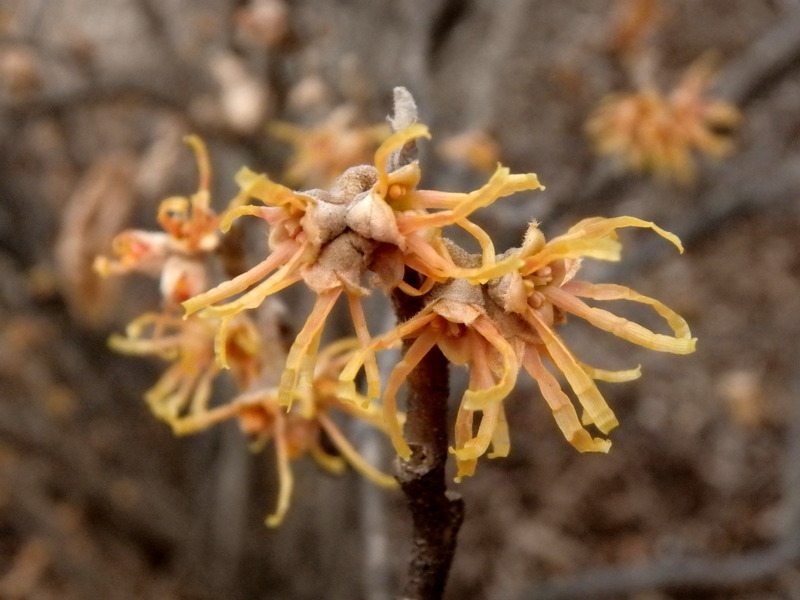 The plant is a very early bloomer and blooms throughout winter in warmer areas. Henbit is from Europe and Asia, but I can’t say that it’s invasive because I rarely see it. I’ve read that the leaves, stem, and flowers are edible and have a slightly sweet and peppery flavor. It can be eaten raw or cooked. Fly honeysuckle (Lonicera canadensis) is one of our earliest blooming shrubs and one that not many people see unless they walk in early spring. This example that I saw recently had pink tipped buds but no flowers yet. 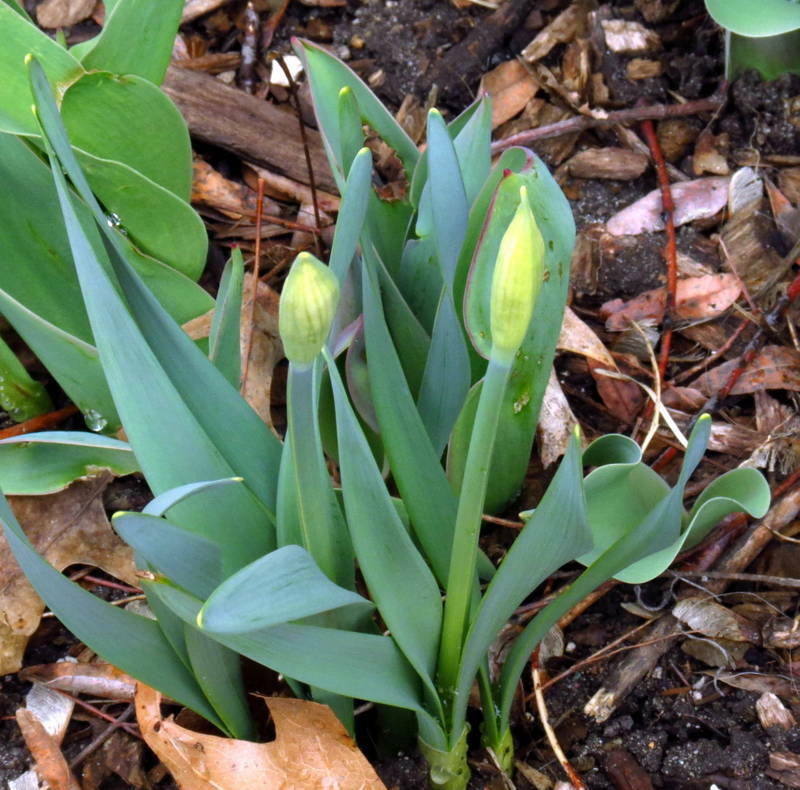 I’d guess it would be blooming today, but as always that depends on the weather. 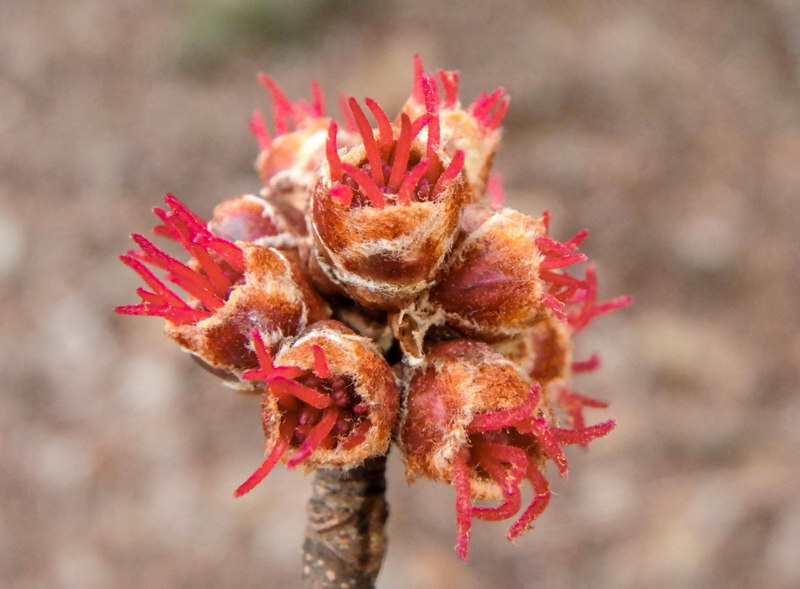 It’s unusual flowers are joined in pairs and if pollinated they become small, red orange, oval, pointed end berries that are also joined in pairs. 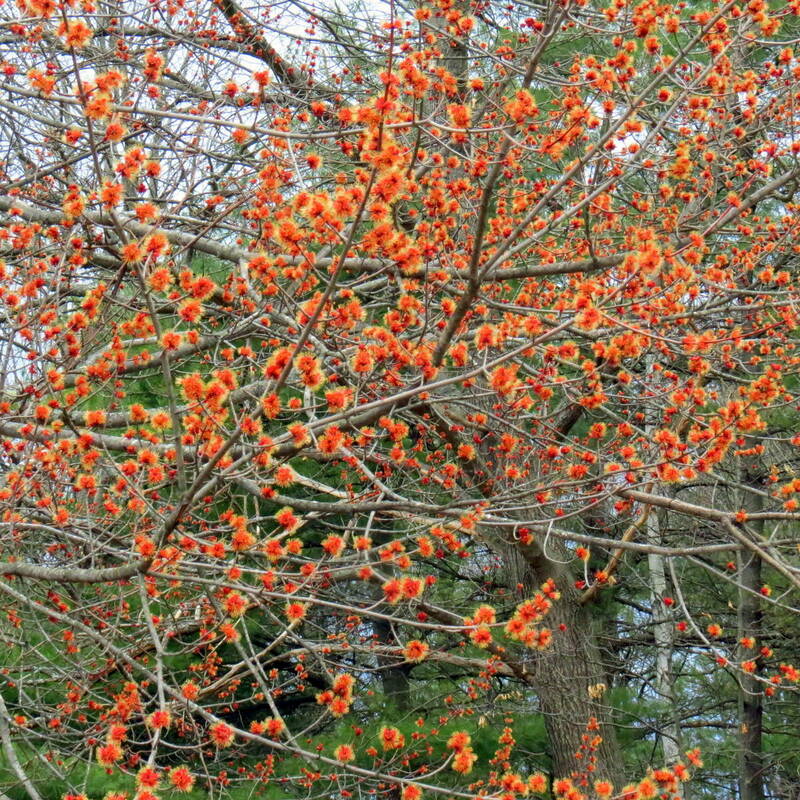 The flowers form on branch ends of small shrubs and many songbirds love the berries, so it would be a great addition to a wildlife garden. 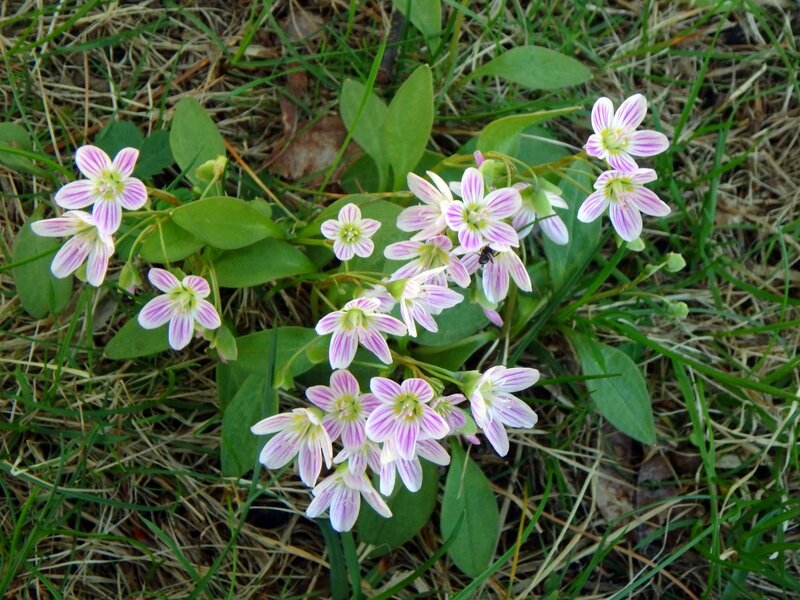 Look for the flowers at the end of April on the shaded edges of woods. 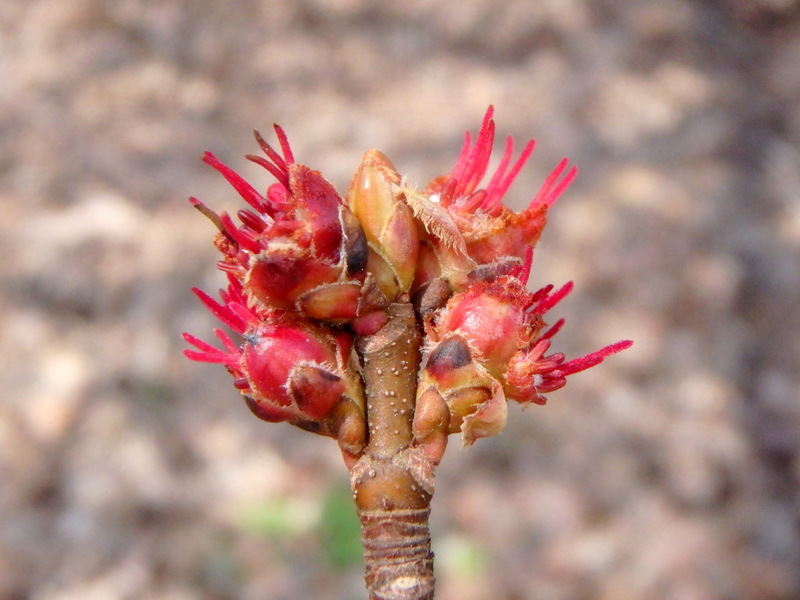 Red maples (Acer rubrum) are still blooming heavily and their bloom is staggered over thousands of trees, so some years it seems to go on and on. 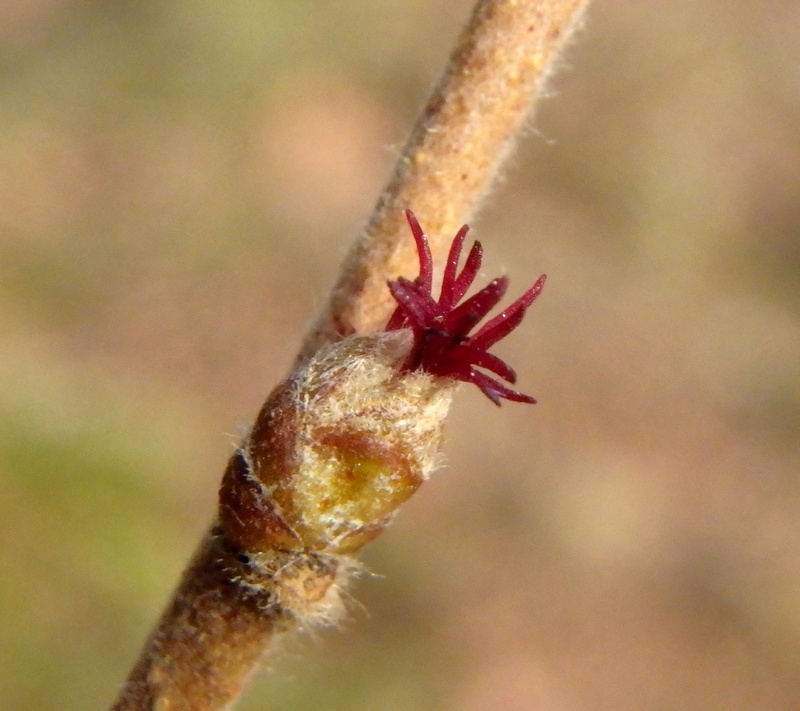 This photo is of the thread like female stigmas that catch the pollen from male trees. Soon they will become seeds; millions of them. 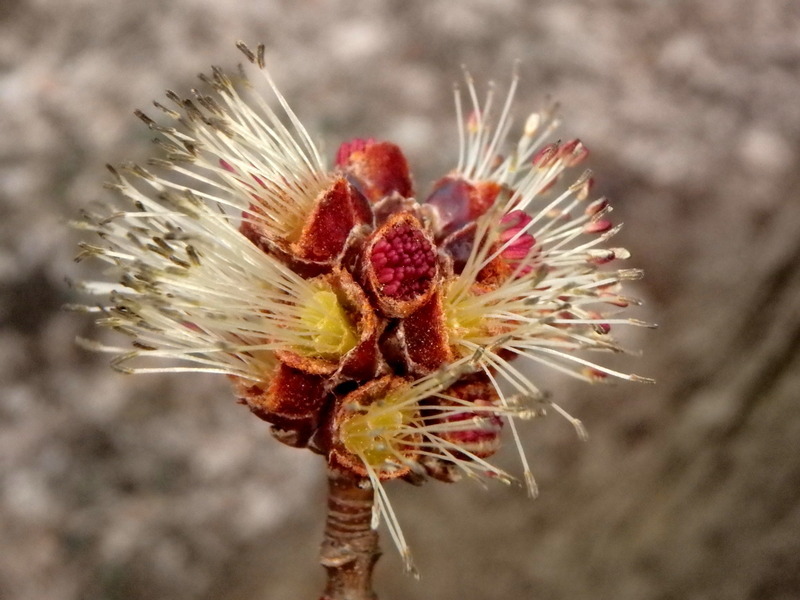 I found a red maple with many thousands of male flowers all blooming at once and for the first time I smelled their sweet fragrance. I had to actually put my nose right into a bud cluster to make sure the fragrance was coming from them, and it was. This tree was amazing, and just look at all that pollen. 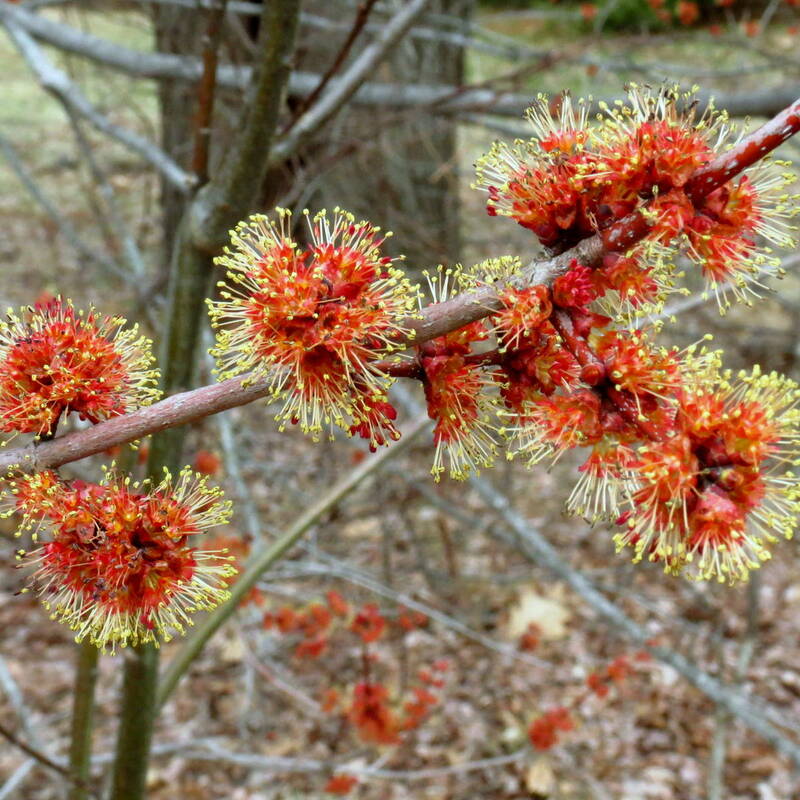 I wish everyone could see and smell a red maple in bloom. It’s something they wouldn’t soon forget. 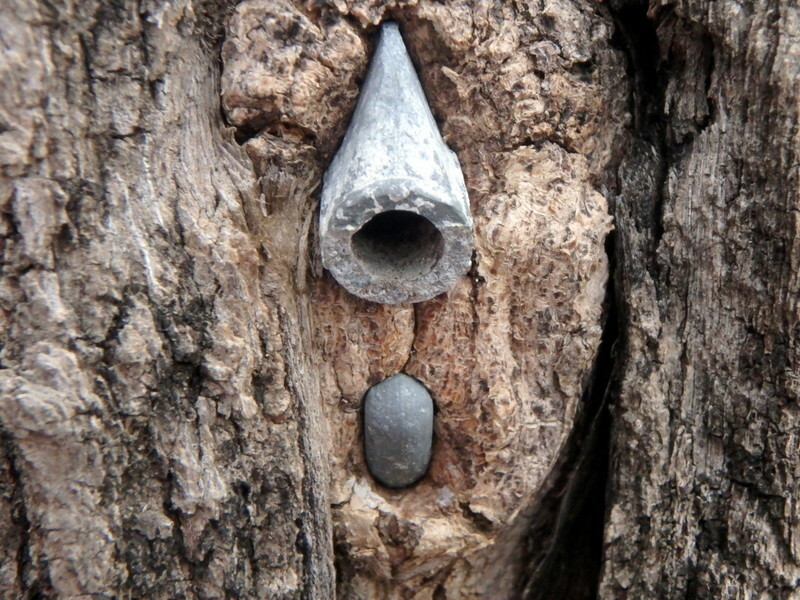 This box elder, another member of the maple family, was just opening its buds. 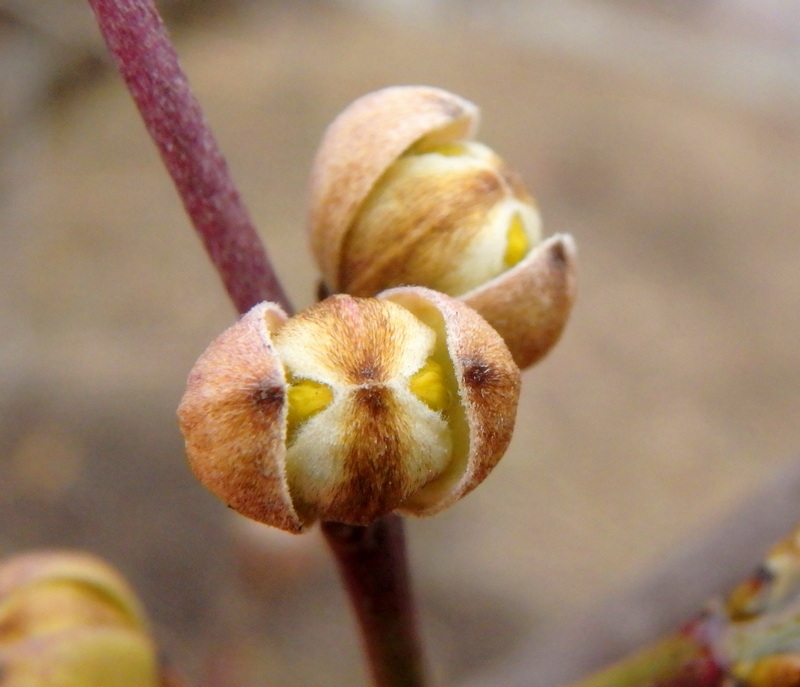 Box elders (Acer negundo) have beautiful lime green female flowers and I can’t wait to show them to you. 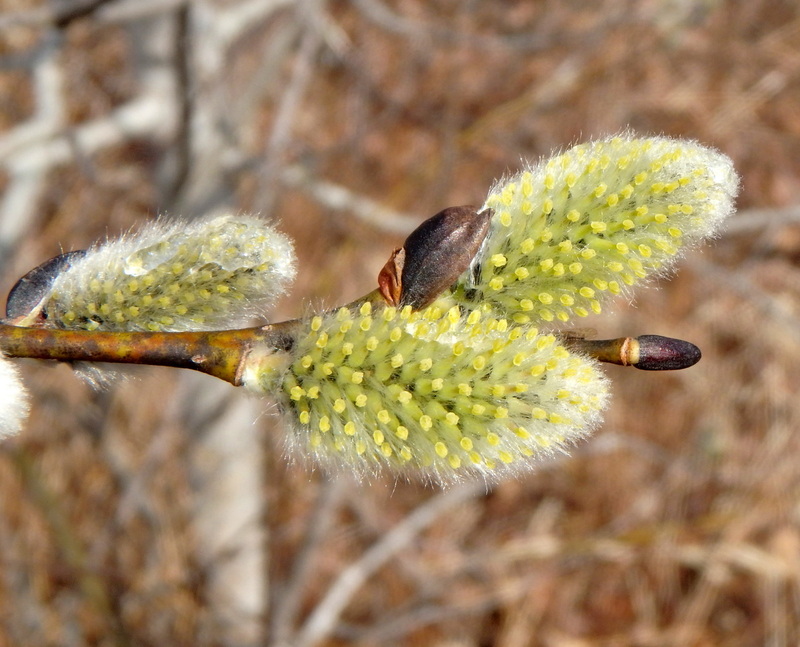 Willows (Salix) are another plant that decided to bloom overnight. Last week these buds were still gray and fuzzy and showed no color at all. Now both male and female flowers are everywhere. 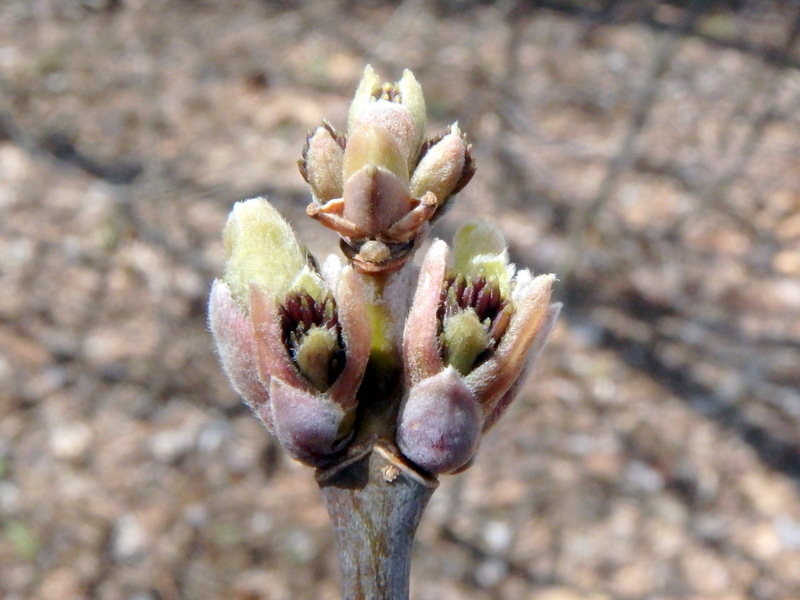 These are the male blossoms seen here. They’re the showiest. 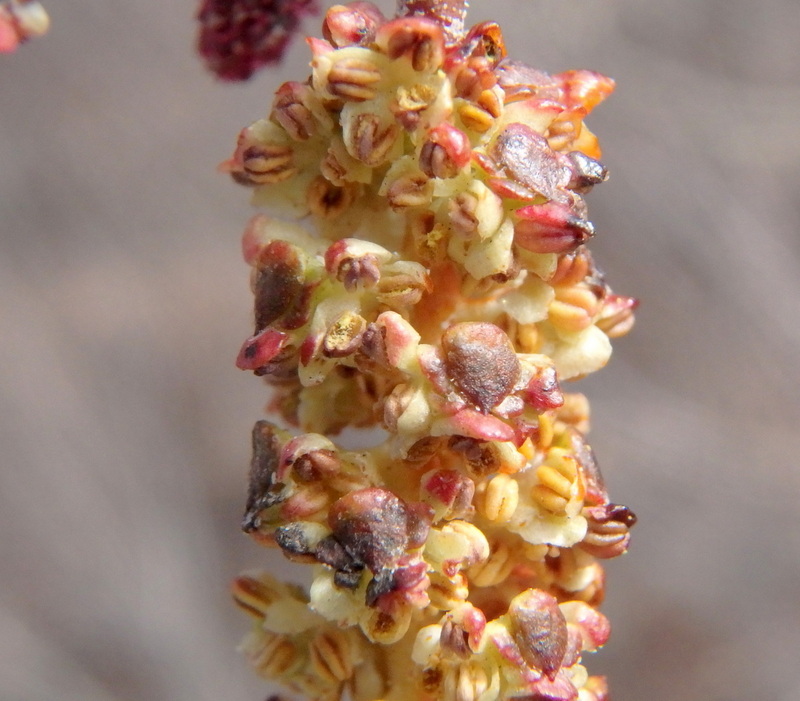 The female willow blossoms were just showing color last week and here they are on the same plant already becoming seed pods. Once it starts it happens fast, so if you want to see spring in all its wondrous forms you really have to be outside each day. 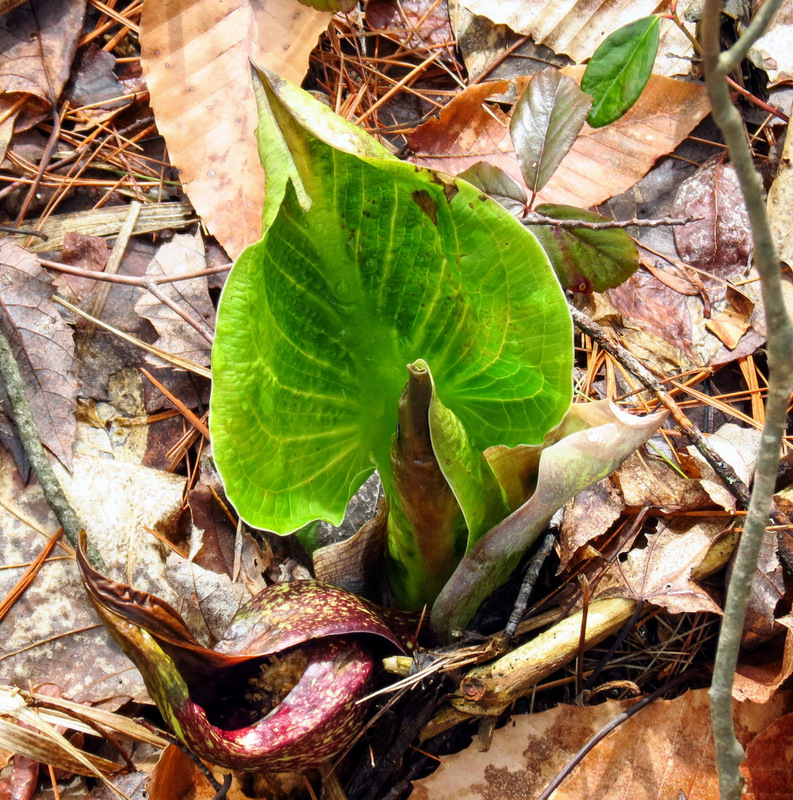 Skunk cabbage (Symplocarpus foetidus) was trying but still wasn’t looking much like cabbage to me. I hope I can find some of the fruit this year. I’ve never seen one and I’m guessing that their rarity must be due to most of the flowers not being pollinated. 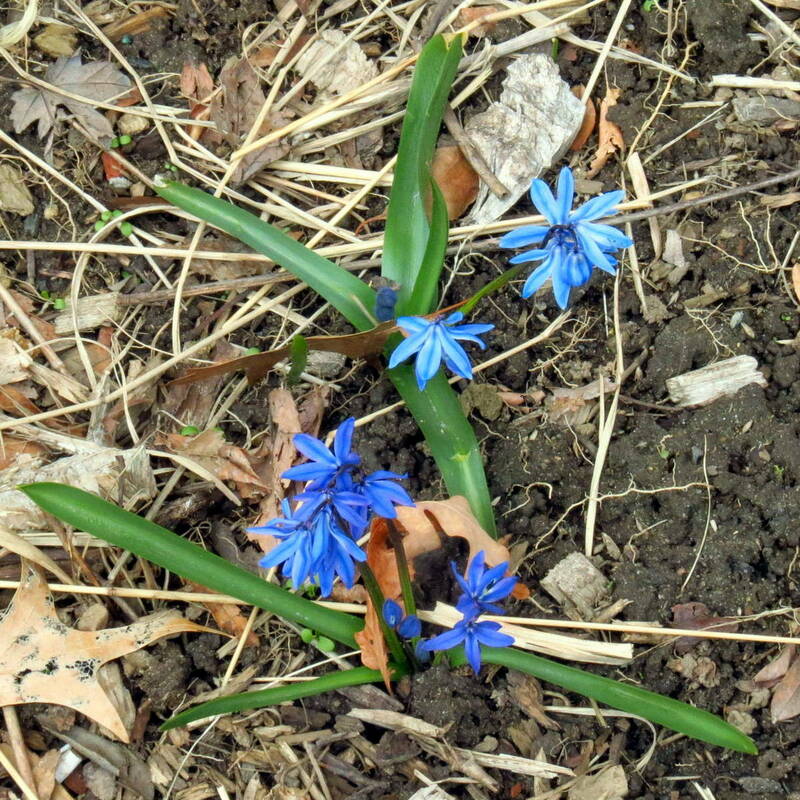 I recently said that I thought an in-ground sprinkler system installed last fall at a local park must have destroyed the only striped squill (Puschkinia scilloides, var. libanotica) that I know of, but last weekend they were all up and blooming beautifully. Since blue is my favorite color I’m very happy to see them. But I don’t see many; they border on rare here and I hardly ever see them. 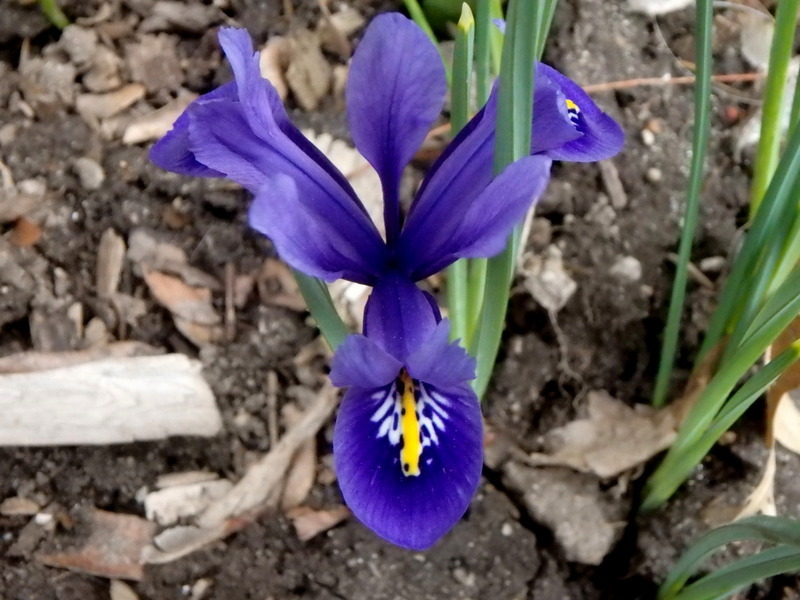 Though catalogs will tell you that the blue stripes are found only on the inside of the blossom they actually go through each petal and show on the outside as well as the inside, as the unopened buds will show. 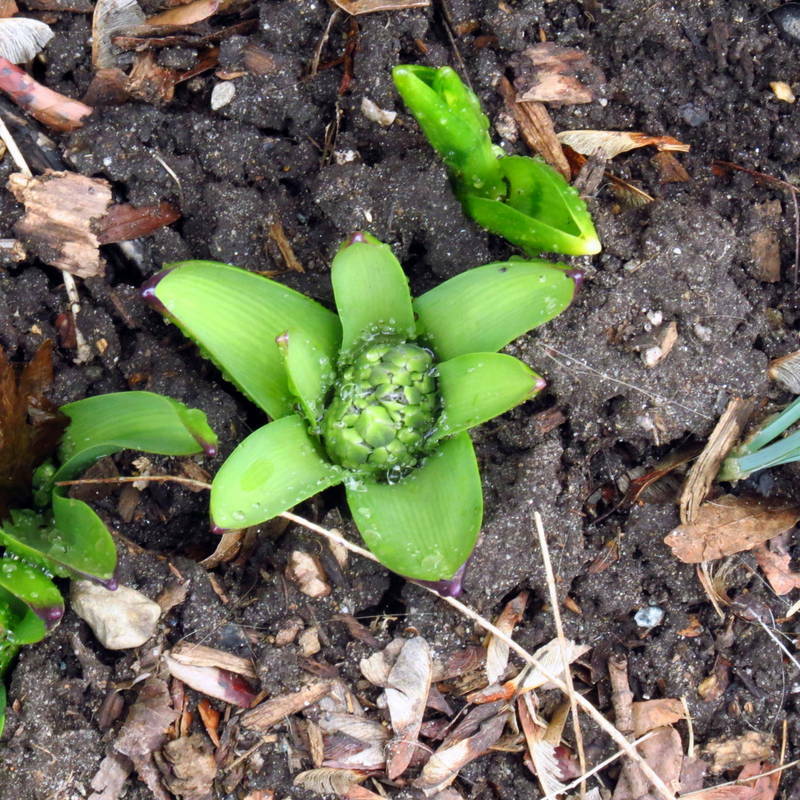 The flowers on this spring flowering bulb are about the same size as the scilla (Scilla siberica) flowers I think most of us are familiar with. They’re beautiful little things. 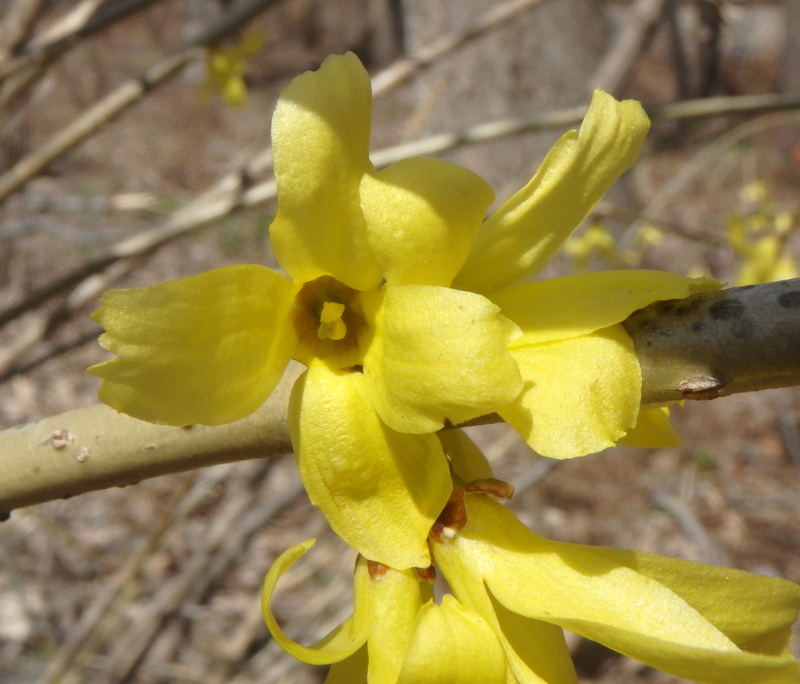 These are the first Forsythia blossoms I’ve seen this spring but they certainly won’t be the last. 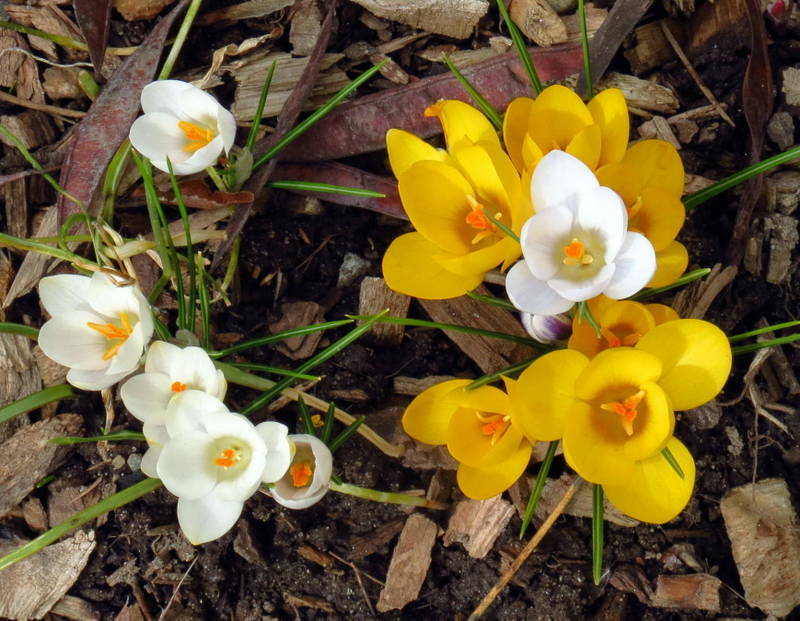 Soon they’ll be blooming on every street in the region. Overused? Yes, but try to imagine spring without them. 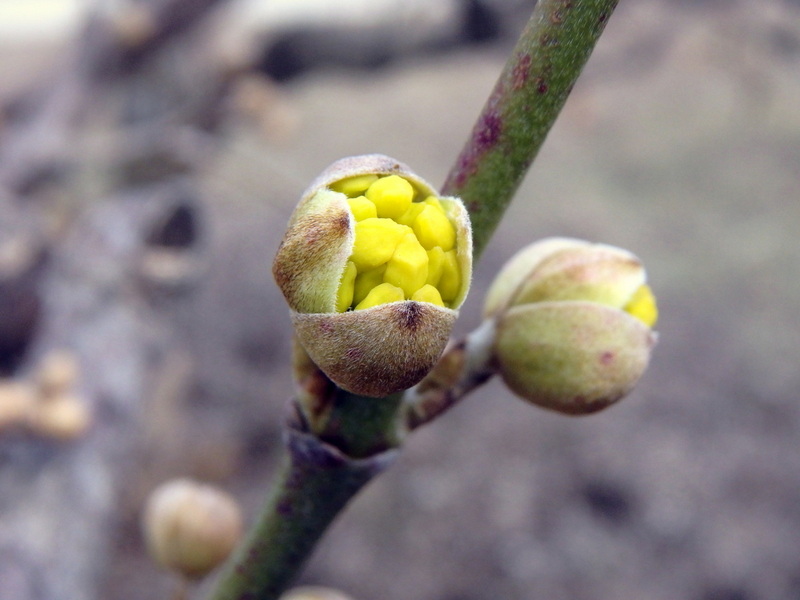 The Cornelian cherries (Cornus mas) are hedging their bets and waiting just a little longer before opening their small, waxy yellow flowers. I’d guess another week before we see them. Bees have suddenly appeared and though this one wouldn’t pose for the camera I think it was a honeybee. I haven’t seen a bumblebee yet but I have seen hoverflies and many other insects. 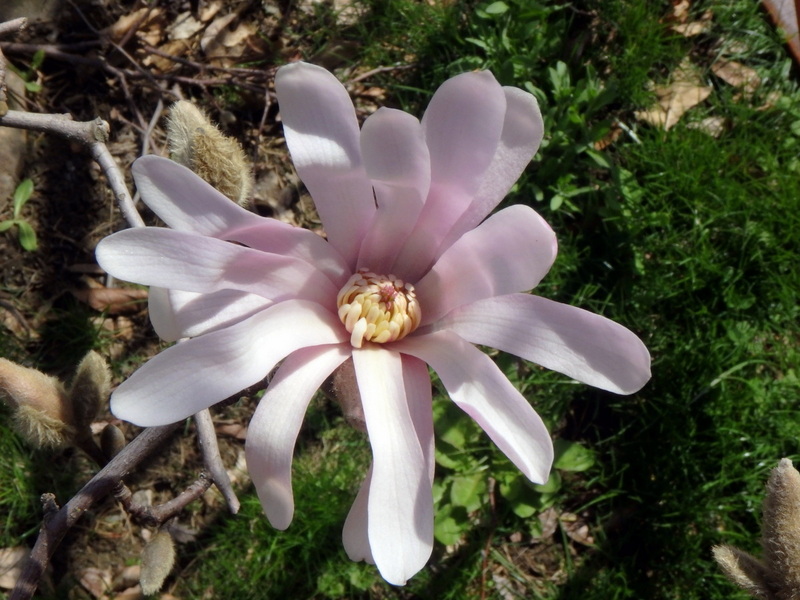 Magnolias have also started to bloom, with only a handful of blossoms on each tree. This one had beautiful deep pink buds which opened to paler pink flowers. 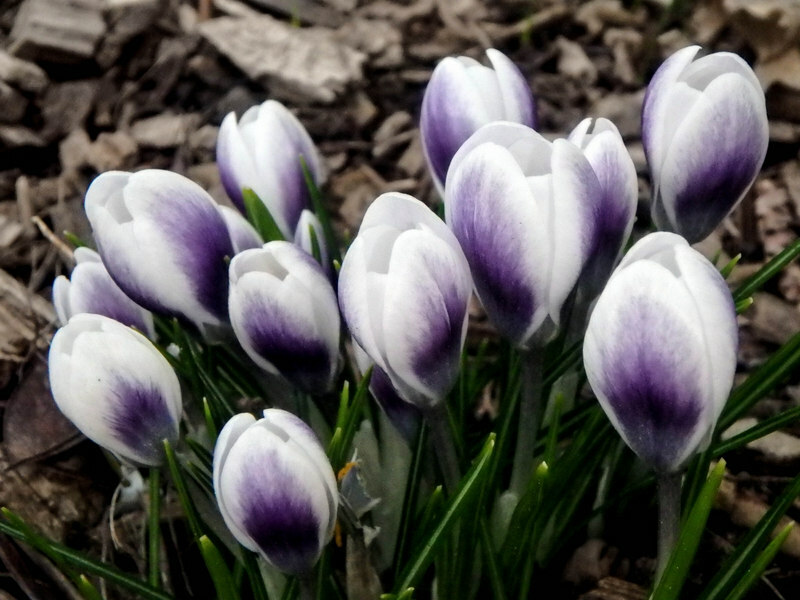 The pretty white crocuses with purple on the outsides of their petals are still blooming but this will probably be the last time we’ll see them this year. 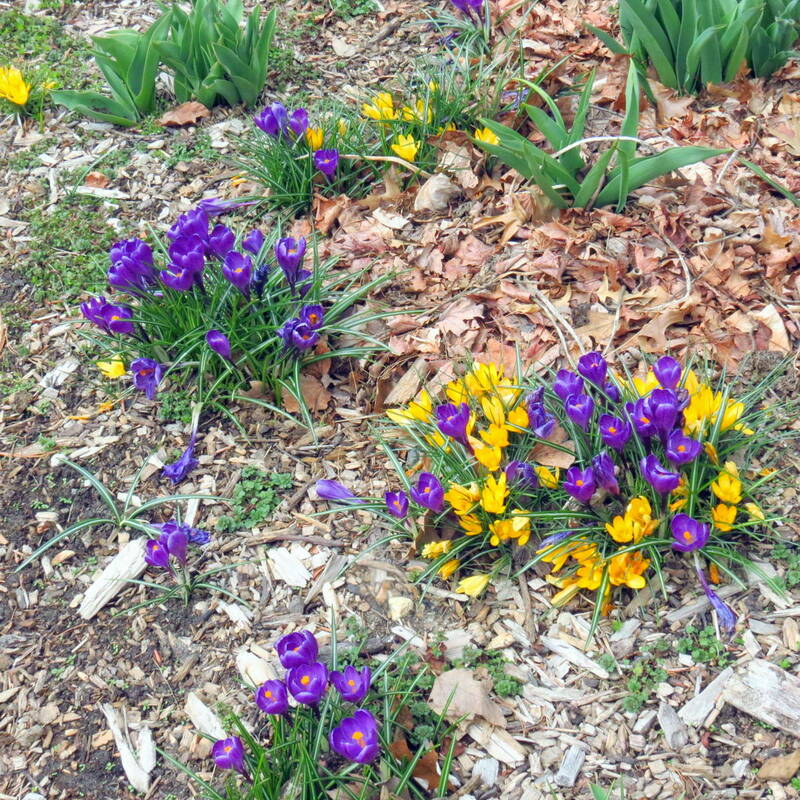 Last week I saw a bed with hundreds of crocuses blossoming in it and by this week they had almost all gone by. 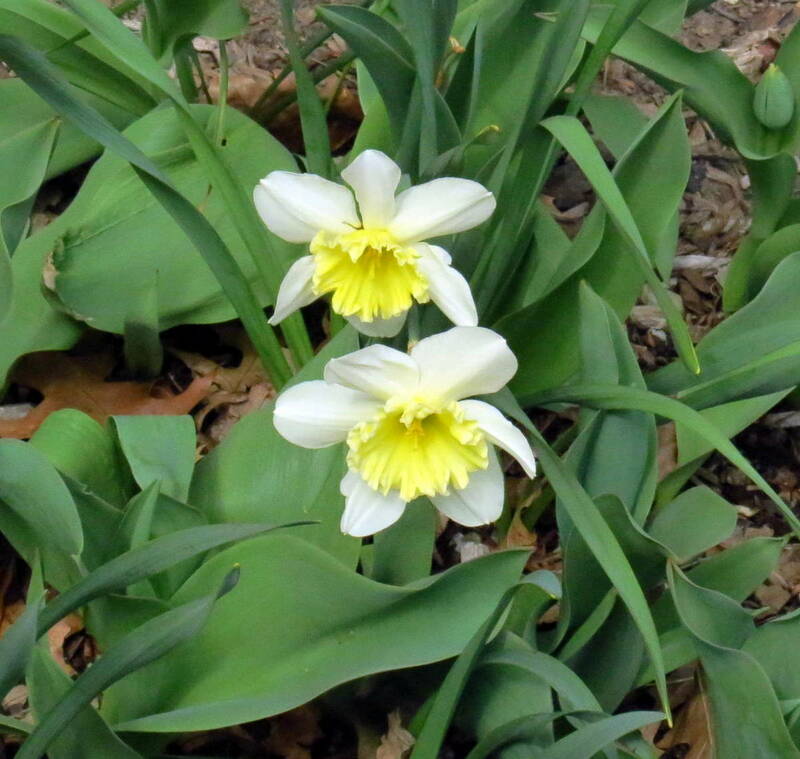 Daffodils of all color combinations have just started blooming. 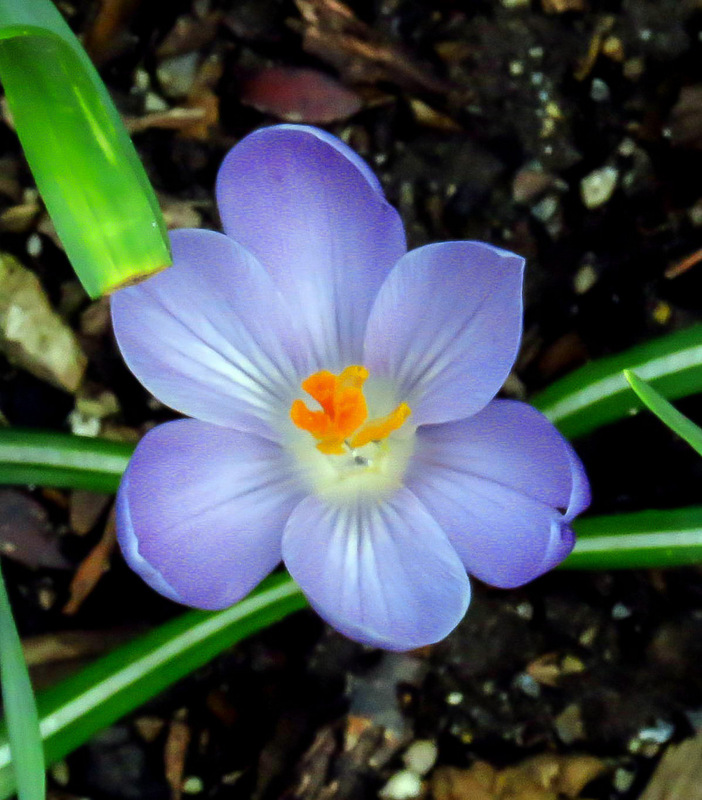 As I said earlier I’m afraid it might be time to say goodbye to crocuses already so I’ll end this post with this little beauty. For a flower that is with us for such a short time their impact seems huge. They’re another flower that it’s hard to imagine going without in spring. 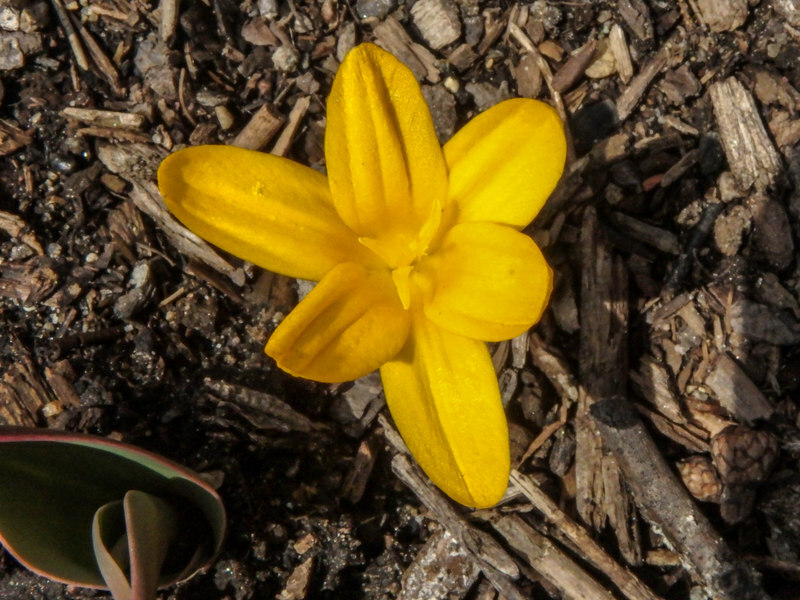 There were two things I wanted to know last weekend; were turtles active yet and were trout lilies blooming. 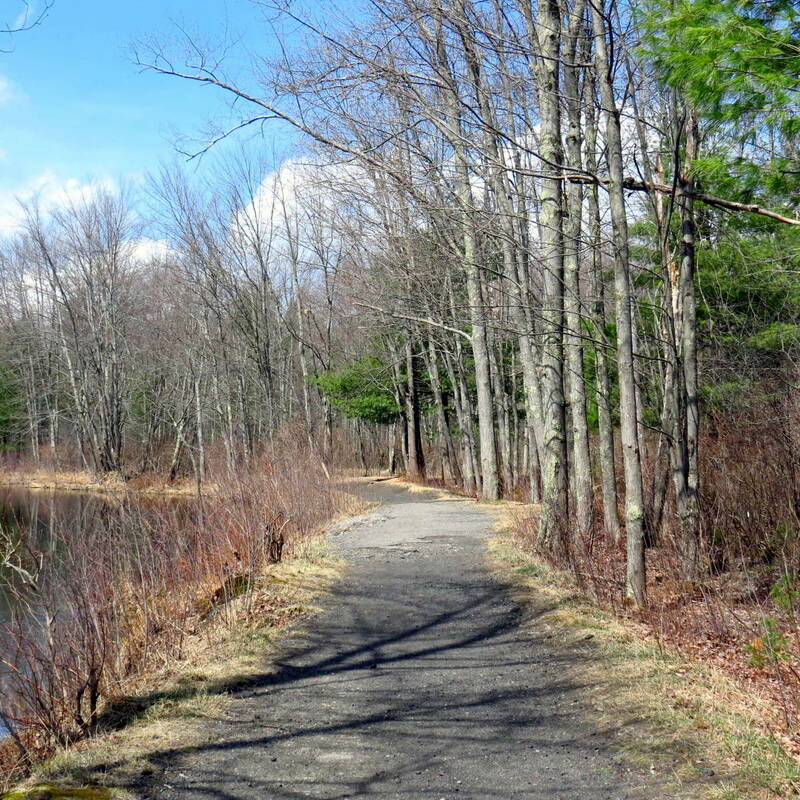 I couldn’t think of anyplace better to answer those questions than along the Ashuelot River, so last Saturday off I went along one of my favorite riverside trails. 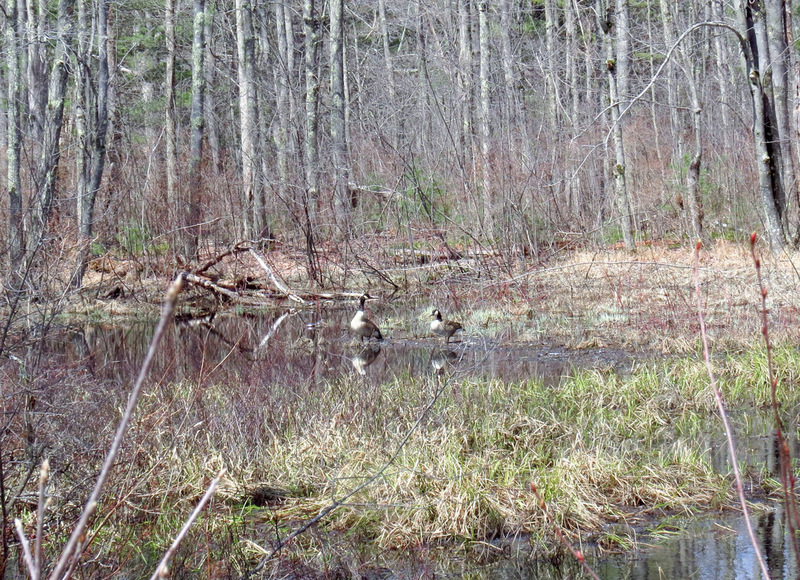 The water was quite high, probably from snow still melting in the higher elevations. 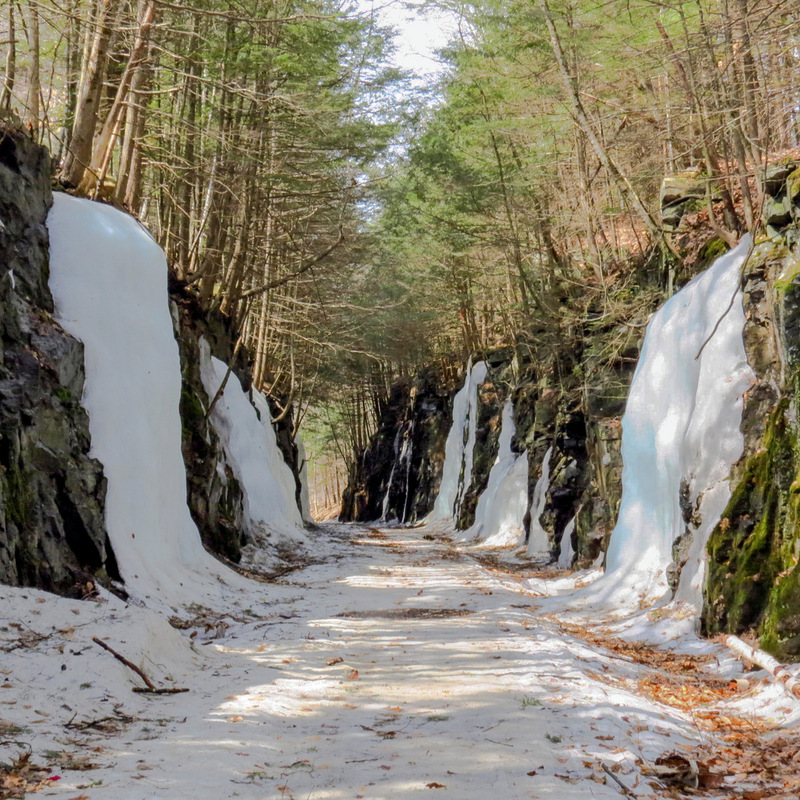 Snow is still chest deep in the northern part of the state and they’re still having avalanches in the White Mountains, so reports have said. 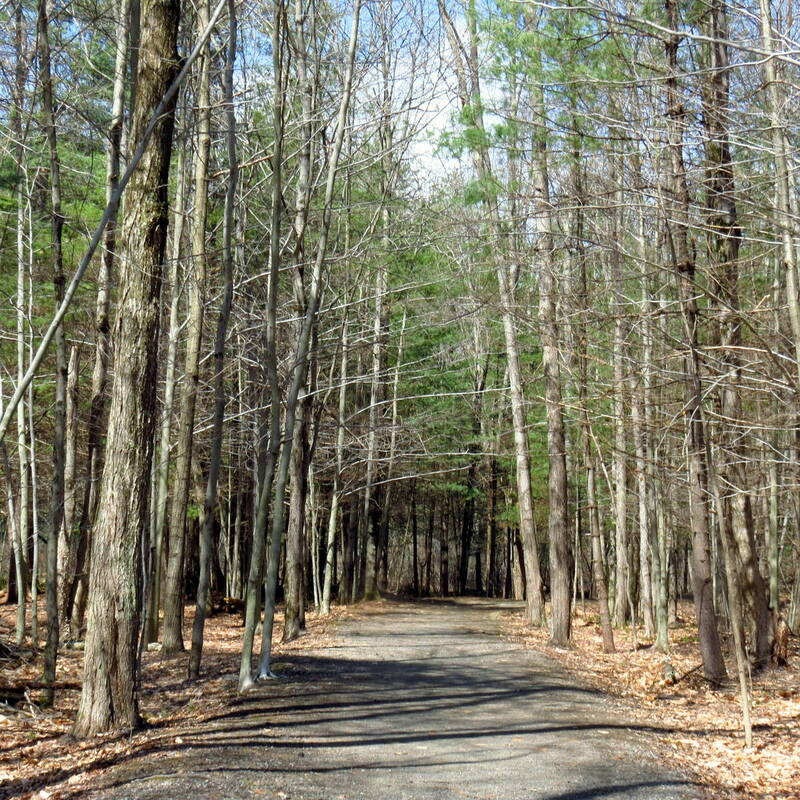 I’ve been walking this trail for over 50 years so I know it well. 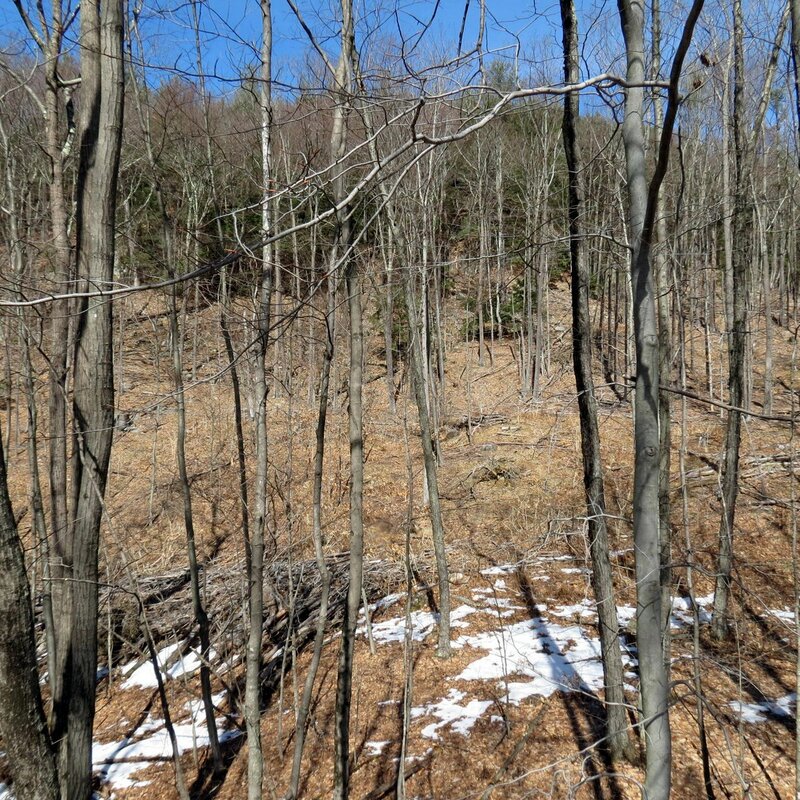 There used to be a small wooden hut up ahead where that paved spot is. It had an open front facing the river and a bench to sit on, almost like a bus stop. It was made of wood so of course every young boy with a pocket knife had to come here and carve their initials into it, including me. 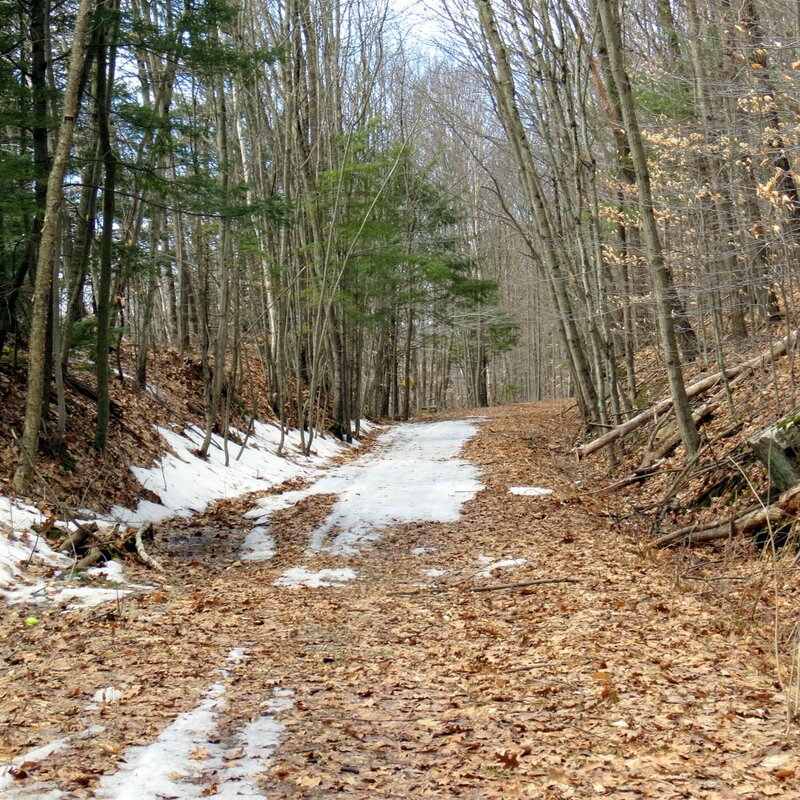 I’ve wondered for years why it was there because in the 1960s this trail saw very little traffic. Traffic or not the trail was here and I think that it’s been here for quite a lot longer than I’ve been around because I think it was originally used by Native Americans. It’s close to many shallow areas in the river and there are lots of places to fish. 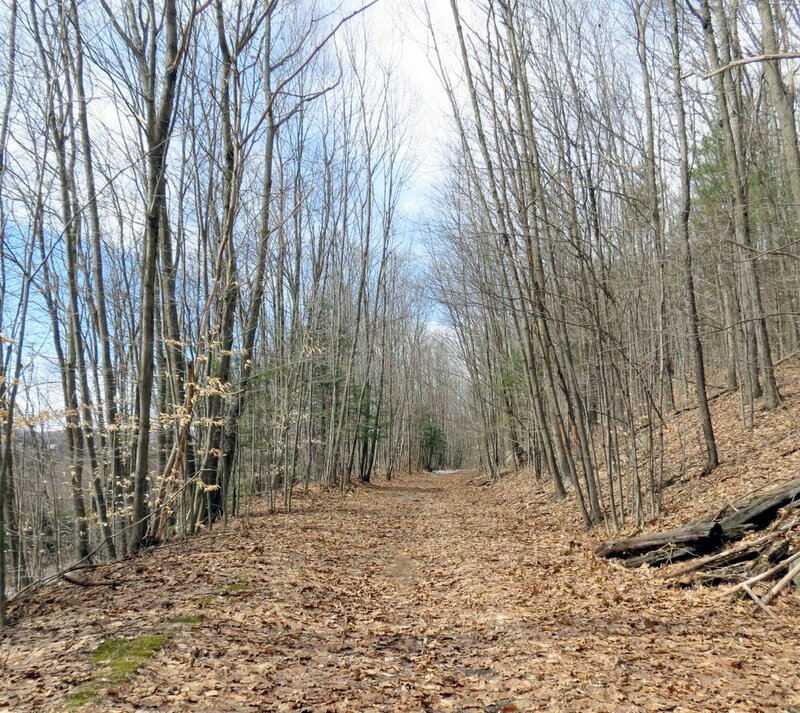 It seems like it would be perfect for someone who lived off the land. 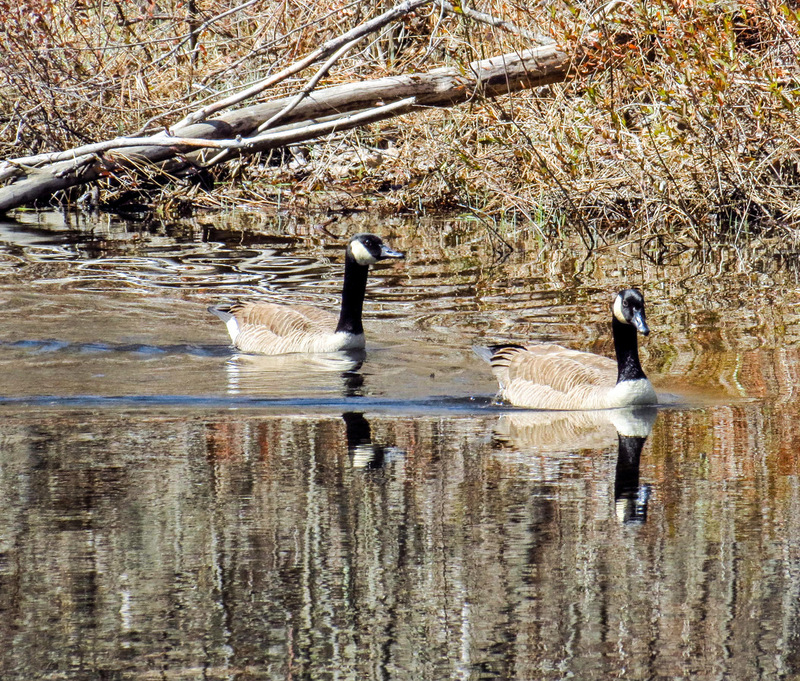 A pair of Canada geese chatted quietly off across a setback. My question of active turtles was answered quickly. 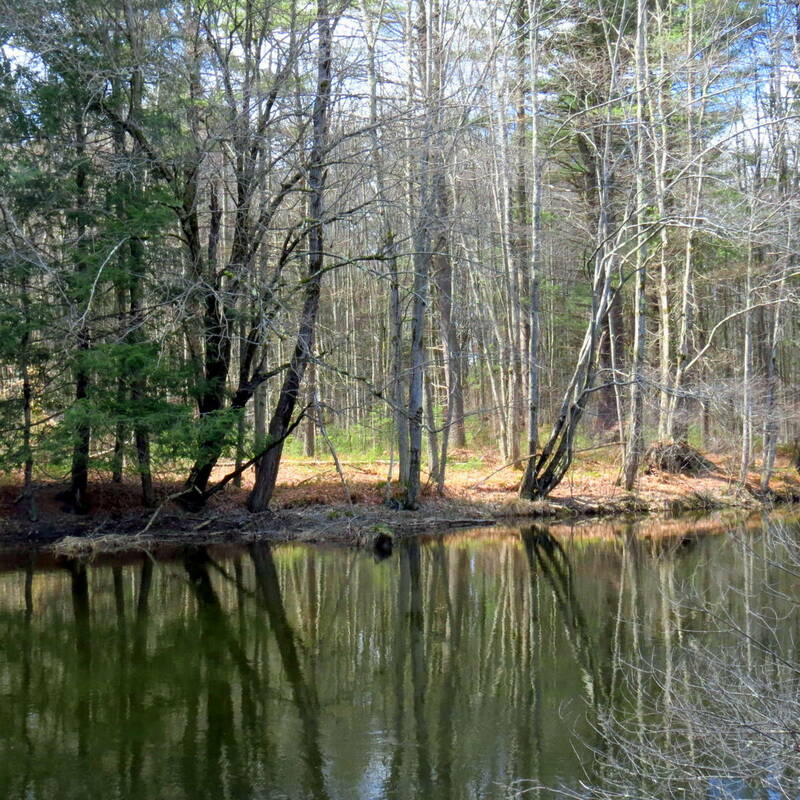 I also heard toads and tree frogs out here, as well as the little frogs we call spring peepers. It was great to hear them again. I wanted to get a better view of this turtle so I walked on, hoping for a side shot. 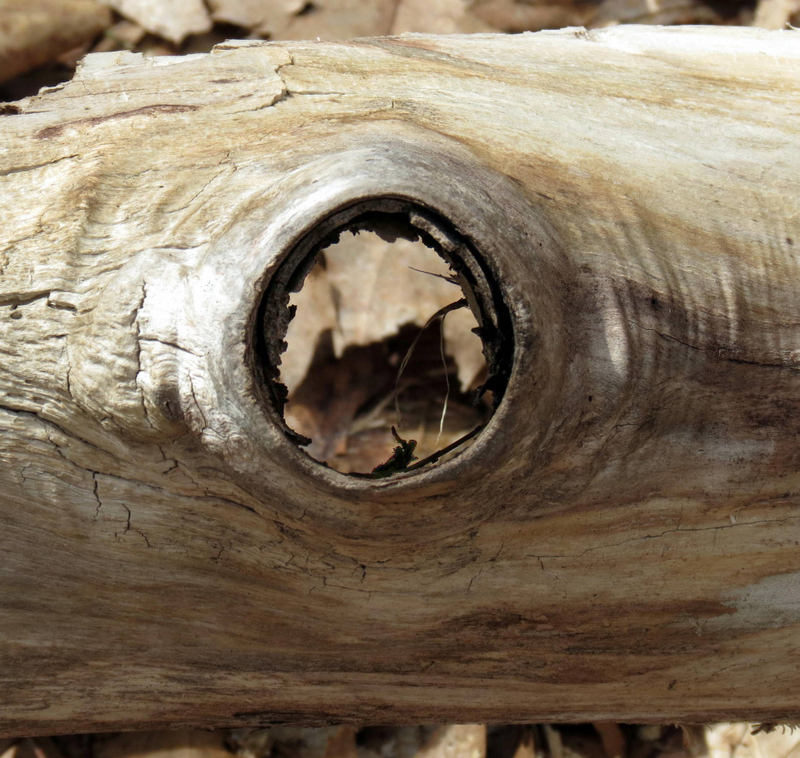 But all that was left was the log the turtle sat on. Not a very interesting subject. I thought I had scared the turtle away but then I saw those two geese come steaming up the river and I wondered if they were what the turtle was afraid of. 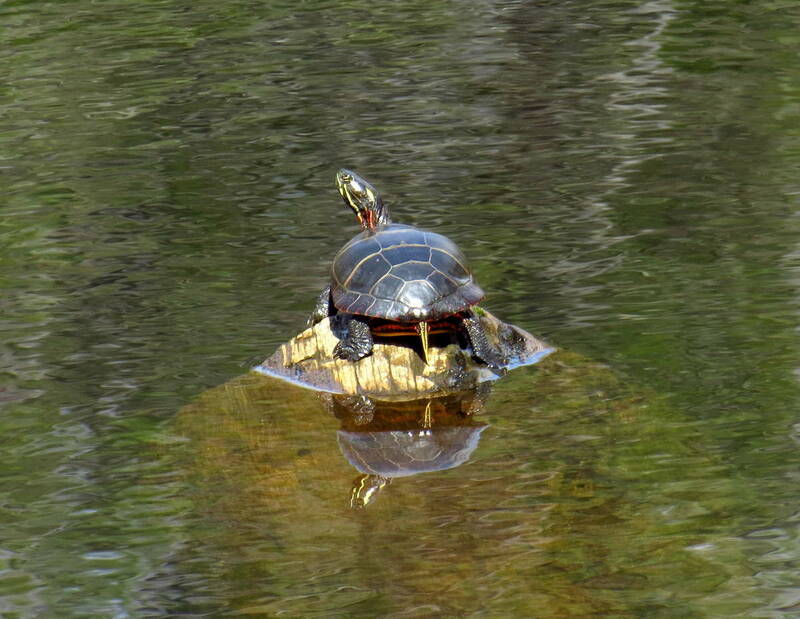 Do geese bother turtles? I don’t know the answer to that one. It’s a question that would require much sitting and watching to answer. The geese weren’t afraid of me. In fact they followed along beside me as I went on. Maybe they thought I had a pocket full of bread. A couple of young boys on bikes came along, saw the geese and dropped their bikes. 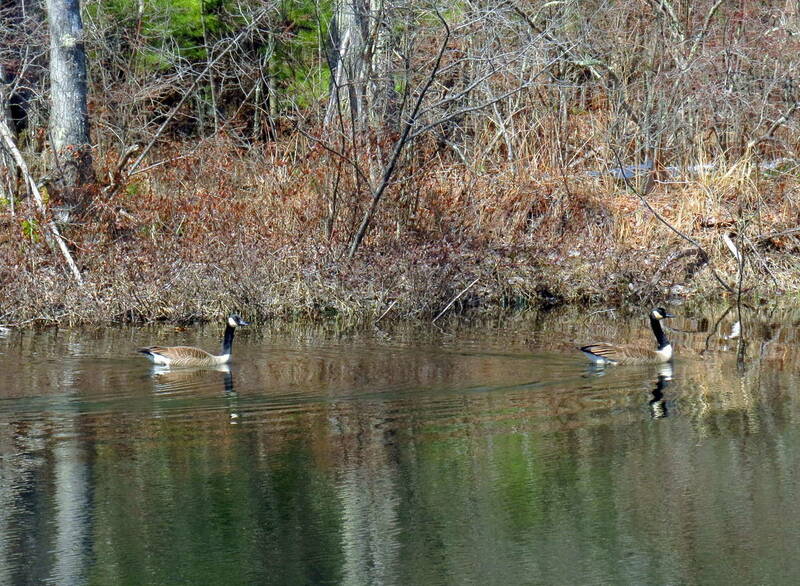 Once the geese saw them sit on the river bank they swam right over. Whether or not the boys had bread for them I don’t know. 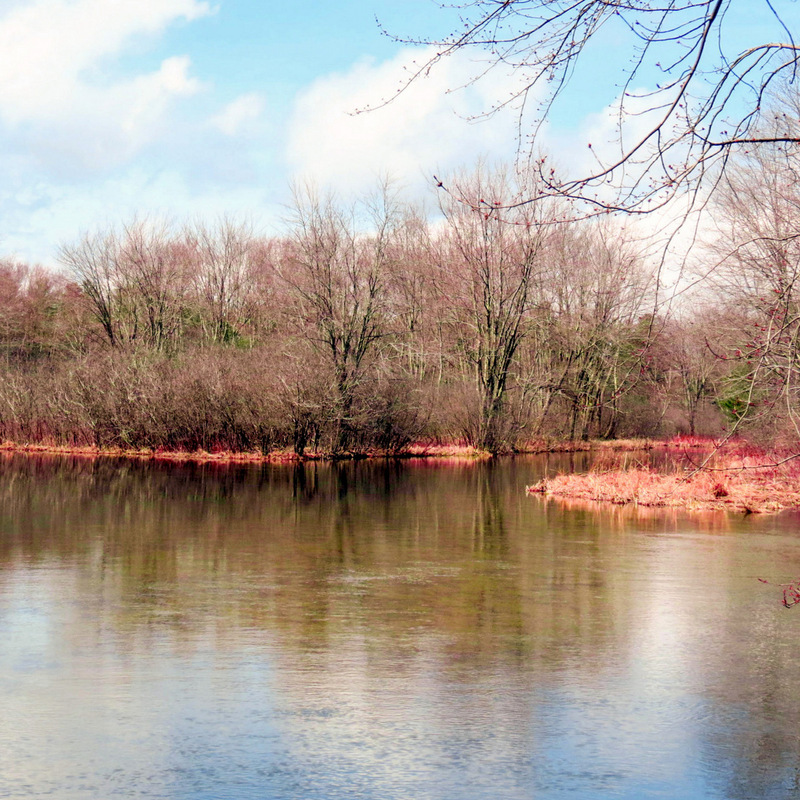 It was a beautiful day but at 70 degrees F. it seemed warm and I was glad I hadn’t warn a jacket. The shirts I had on were plenty warm enough. There were lots of insects out but I didn’t get bitten by any of them. 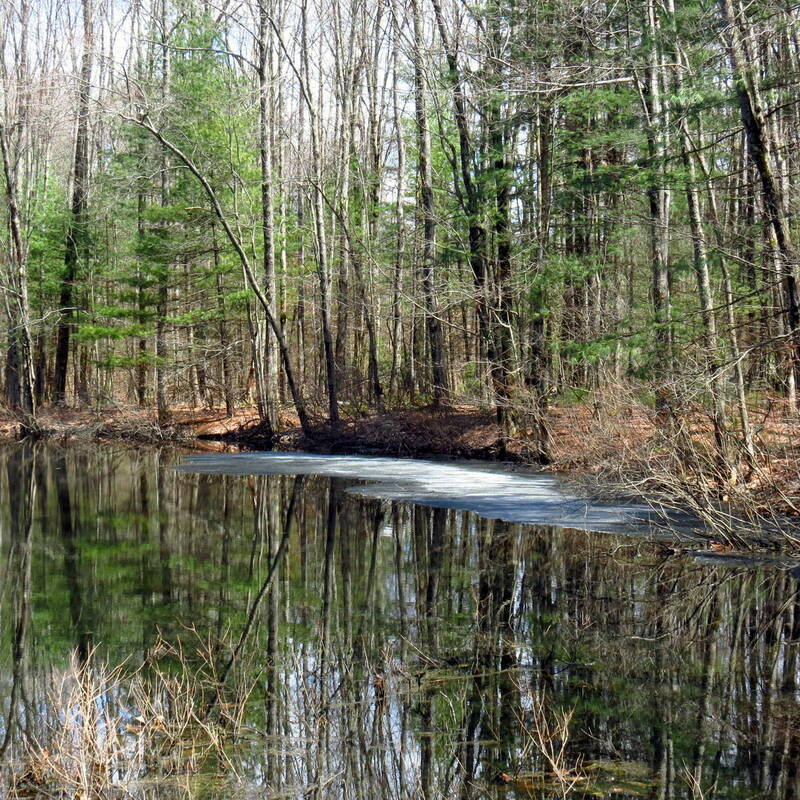 There was still ice to be found in cool, shaded backwaters but the frogs were active and chirping even in places that still had ice. A couple of posts ago I showed a papery trumpet shaped stem and wondered what it was. Luckily reader Eliza Waters recognized them and said they were jewel weed (Impatiens capensis) stems. I knew a lot of jewel weed grew in a spot along this trail and when I got there sure enough, there they were. Thanks again Eliza! Each stem is about a foot tall and has a trumpet shaped opening that looks just about right for a pea to sit in. 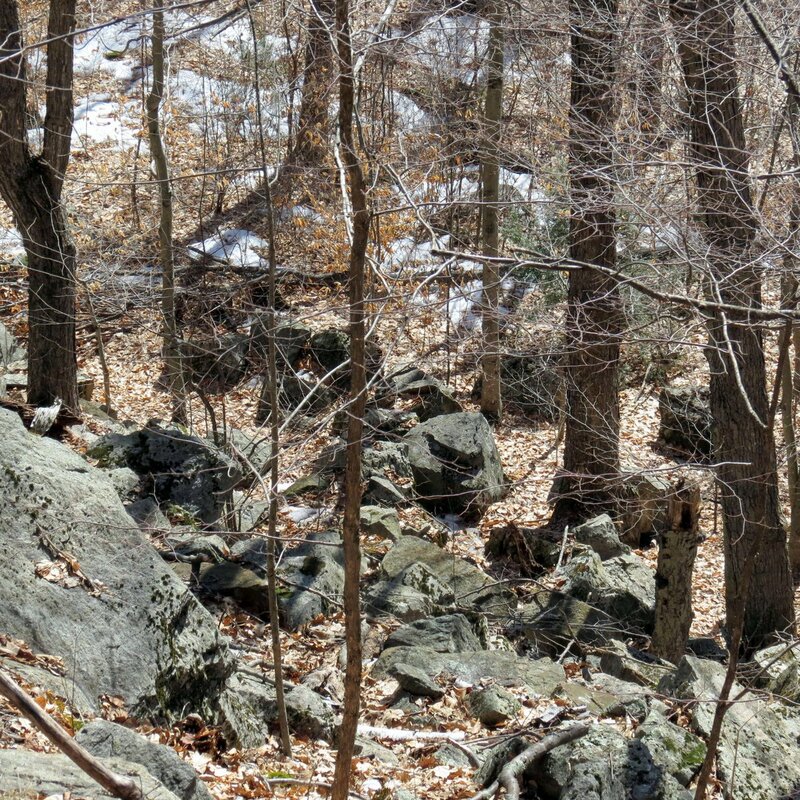 Ever since I was a young boy I’ve wondered what was over there on the other side of the river but since it probably would involve a lot of bushwhacking due to the lack of a trail, I’ve never gotten up enough ambition to find out. Maybe it’s better that way, but that glow does look inviting. I suppose it’s a good thing I never did cross the river and follow along its far side. I might have been arrested. 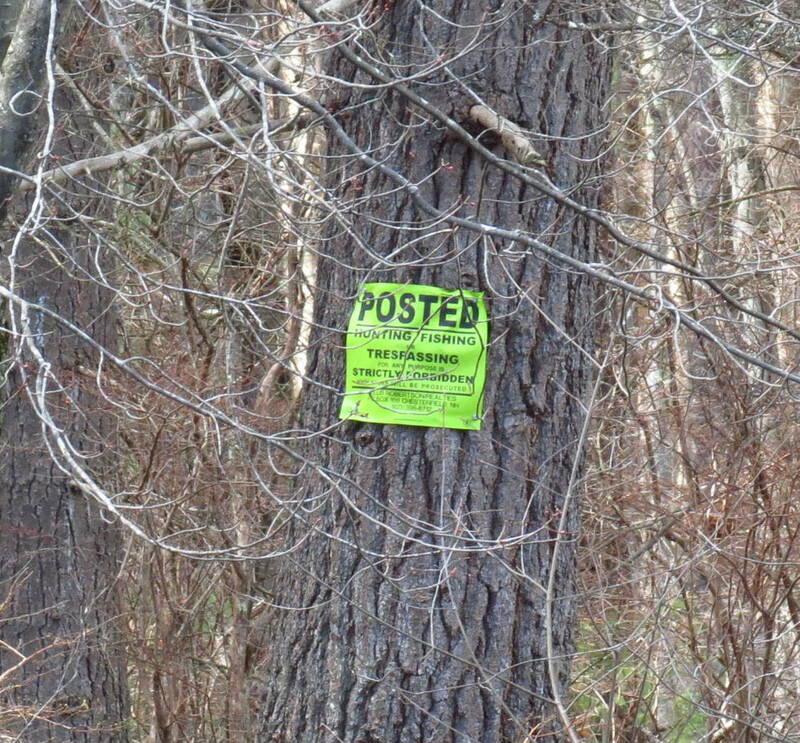 No hunting, no fishing and no trespassing pretty much covers everything. 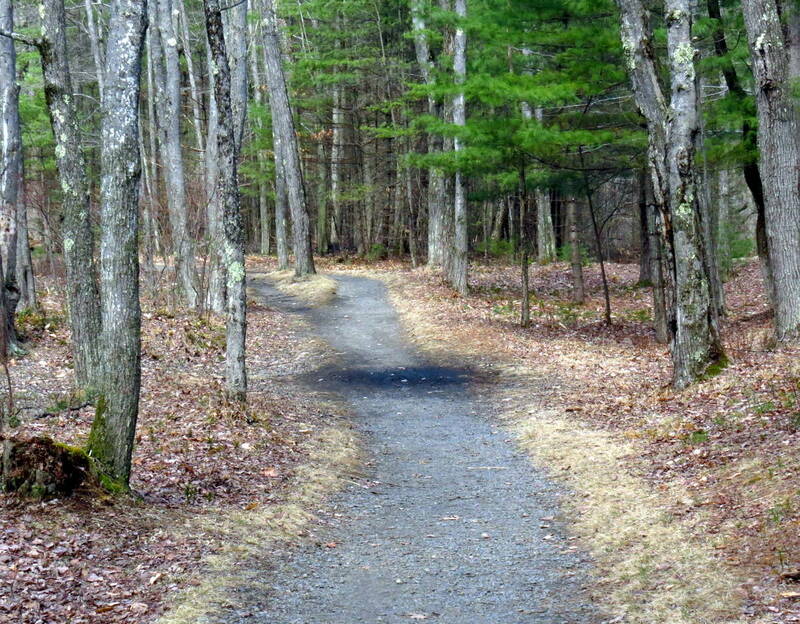 That dark spot ahead is actually a wet spot, one of surprisingly few along this trail. 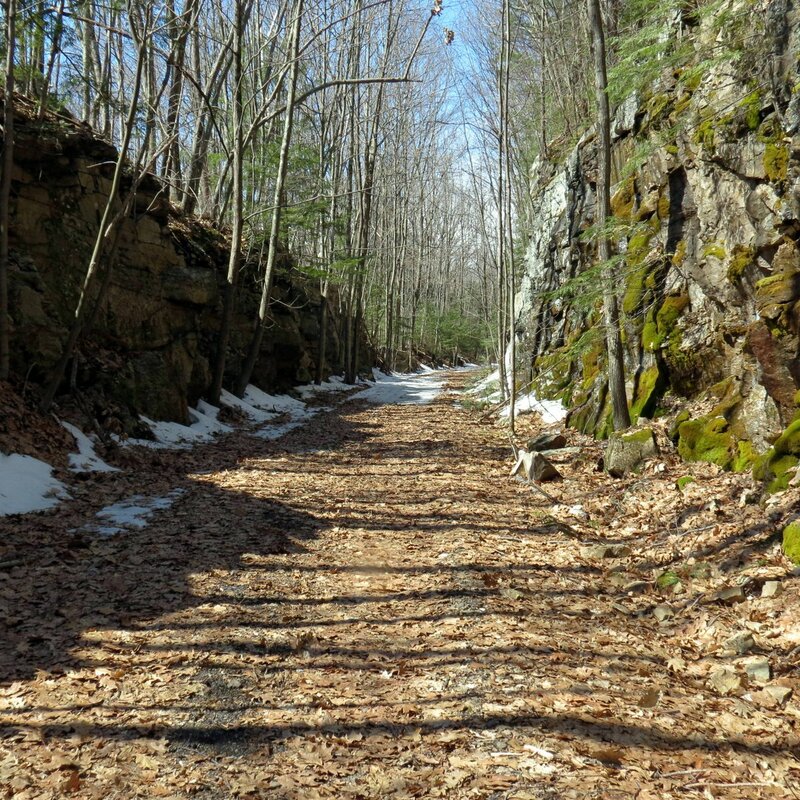 The trail through these woods isn’t that far from where the railroad repair depot used to be in Keene, and the trail is black because it was “paved” with the unburned slag from the big steam locomotive fireboxes. This slag is usually called “clinkers” or “clinker ash” and it is made up of pieces of fused ash and sulfur which often built-up over time in a hot coal fire. Firebox temperature reached 2000 to 2300 degrees F. in a steam locomotive but they still didn’t burn the coal completely. 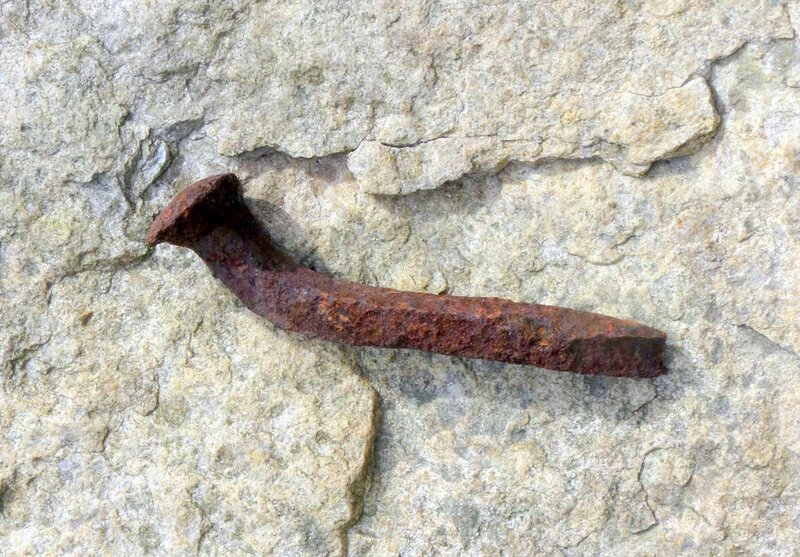 A long tool called a fire hook was used to pull the clinkers out of the firebox and in Keene we must have had tons of the stuff, because it was used as ballast on many local railroad beds. 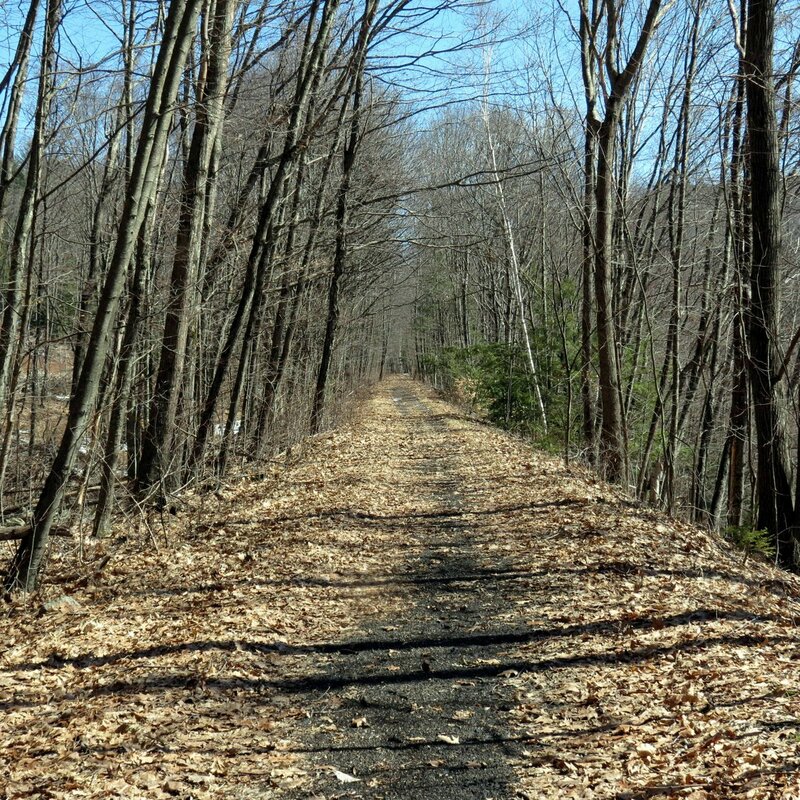 The section that ran by my house was as black as coal. 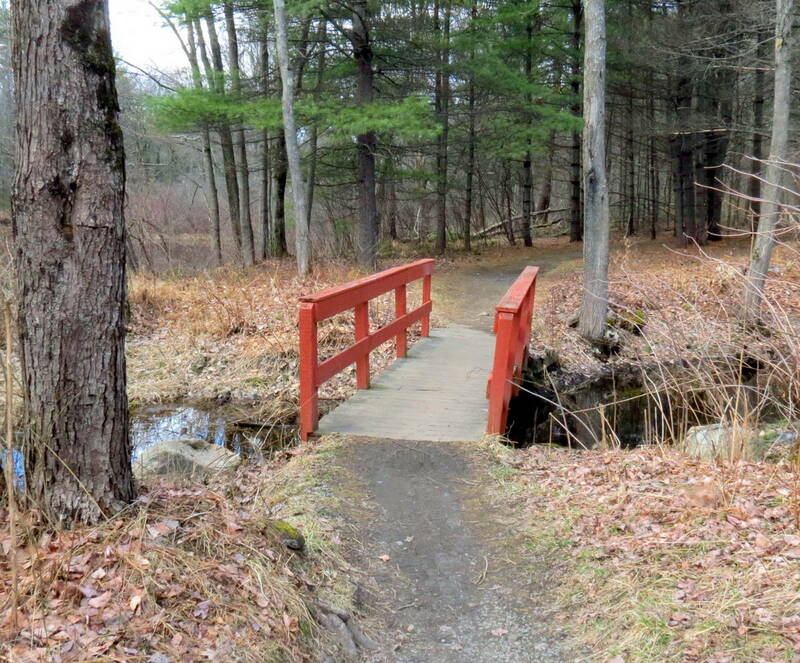 I had finally reached the little red bridge, and this was the spot where my second question would be answered. 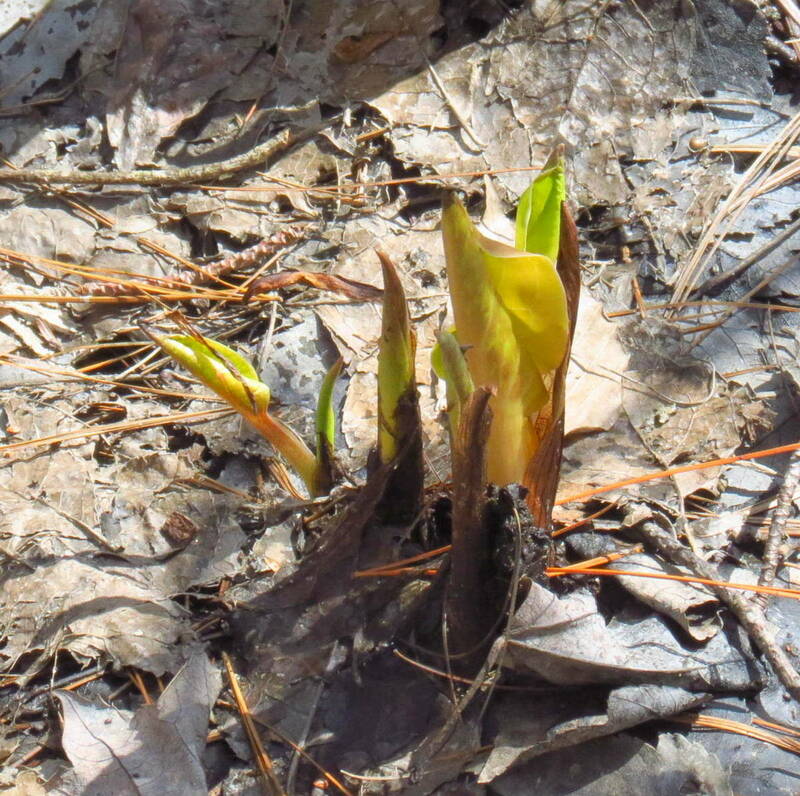 I had been to another spot where thousands of yellow trout lilies grow and didn’t see any sign of them, not even a leaf. 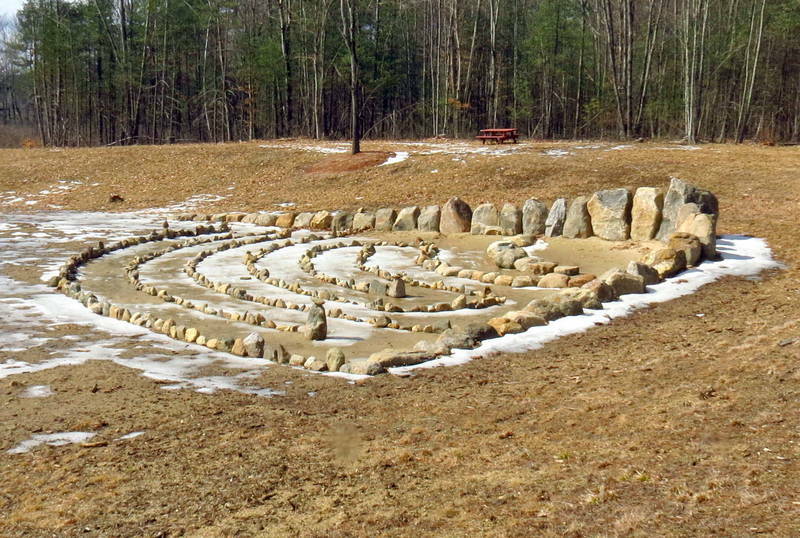 I thought this place might get more sunshine and maybe the soil warmed quicker, but there was still no sign of trout lilies. I could be rushing it though; I just discovered by looking back through the blog that April 20 is the earliest I’ve seen them. 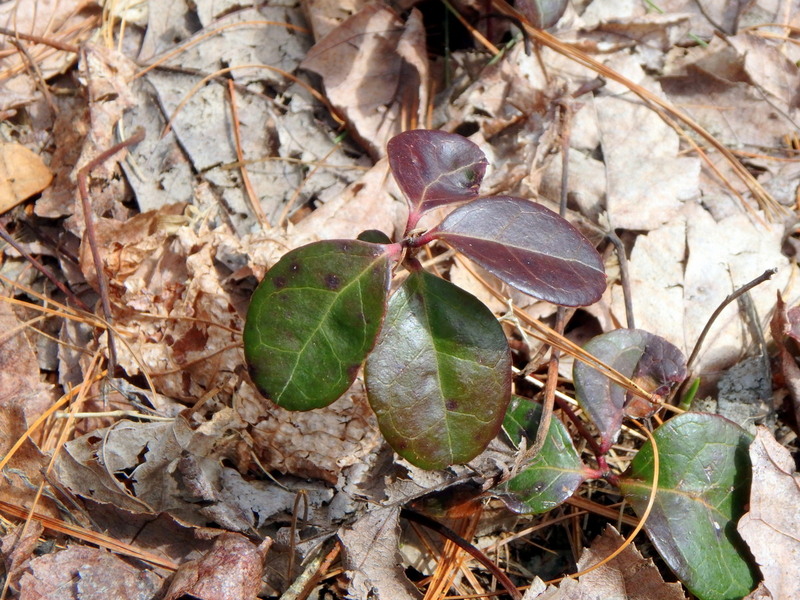 I did admire some American wintergreen (Gaultheria procumbens) The leaves are just coming out of their purple winter color and turning green so they can begin photosynthesizing again. 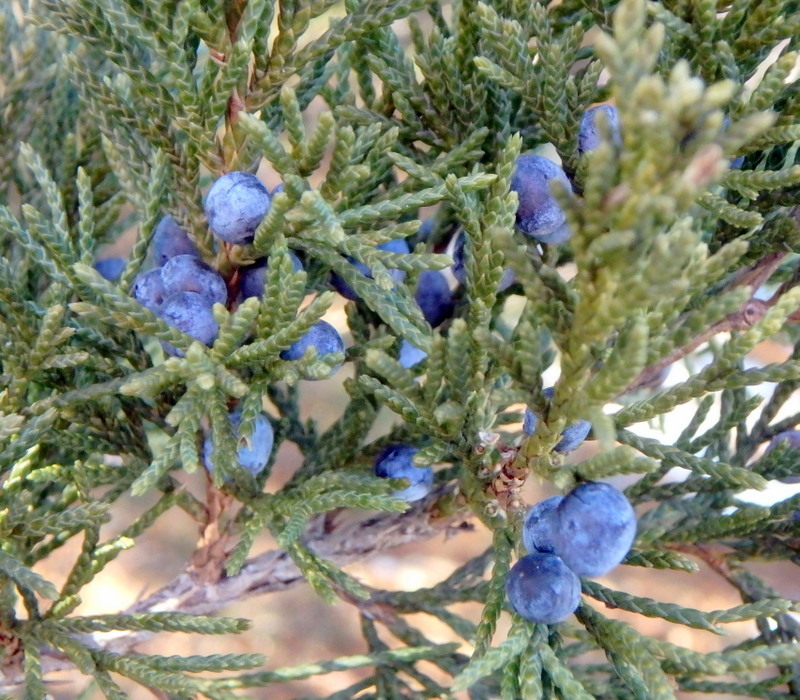 This plant is also called teaberry or checkerberry and its small white flowers resemble those of the blueberry. It is probably the easiest of all wintergreens to identify because of the strong, minty scent that comes from its crushed leaves. If you have ever tasted teaberry gum then you know exactly what it smells and tastes like. The plant contains compounds that are very similar to those found in aspirin and Native Americans used it medicinally. They also chewed the minty leaves on long hikes. Alders love water and many grow here. 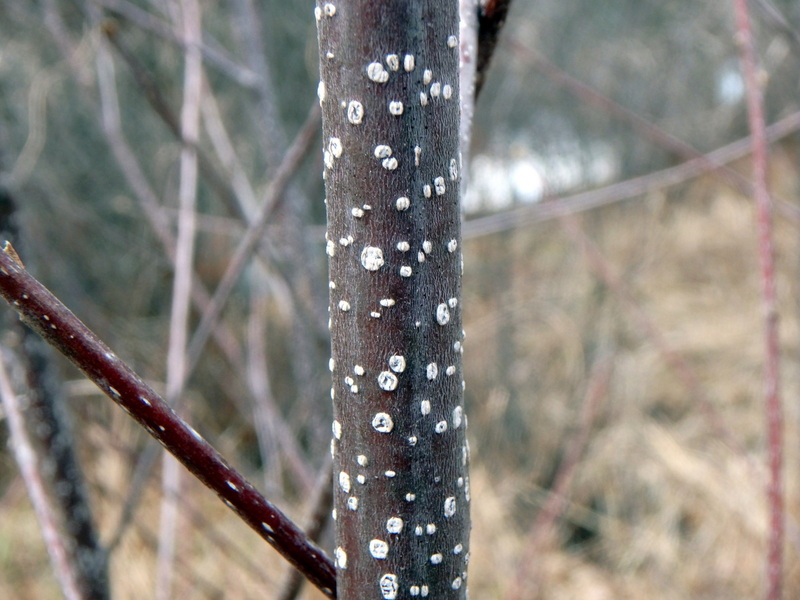 This speckled alder (Alnus incana) lived up to its name. 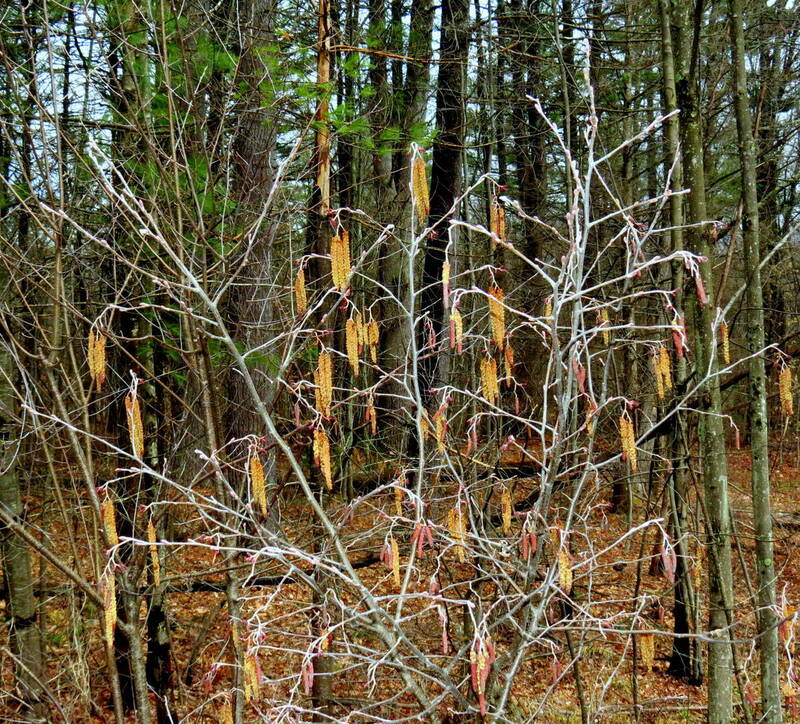 I’ve tried for a long time to show you what alders look like with all their male catkins open and dangling like jewels and with the help of a flash I was finally able to get a photo. It isn’t as easy as I thought it would be; it only took 8 years. 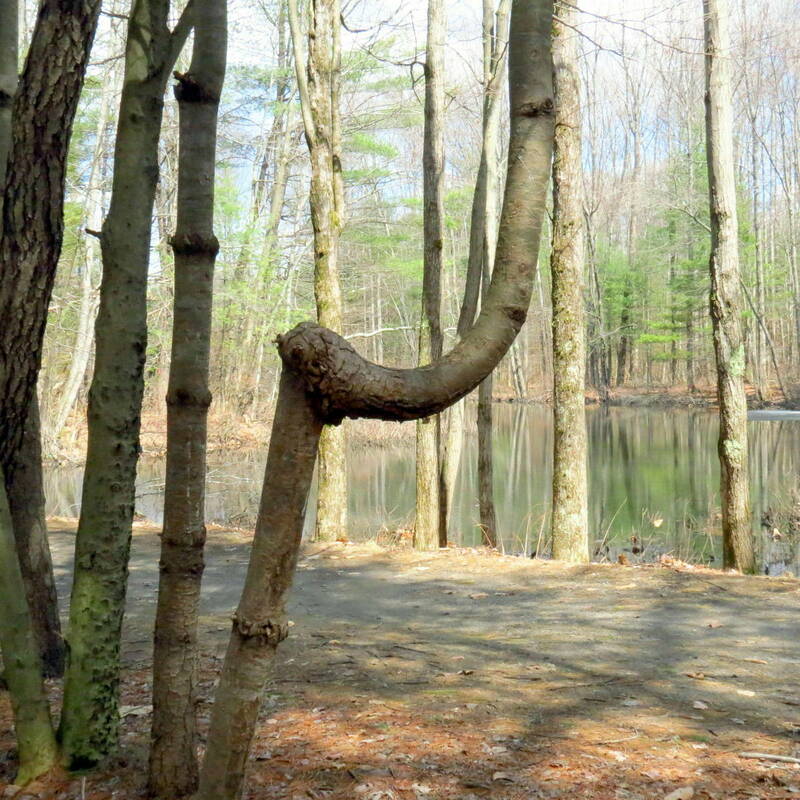 The bent tree marks a side trail that I keep telling myself I’ll have to follow one day, but I never do. I hope to have much more time for such things once I retire. 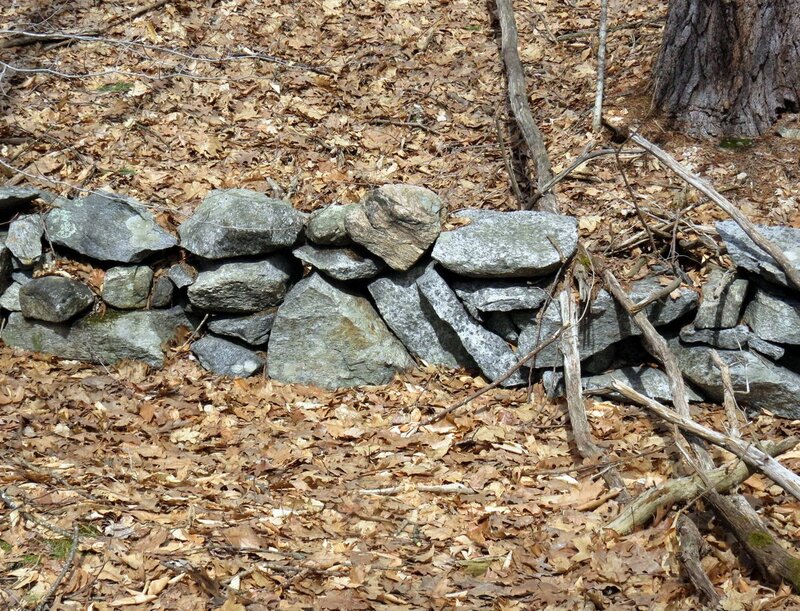 I’d love to be able to just sit in the woods again without a care like I did when I was a boy. 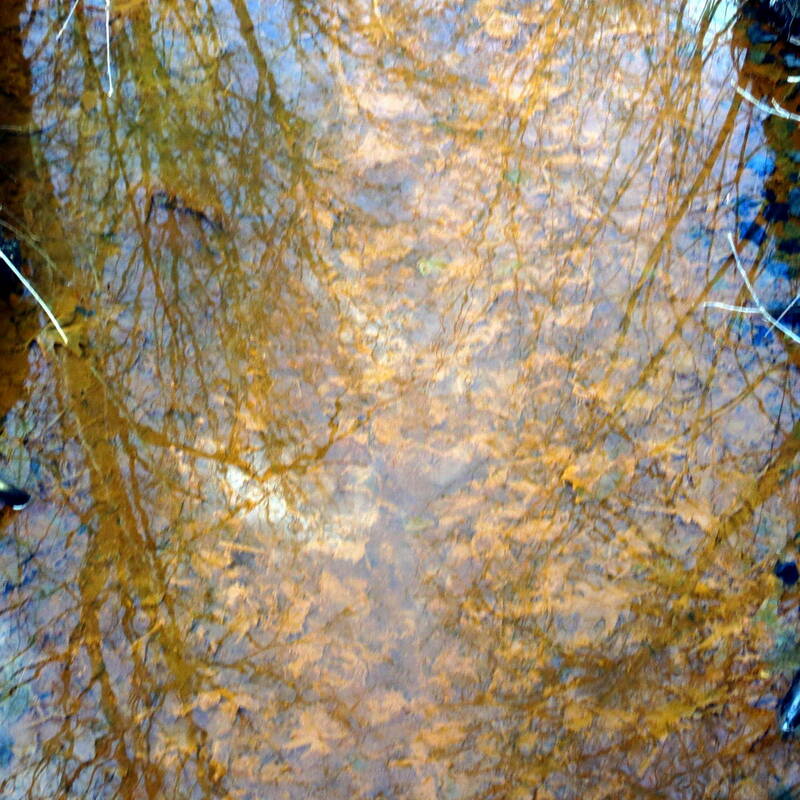 One of the many feeder streams along the trail had a lot of what looked like orange rust in its water and that’s why this photo of it looks so strange. It might be algae coloring it, or maybe last year’s decaying leaves. 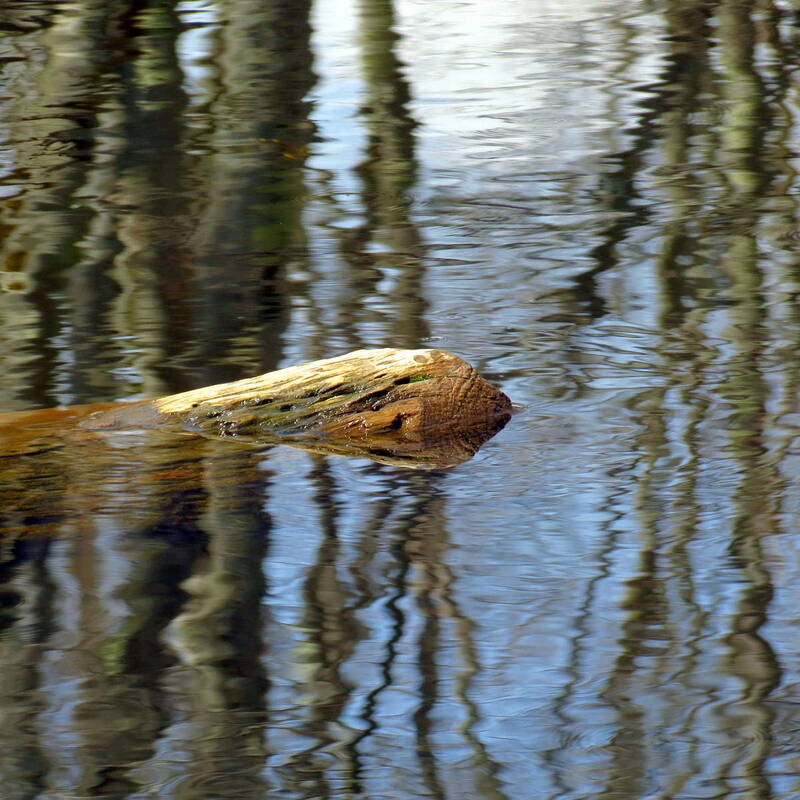 The reflections of the trees look as if they have leaves but the leaves are really on the bottom of the stream. The greatest joy is not finding something that we’ve been looking for. The greatest joy is when we’d given up on ever finding it and then it found us. 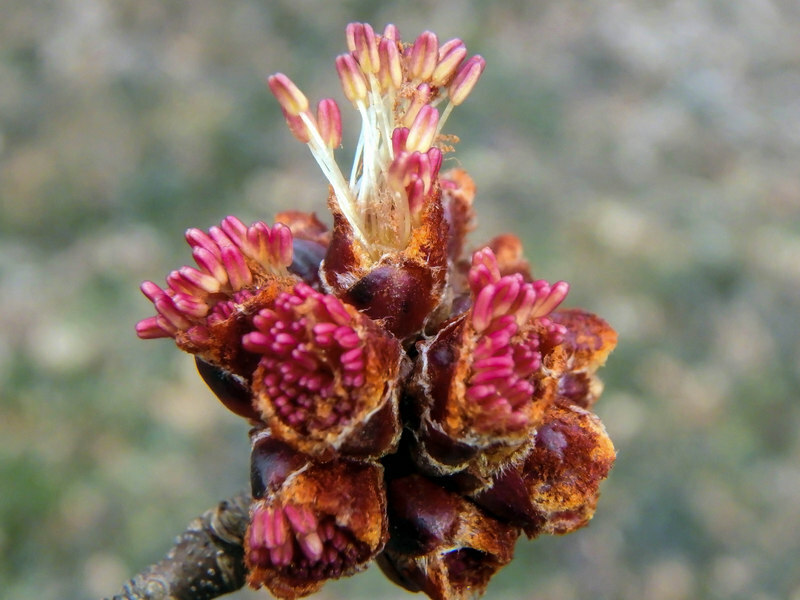 The male (staminate) flowers of speckled alder (Alnus incana) have just started opening, making the forest edges look as if someone has hung jewels from the bushes. 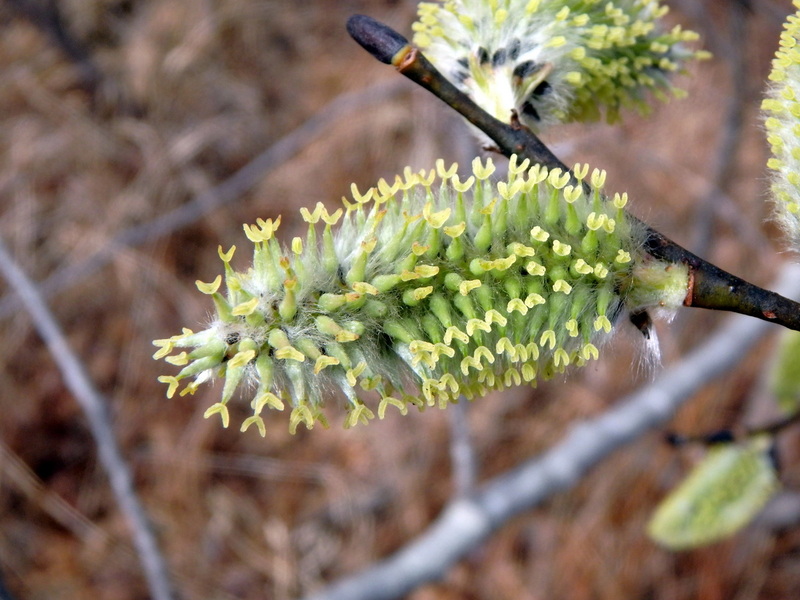 Soon they will release their pollen and start a new generation of alders. 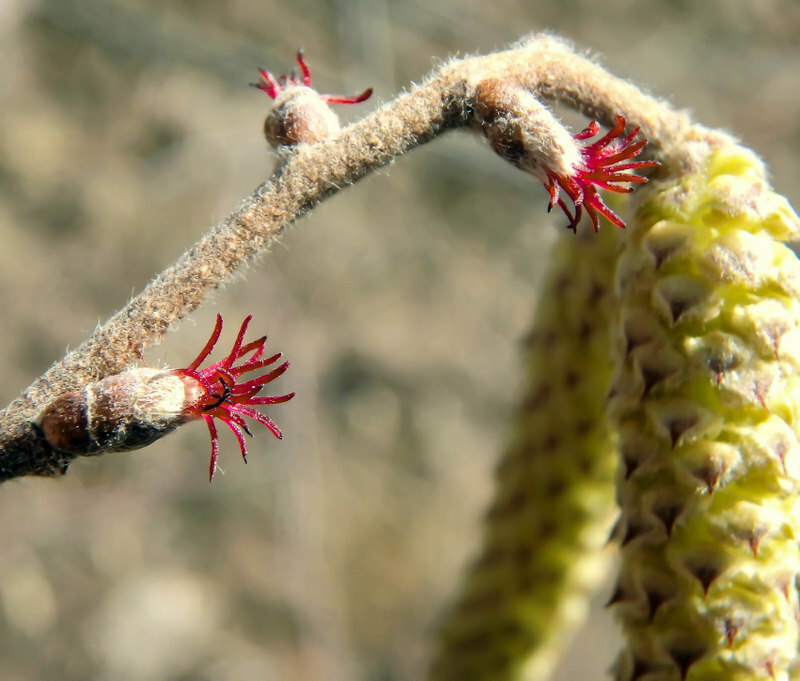 Two of these catkins haven’t fully elongated and opened, so you can see what they look like both before and after blossoming. 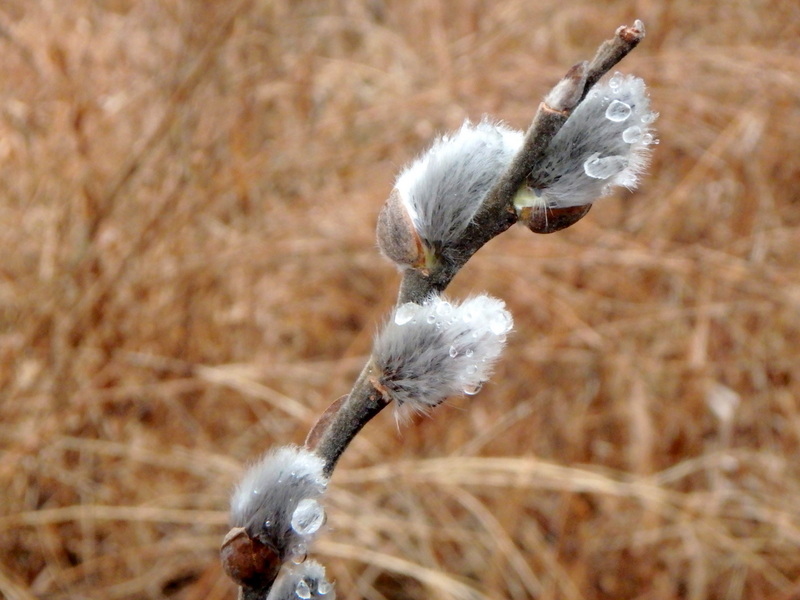 At first they are tough and rigid, almost like twigs, but when they open they’re pliable and blow in the wind. They’re quite pretty, I think. 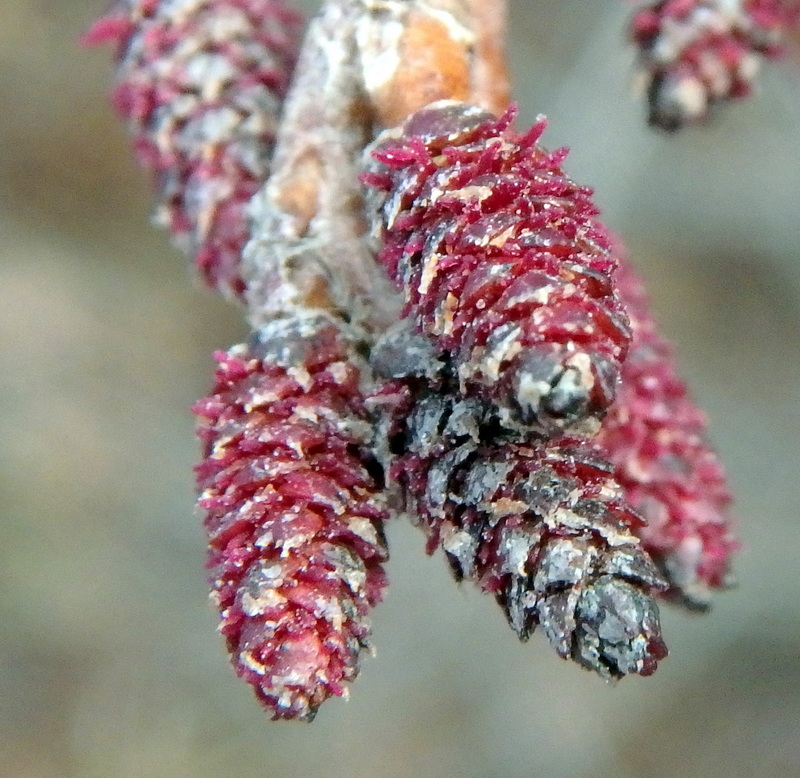 Each stalked brownish-purple bud scale on a male speckled alder catkin opens in spring to reveal three male flowers beneath, each with a lobed calyx cup and three to five stamens with anthers covered in yellow pollen. 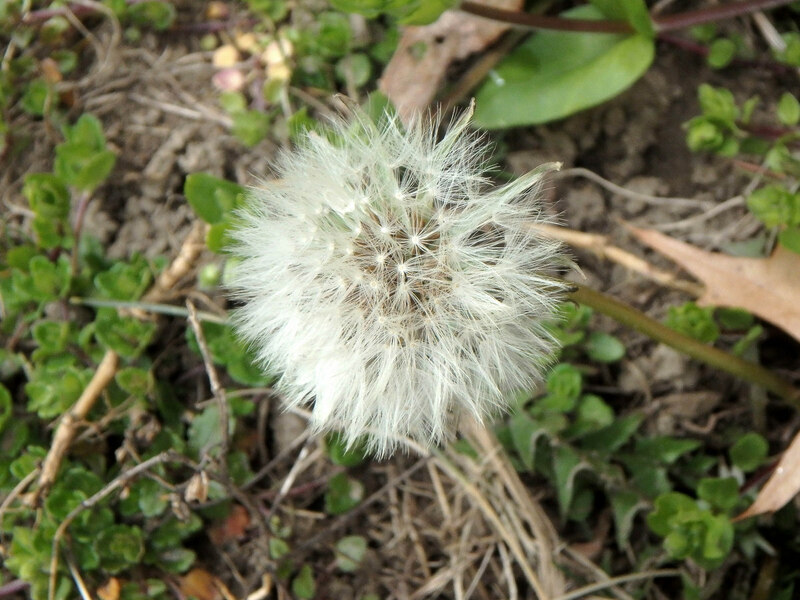 The flower parts are clearly visible in this photo but even though it is heavily cropped they are still tiny. 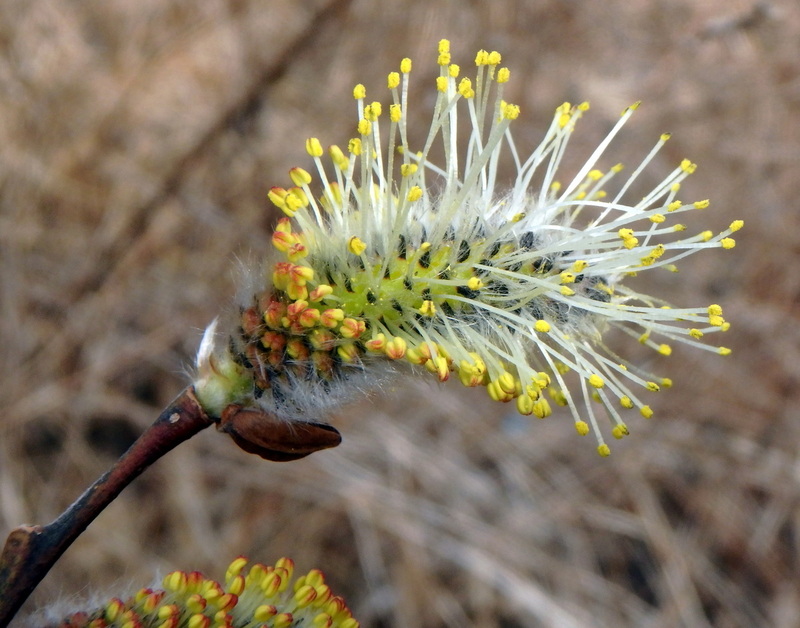 The entire catkin is only about 2 ½ inches long. 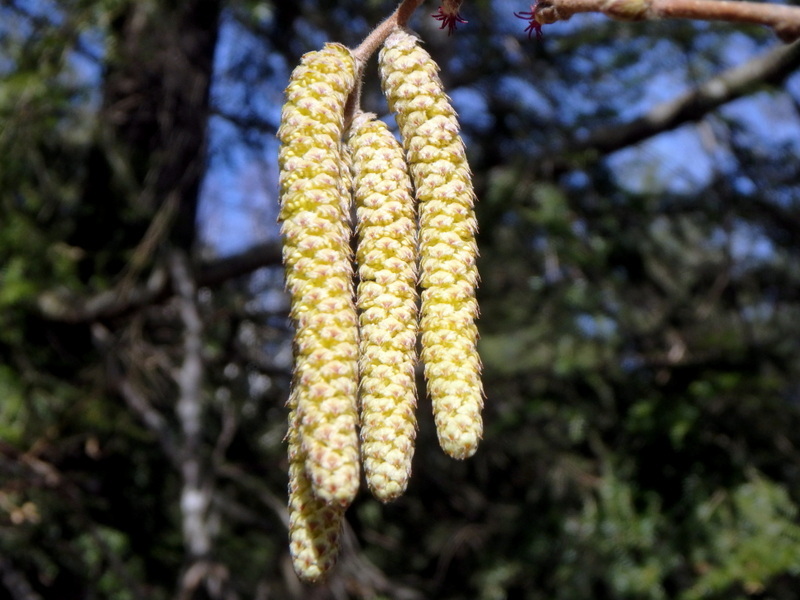 When I see the male catkins open on alders I start looking for the female flowers. 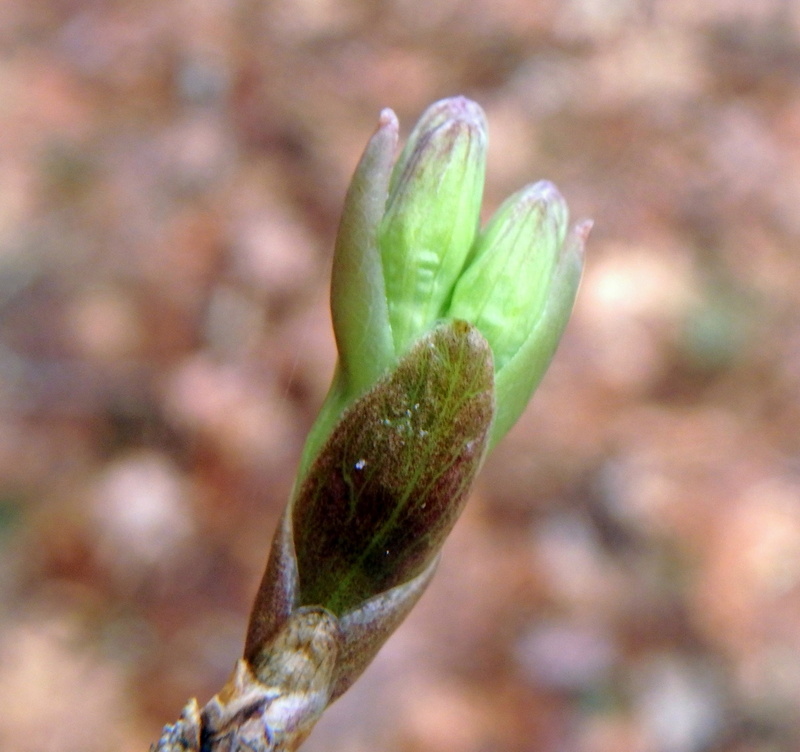 In this photo the tiny scarlet female stigmas poking out from under the bud scales are hard to see. The whitish material is the “glue” the plant produces to seal each shingle like bud scale against the wet and cold winter weather. If water got under the bud scale and froze it would kill the female blossoms. 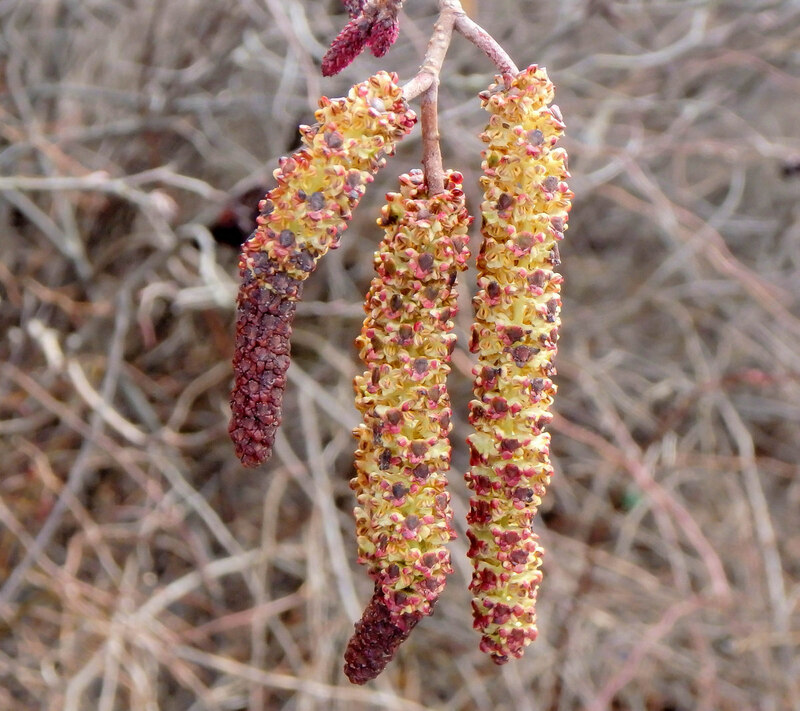 When pollinated each thread like female stigma will become a small cone like seed pod (strobile) that I think most of us are used to seeing on alders. 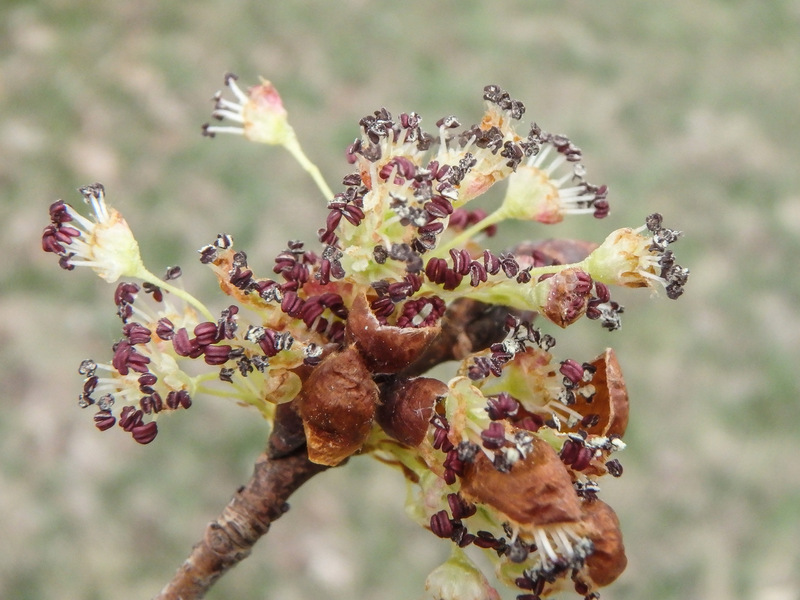 These female flowers are just threads and aren’t much bigger than female hazelnut flowers. 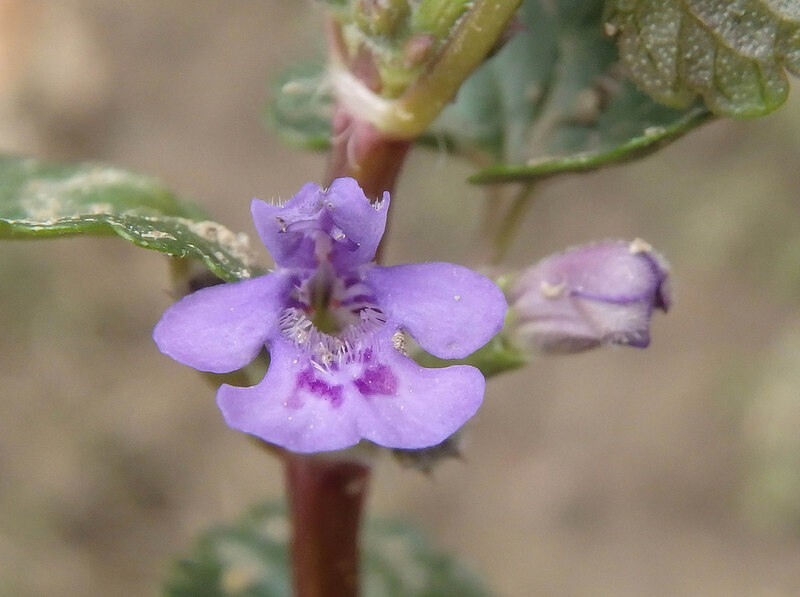 Ground ivy (Glechoma hederacea) has come along all of the sudden and I’m seeing flowers by the hundreds in some places. 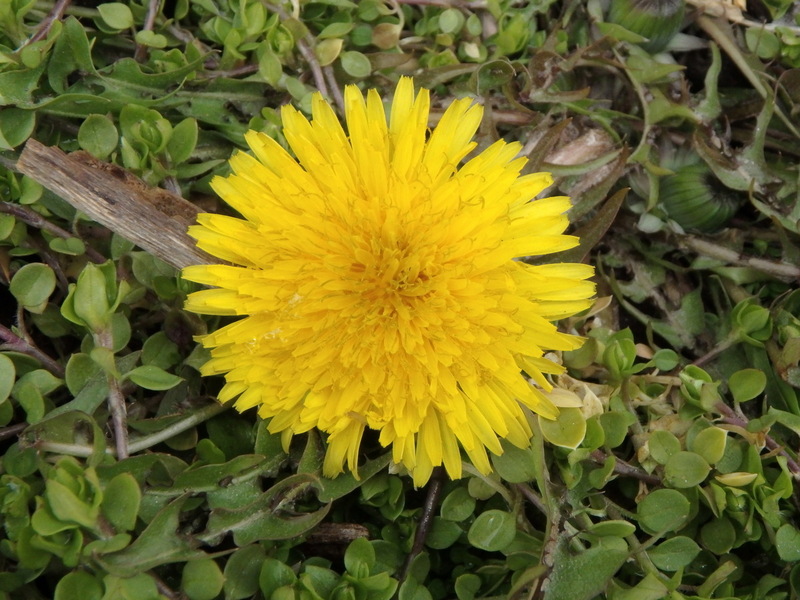 It’s a pretty little thing which can also be invasive, but nobody really seems to care. 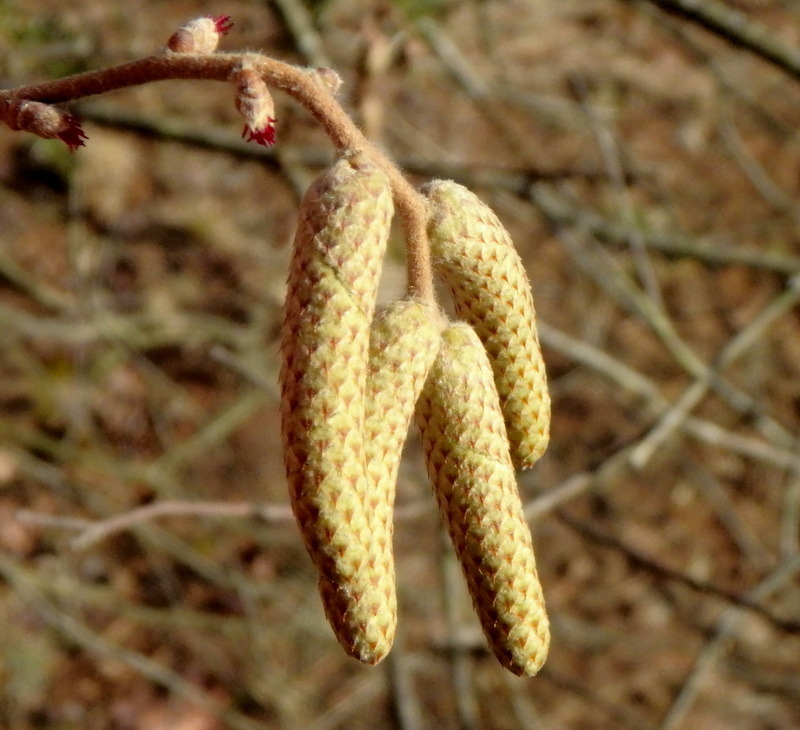 American hazelnuts (Corylus americana) are still blooming, as this shot of the female flowers shows. 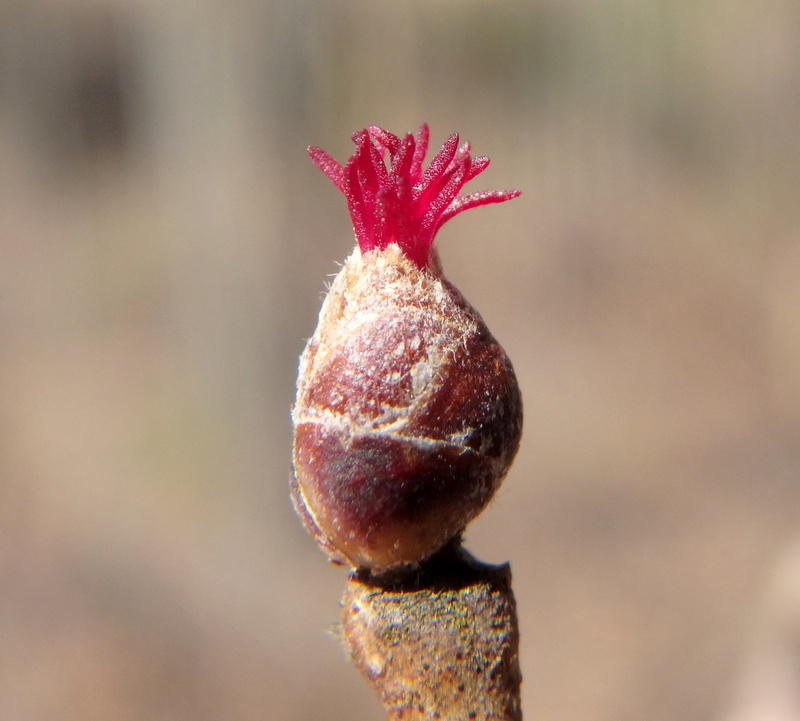 What’s odd about this bud though is that it is terminal, and sits at the end of a twig. I think this is the first time I’ve ever seen this. 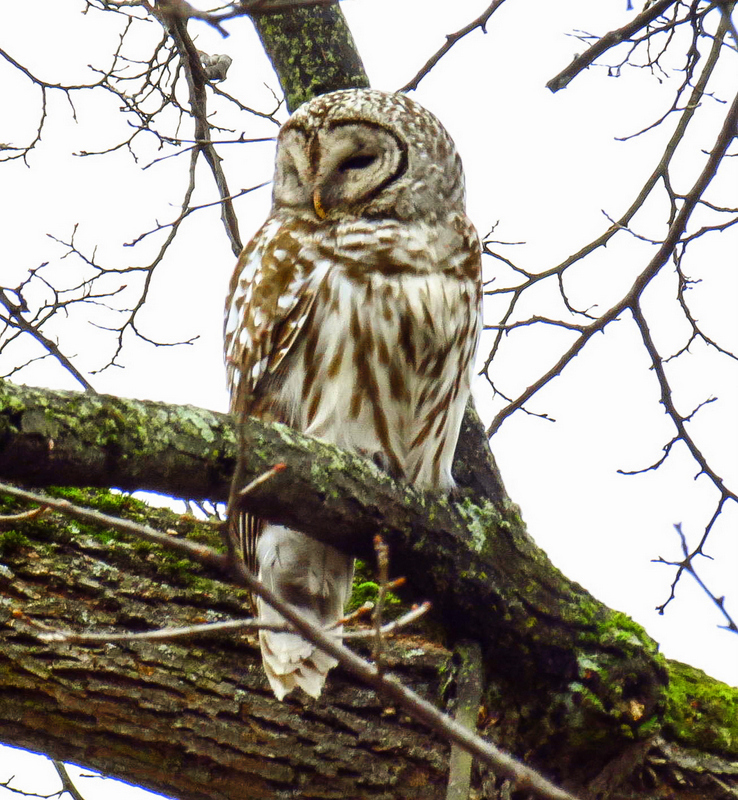 They usually appear along the length of the branch at an angle. Each tiny bud is about the size of a cooked piece of spaghetti, so that should tell you how small each scarlet, thread like female flower is. 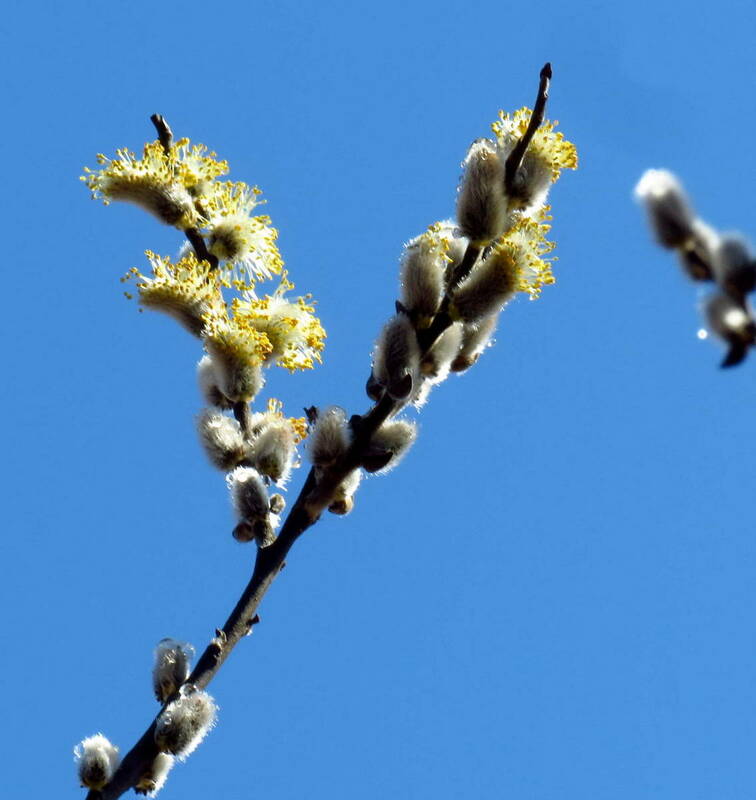 I saw some willow flowers way up high at the top of the tree, far out of reach of a macro lens. I never knew that willows went from the top down so it was an interesting find. 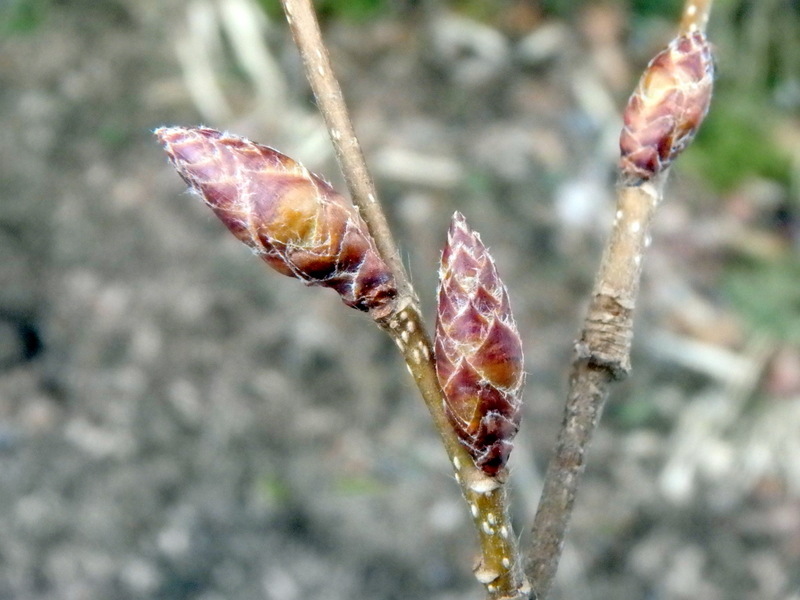 The willows I could reach were still in the bud stage. Though I’ve never experimented with it I’ve always been fascinated at all the uses willows have. They contain a compounds similar to those found in aspirin and Native Americans used them for everything from pain relief to basket weaving. They even used the twigs to make fish traps and dolls. 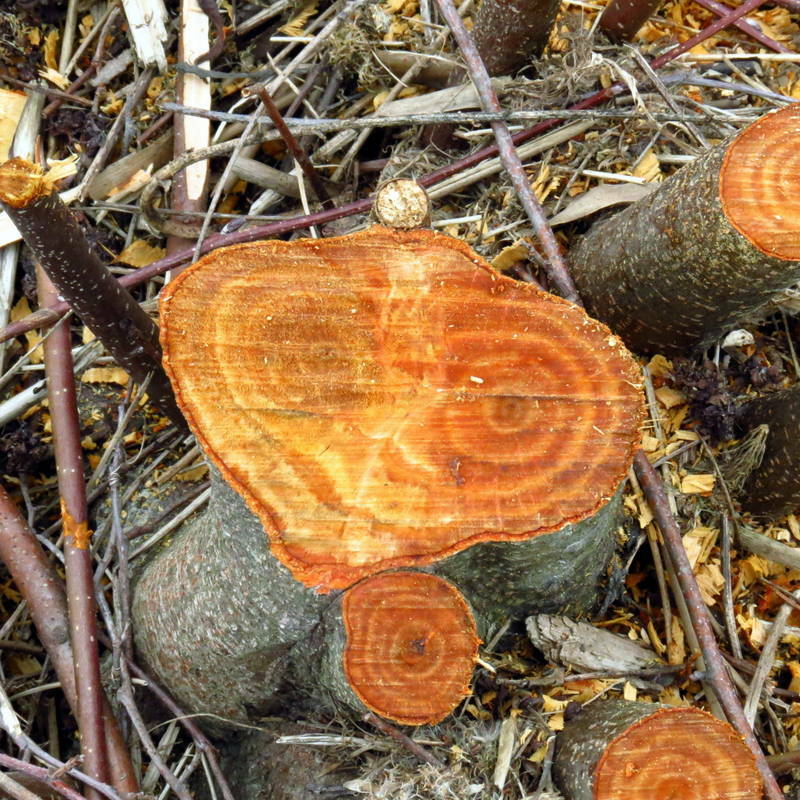 The burnt wood is said to make excellent drawing charcoal. 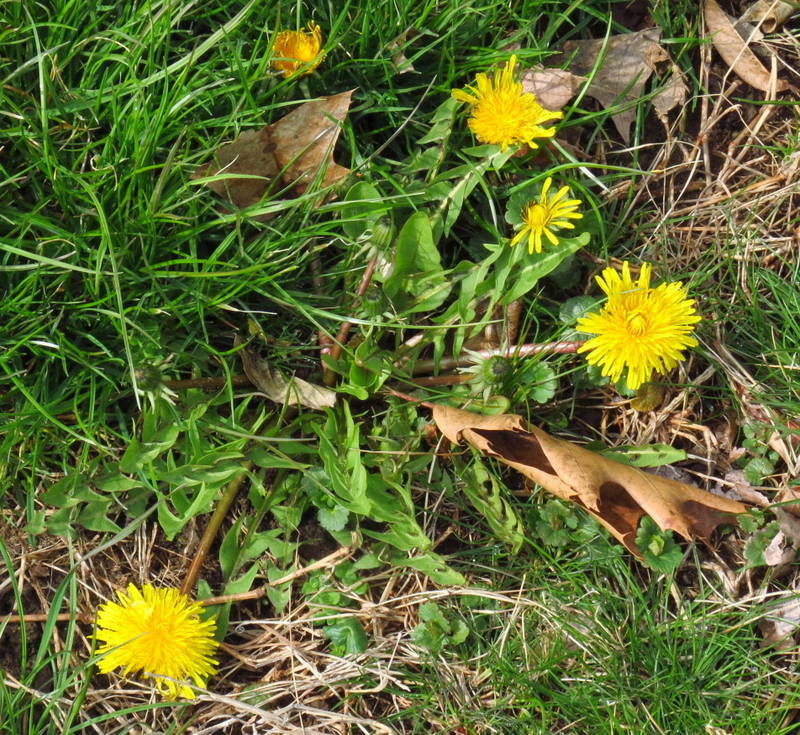 Dandelions are still blooming and will do so until the weather warms up. I never noticed until two or three years ago that they don’t like the heat of summer. It’s almost impossible to find one blooming in July and August these days. They aren’t wasting any time about continuing on with new generations. 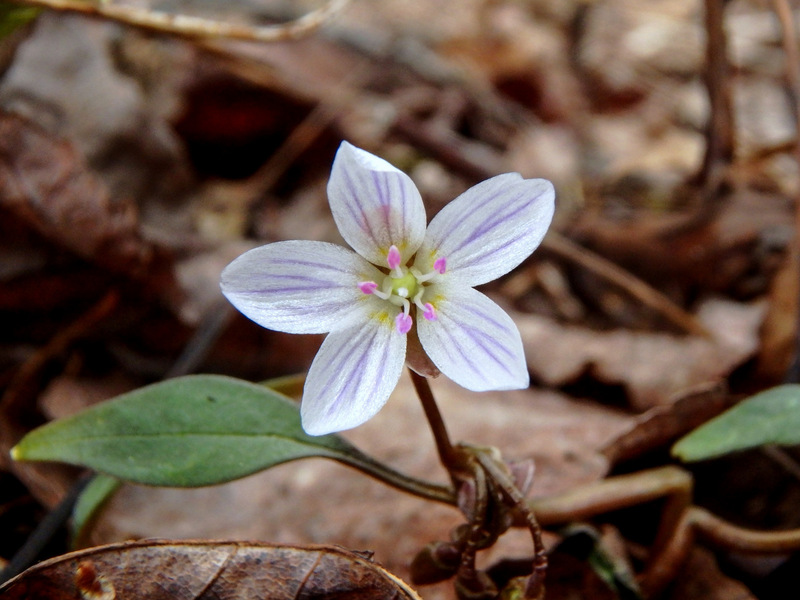 I got excited when I found budded spring beauties (Claytonia virginica), let me tell you. They’re very beautiful little flowers and it’s been so long since I’ve seen them. I’m guessing that, by the time this post sees the light of day they’ll be blooming. 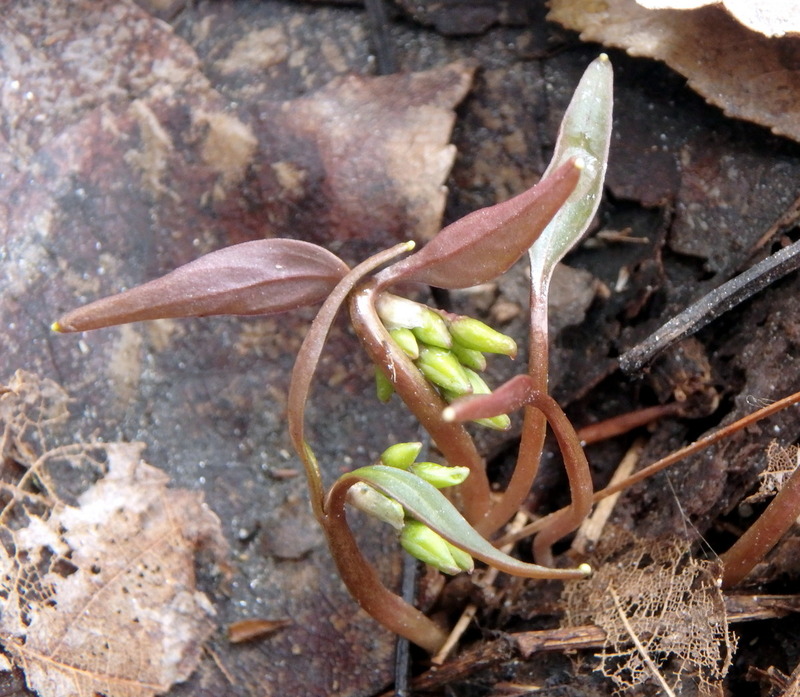 This photo of spring beauties from two years shows why I got excited when I saw those buds. It’s hard to put into words how I feel when I find such beautiful little flowers; it’s like I’m lost in them for a while and this world no longer exists. 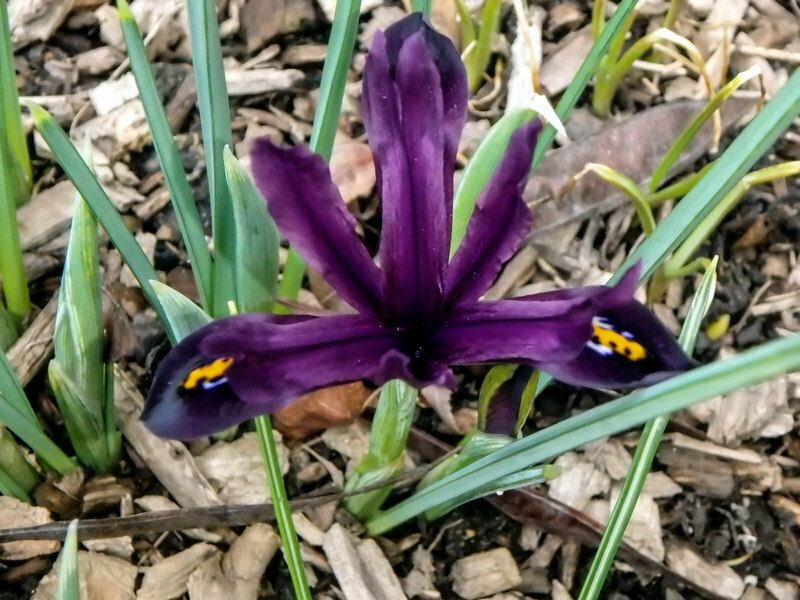 A hint on photographing spring beauties: their color will be more saturated if you find and photograph the ones in shade. It doesn’t take much sunlight to wash out such delicate colors. Speaking of harsh sunlight, that’s all I had when I went to see what the skunk cabbages were doing. As I suspected, leaves are beginning to show. Just when the leaves develop is the only time these plants even remotely resemble cabbage, in my opinion. 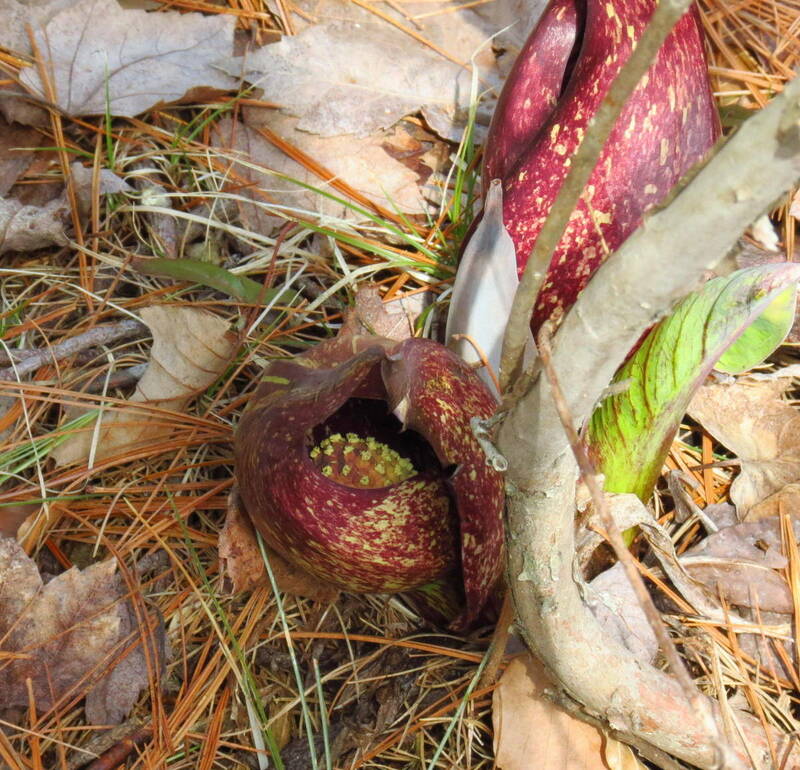 The open spathe of a skunk cabbage flower allowed a peek at the spadix with all of its flowers inside, which is something very few people ever get to see. Only if you hunt for it and look carefully will you find it, and I suppose a lot of people don’t even realize it’s there. Each tiny flower on the spadix has both male stamens and female styles and pistils. 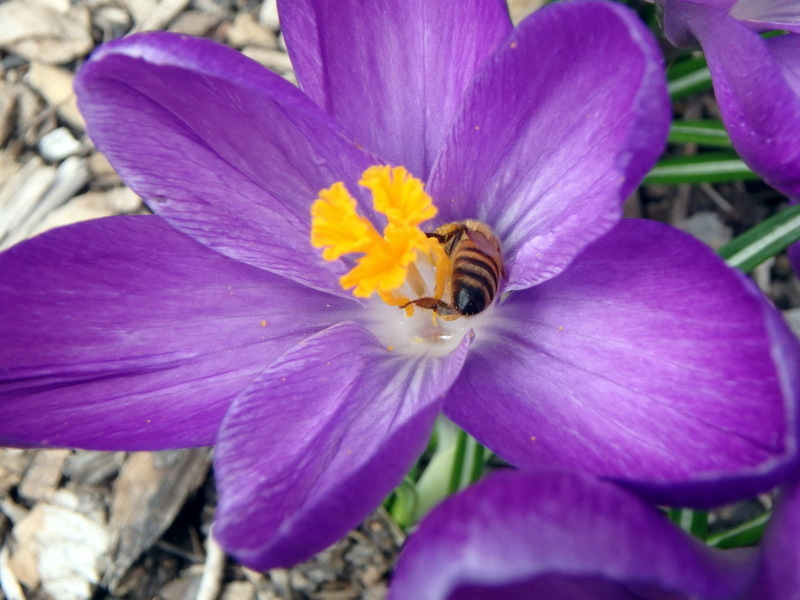 It’s all about pollen at this stage but science doesn’t know for sure how it gets between one plant and another. My money is on insects; I’m seeing lots of them right now. Small, fly like creatures that don’t sit still more than a few seconds. I guess you’d call them gnats. 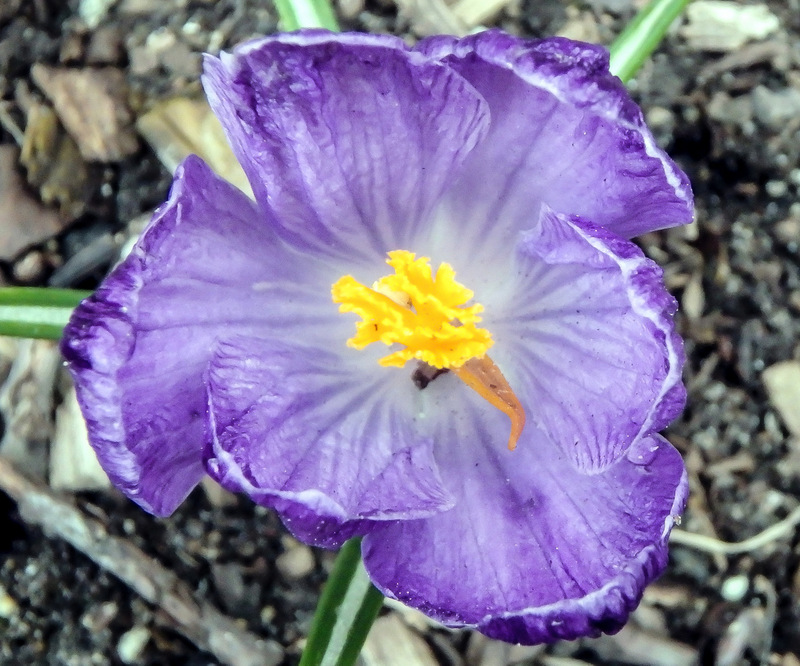 I found a bed with hundreds of crocus blossoms in it, and they just happened to be in one of my favorite color combinations. I’ve spoken before about how some things can be as beautiful in death as they are in life and this passing crocus blossom reminded me of that. If you’re serious about nature study you have to get used to seeing death, because it’s part of the cycle of life. 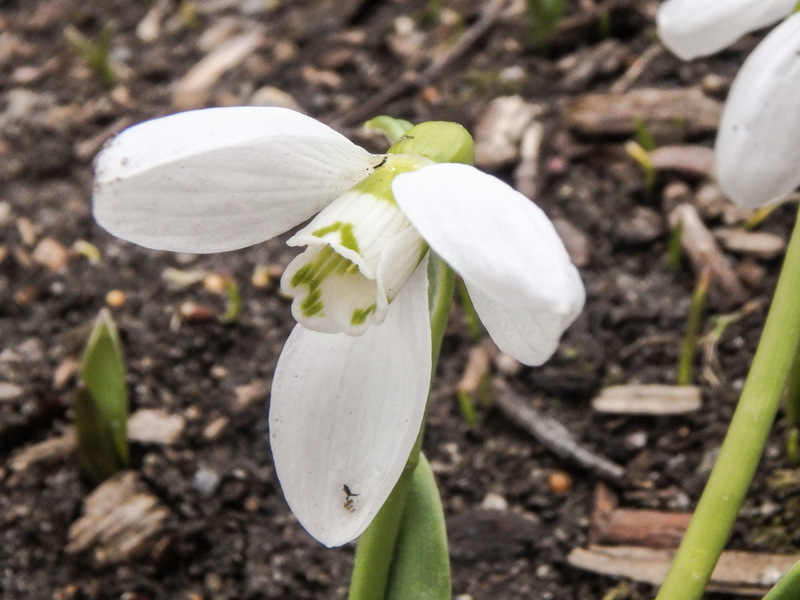 When I was gardening professionally not a single client grew snowdrops and as far as I know nobody in my family did either, so I don’t know them well. I do know that they’re scarce in this area; I see small clumps of 4 or 5 flowers every spring but not the huge drifts of them that I’ve seen online. They simply don’t seem to like it here and that could be because they aren’t used to our kind of cold. 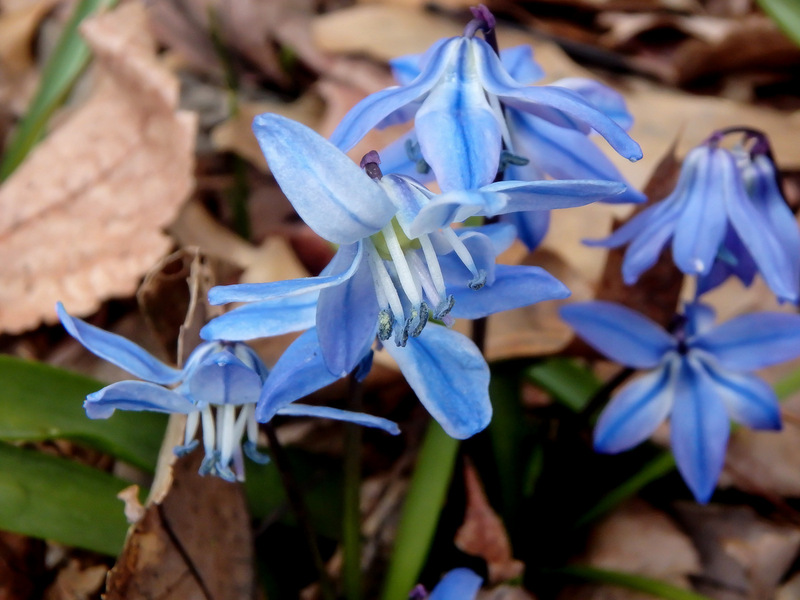 Scilla (Scilla siberica) came up fast. They’re very cheery little flowers and they’re my favorite color. 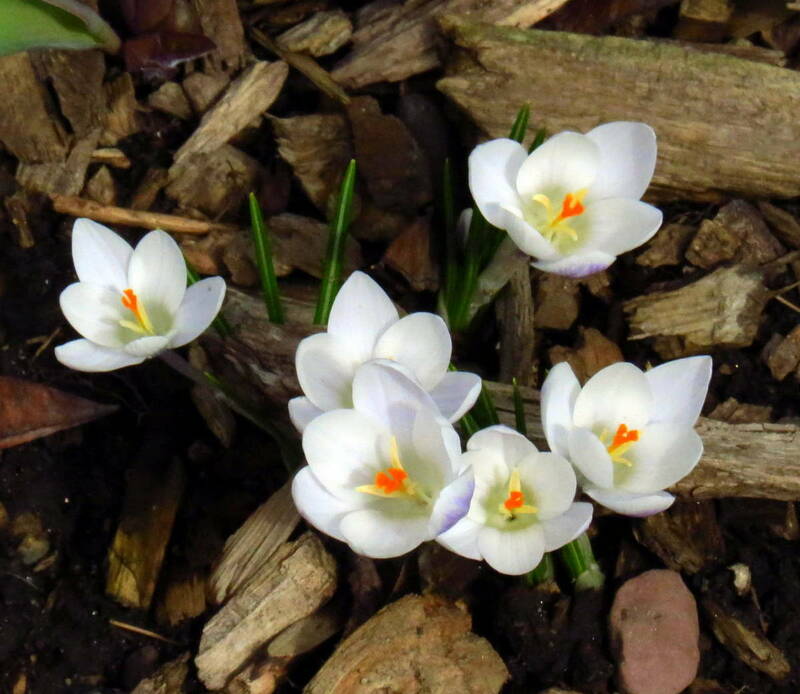 The only complaint I’ve heard about these nonnative bulbs is that they can be invasive. They can get into lawns here sometimes but people don’t seem to mind. In fact that’s just what many people want them to do. 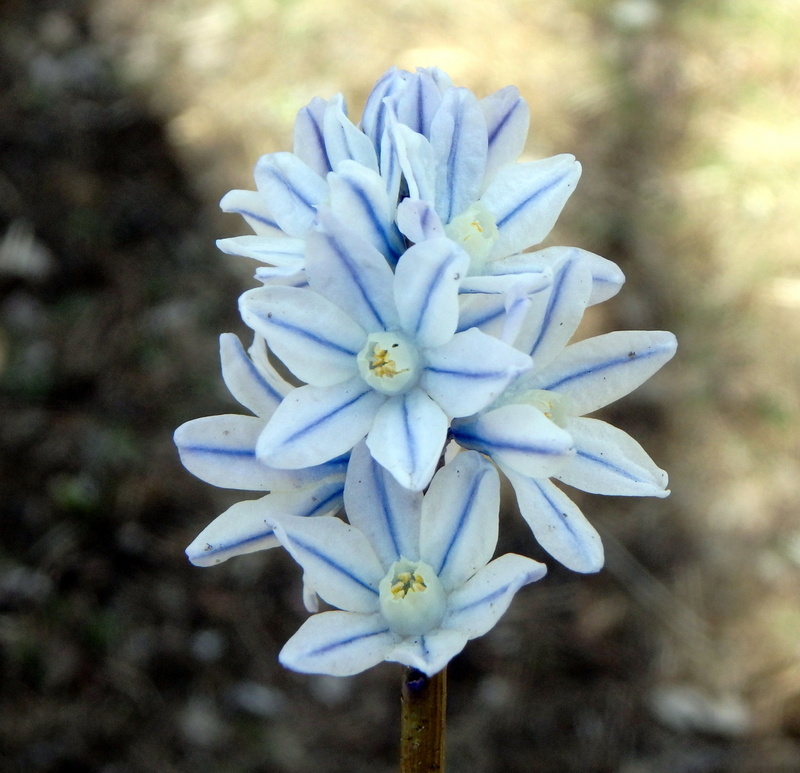 Another plant related to scilla is the striped squill (Puschkinia scilloides, var. libanotica) and I love to see it each year, but the one place I know of where they grow has had a new in ground sprinkler system installed and this year I’m not seeing a single blossom. It’s too bad because they’re a very beautiful but rare blossom in this area. 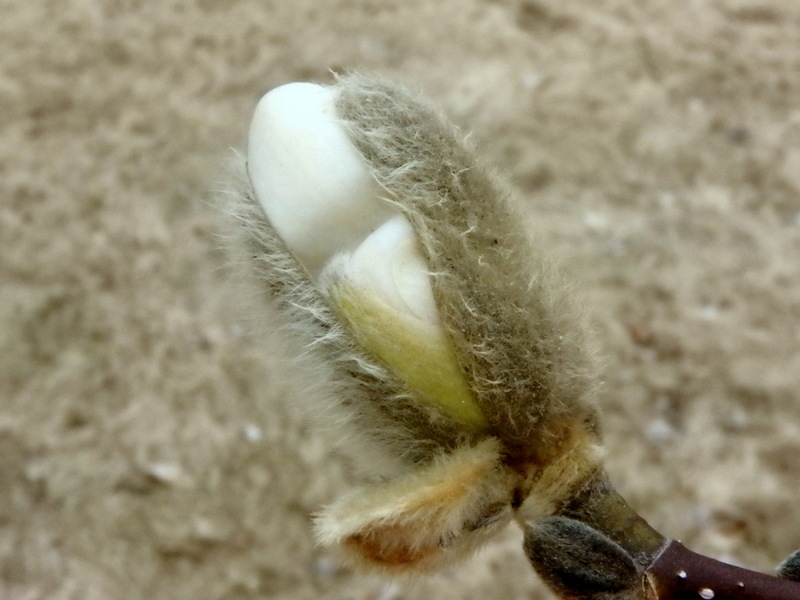 I’ve been watching the trees and one of the things I’ve seen was a magnolia bud shrugging off its winter fur coat. I’d guess it will be a flower by next week at this time. Some magnolias are very fragrant and I’m looking forward to smelling them again. 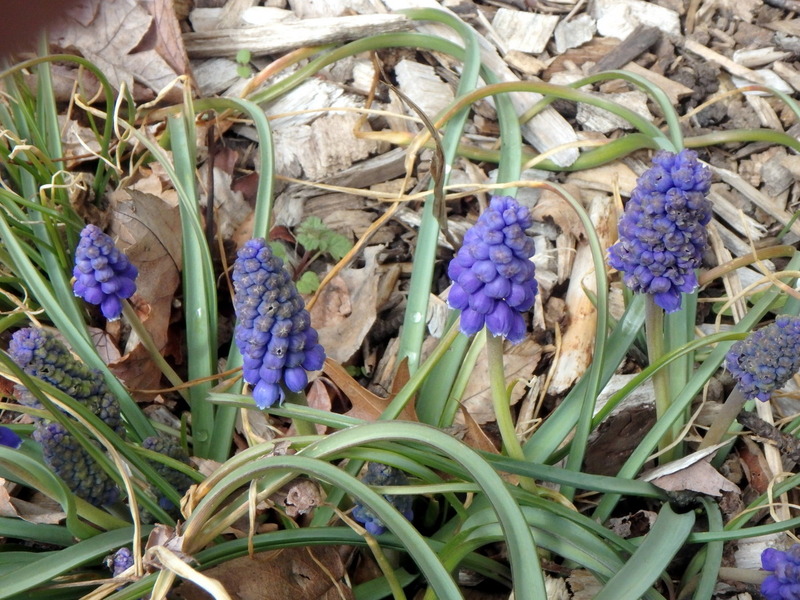 It’s actually a little too early for grape hyacinths here but these were warmed by growing near a building’s foundation, so they came up with the crocuses. It was nice to see them; almost like a reward, but you can see how they’ve been bitten by the cold. It’s the price I’ve seen many plants pay for over exuberance in the spring. 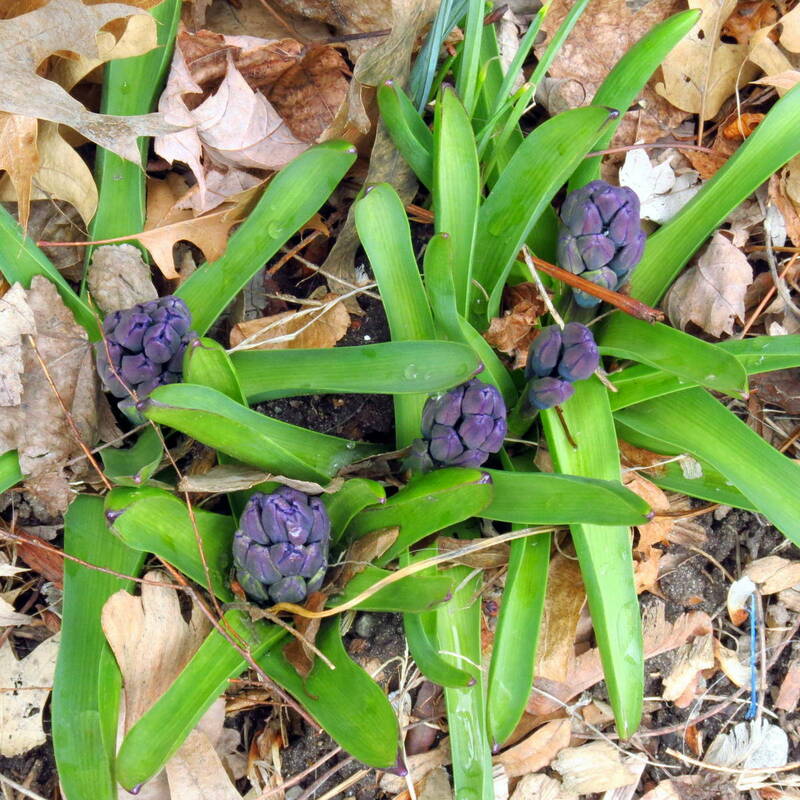 I’m guessing that hyacinths are going to be beautiful this year. I’ve seen a lot of them showing color. It’s just another guess but I’d say you’ll be seeing a lot more flowers in the next post like this one. I could be wrong though because we’ve had a cold week. Nighttime temperatures have fallen below freezing a few nights and we had a dusting of snow Wednesday, so we’ll see. 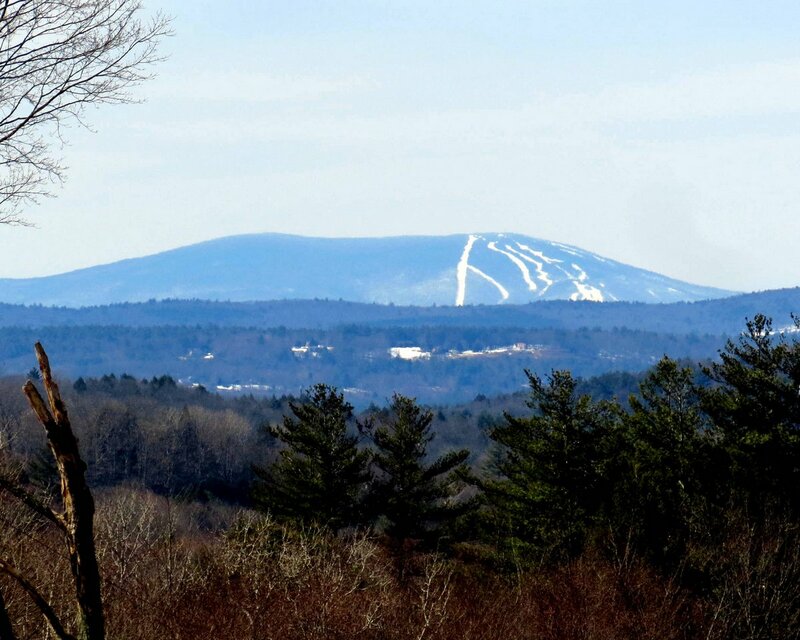 One thing is certain: spring will happen. 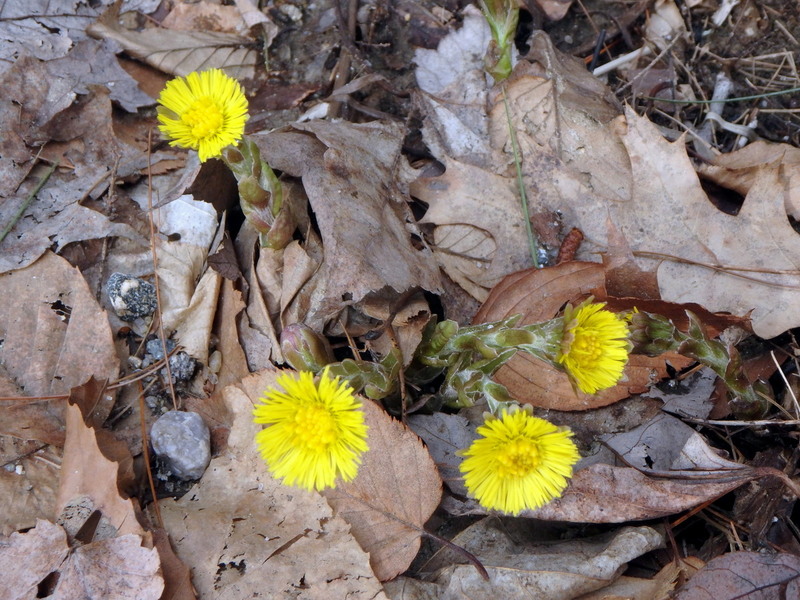 I’d been almost everywhere I knew of where coltsfoot plants (Tussilago farfara) grow and hadn’t seen a single one, so last Sunday I decided to visit the last place I knew of to find them; the deep cut rail trail up in Westmoreland. 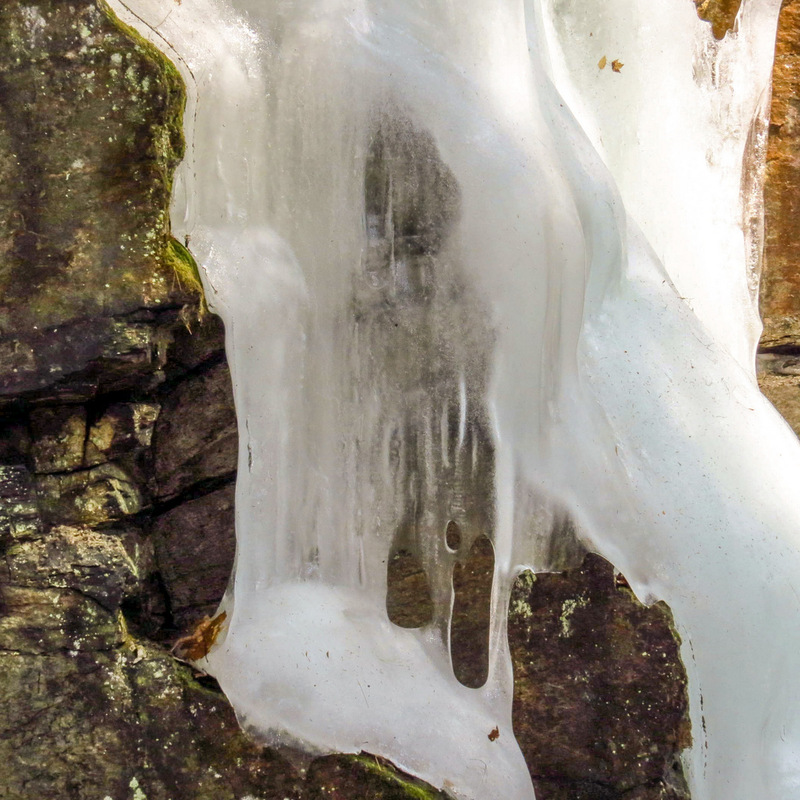 I don’t like going there at this time of year because this is when all the ice that has accumulated through winter starts melting, and when it starts melting it starts falling, and this can be a dangerous place to be when tree size pieces of ice come crashing down. 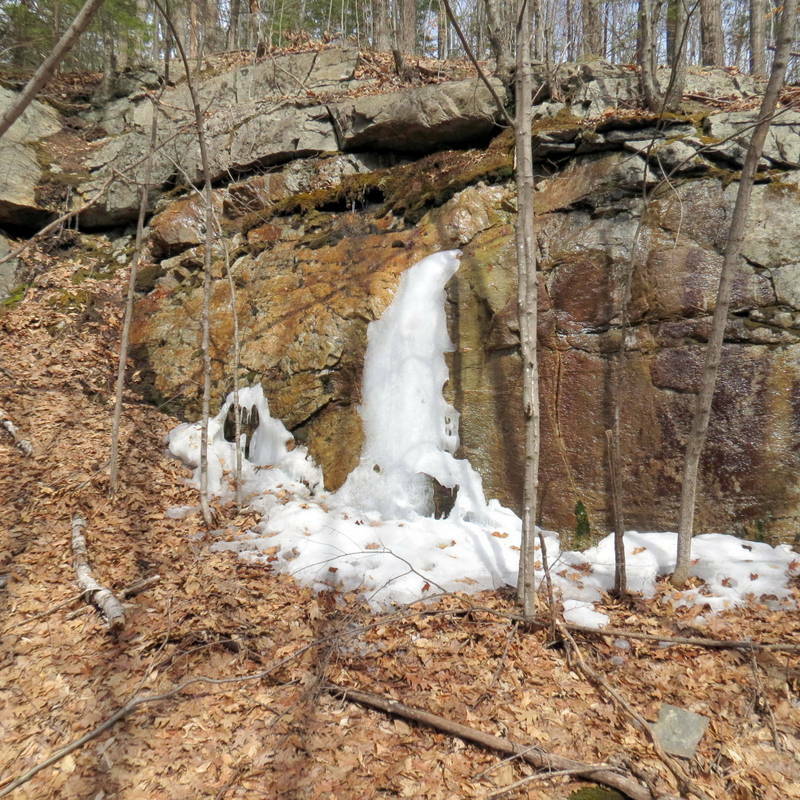 There was a lot more ice than I expected and it was rotten, which means it has probably released its hold on the stone and could come down at any time. 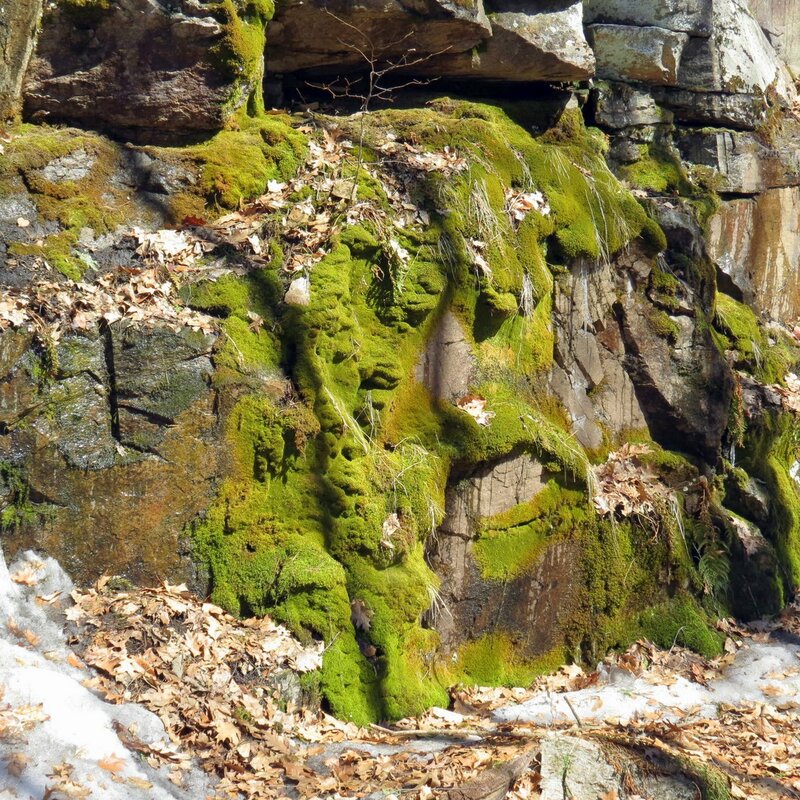 Melt water ran off the stone walls in gushing streams. 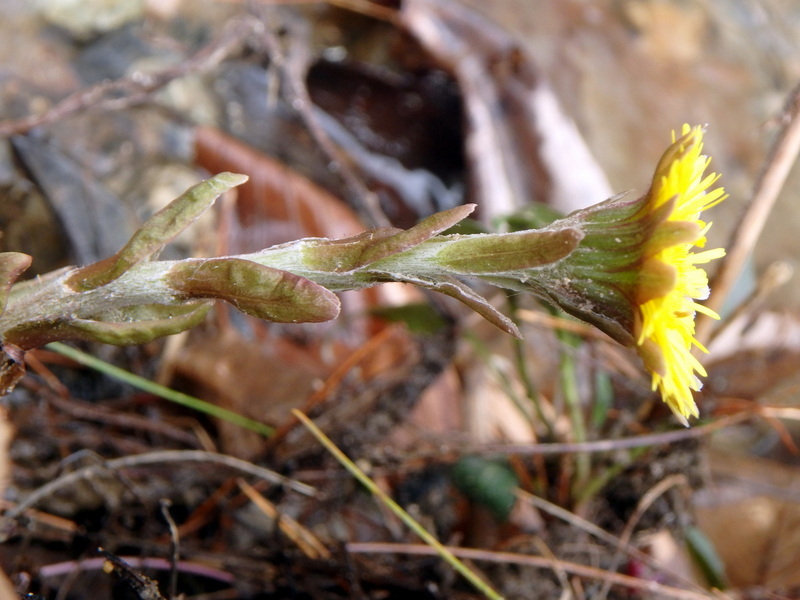 I decided to get out of the deepest, northern part of the canyon and head south where the coltsfoot plants grow. 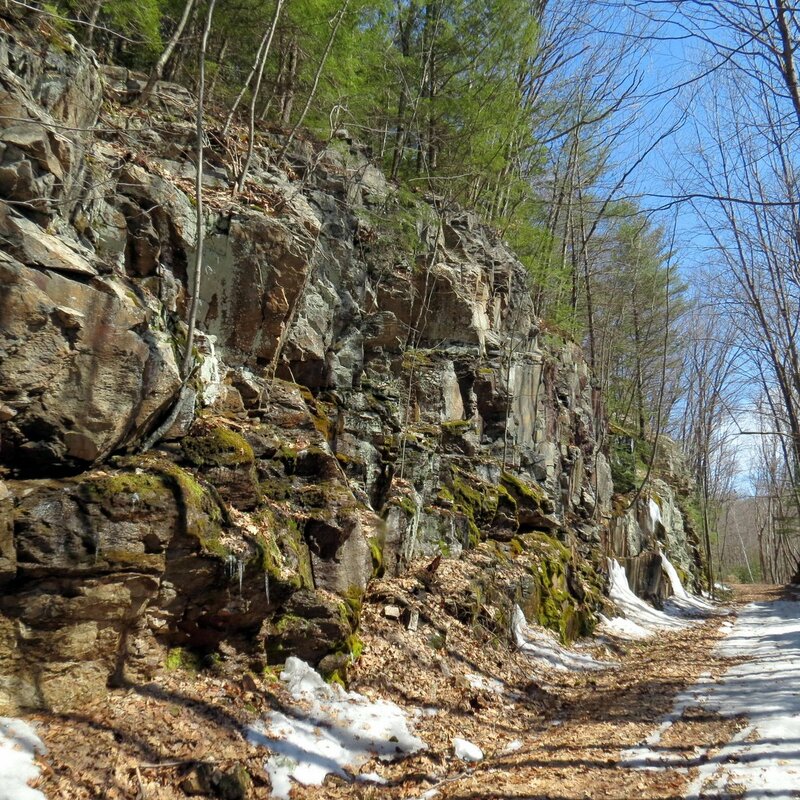 This rail trail includes the ledges where the wild columbines (Aquilegia canadensis) and blue cohosh (Caulophyllum thalictroides) grow, so I thought I’d see what was happening there as well. 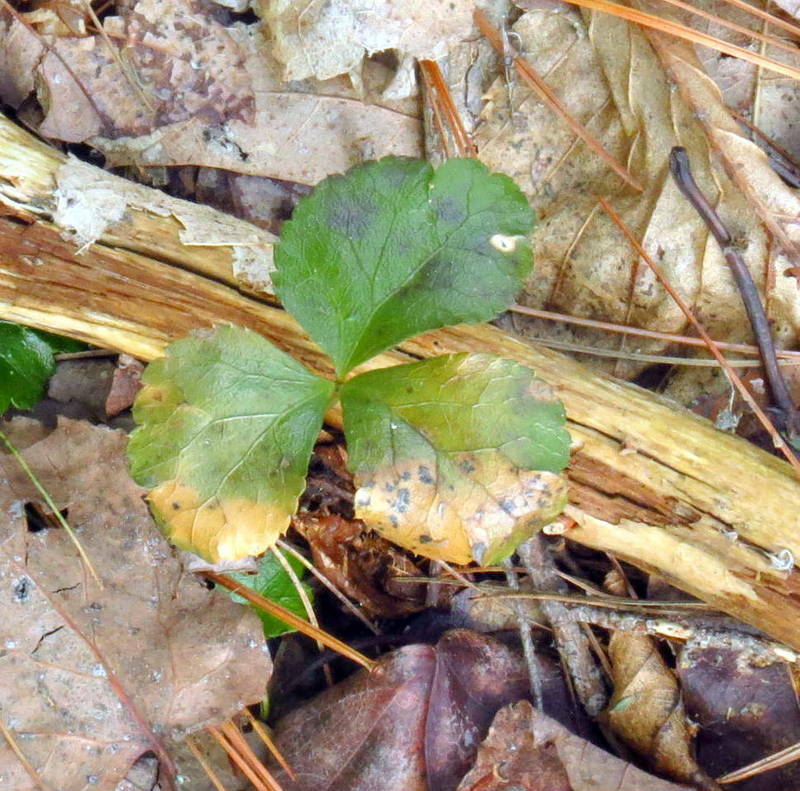 I saw lots of columbine seedlings but still no blue cohosh shoots. 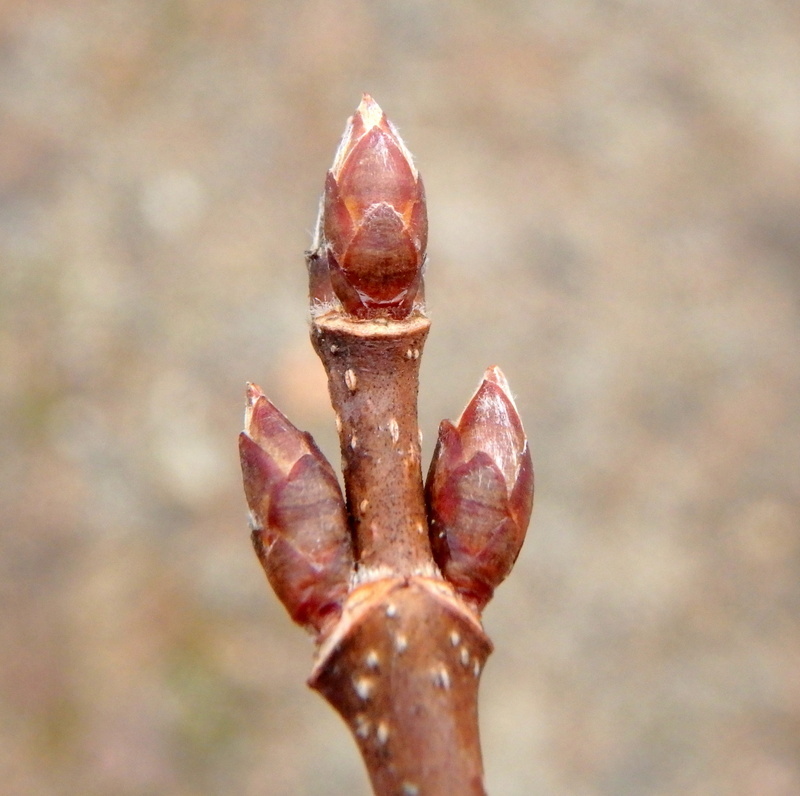 I also got to see some red elderberry buds (Sambucus racemosa) opening. They always open with tiny purple fingers like those seen here. 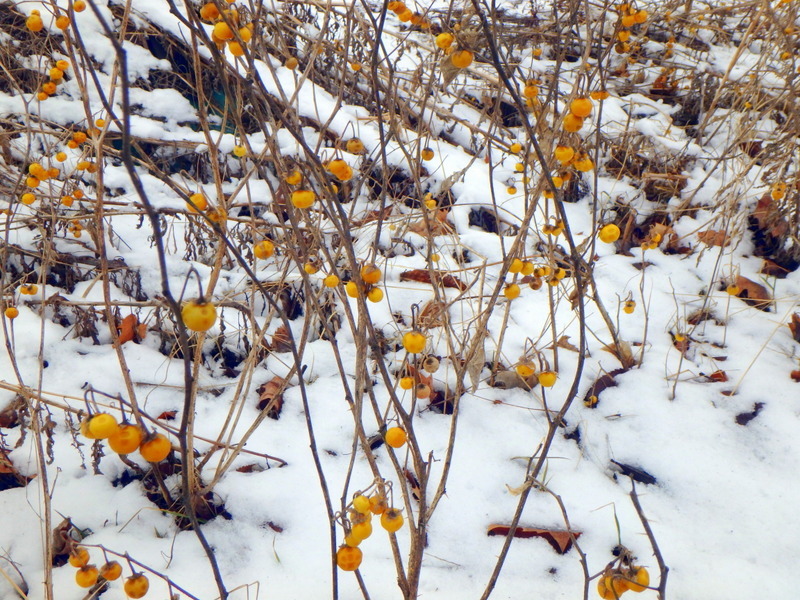 It won’t be long before this plant is covered with bright red berries. The birds love them so much and eat them so fast it’s almost impossible to get a photo of them. I think I’ve gotten just one photo of red elderberry fruit in the 8 years I’ve done this blog. 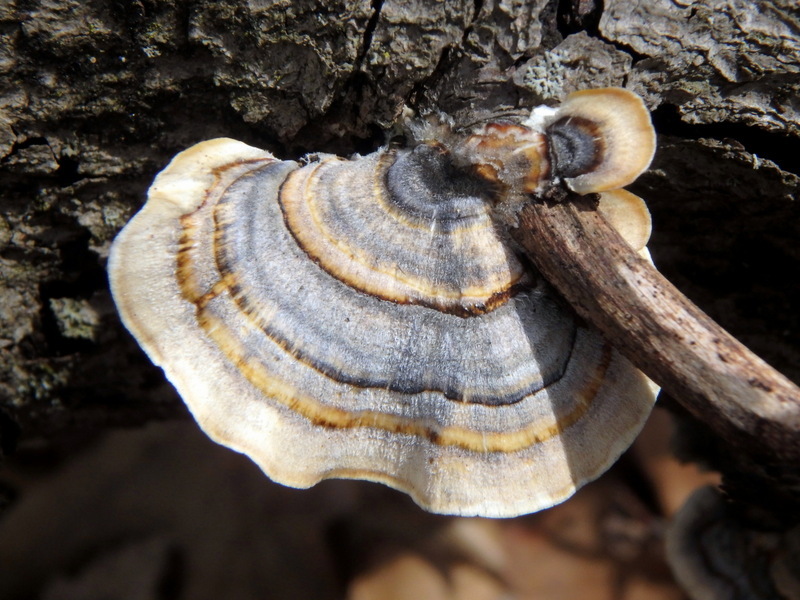 I saw a turkey tail fungus (Trametes versicolor) wearing colors that I don’t often see. I’ve been seeing a lot of blue ones this year so this one was a pleasant surprise. I also found this chunk of blue something. It’s light and feels like plastic but it also crumbles so I doubt it is. 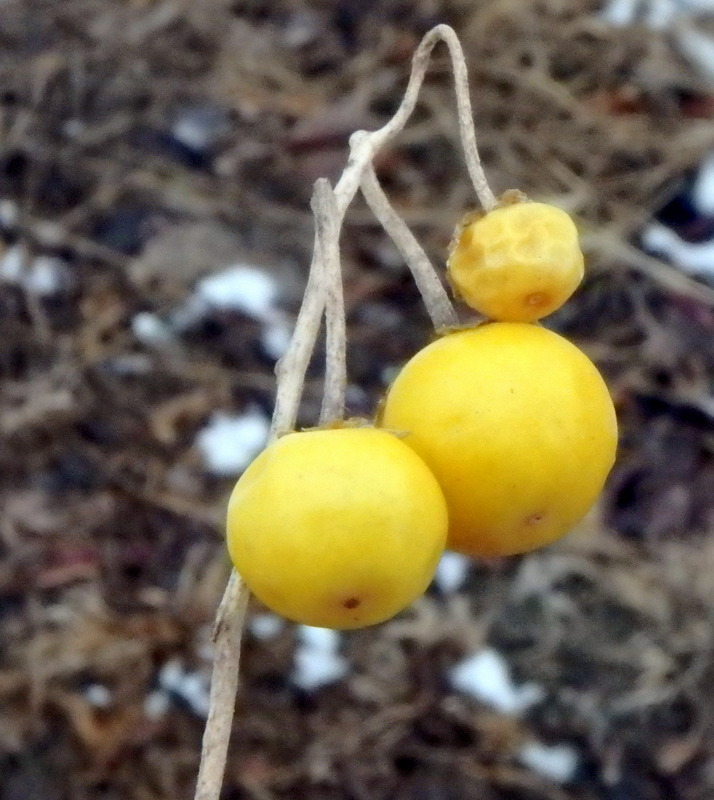 I don’t know what it is or where it came from but I love its color; almost the same as the blue of cohosh fruit. And then I saw these strange little trumpet shaped stems. They easily pulled right out of the wet soil and had a tap root. The stems were thin and hollow and felt like paper. I don’t know what plant they’re from but there is a huge selection of plants growing here. I’ll have to see if I can figure it out in the summer when they’re growing. 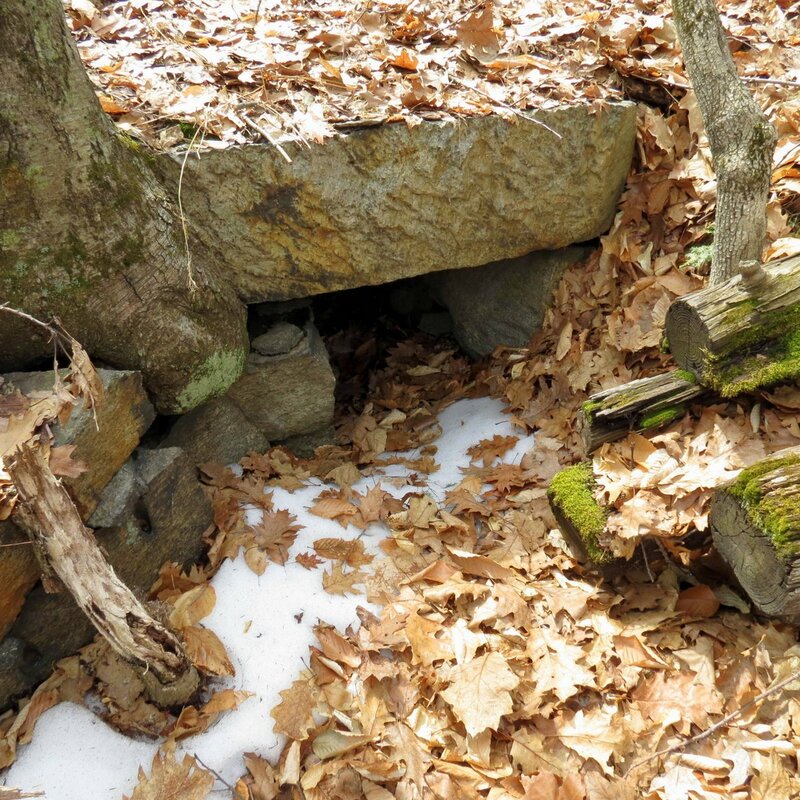 The drainage ditches had so much water in them in places it looked like they would wash up over the trail. I moved some bunches of wet leaves that were holding back the flow in a couple of places. And this is where I had to stop. 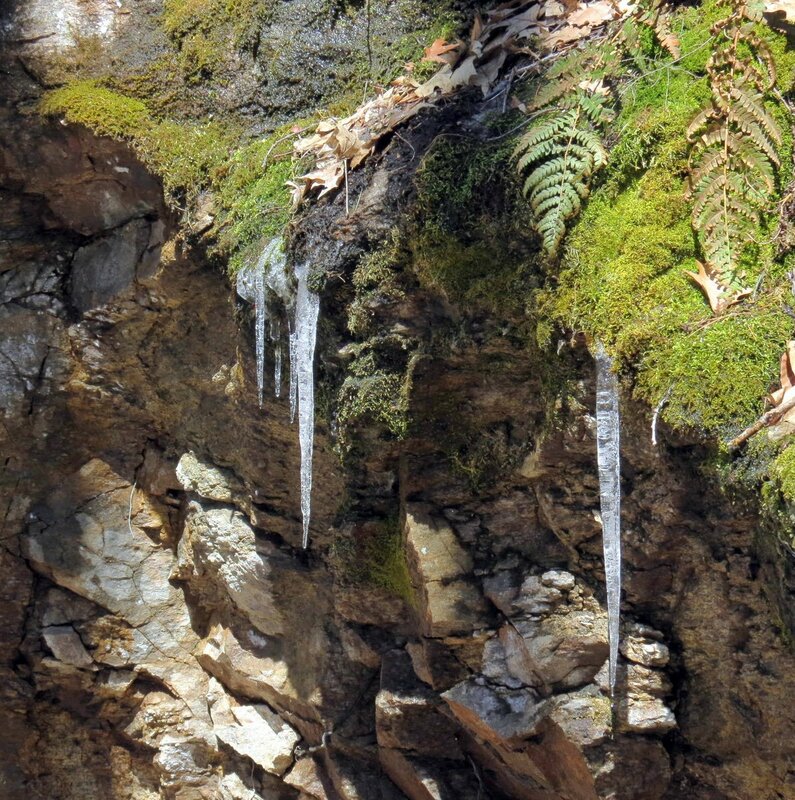 If you look closely you can see ice columns that have fallen completely across the trail. These columns are huge, easily as big as trees, and if one ever fell on you it wouldn’t be good. This “small piece” was about two feet square. I can’t imagine what it must have weighed but I wouldn’t want to feel it falling on me. The ice here is often colored, I think because of the various minerals in the groundwater, and there was some green ice left. It was very rotten and I didn’t get near it. Rotten ice has a matte, opaque “sick” look and the dull thud it makes when you tap it gives it away. It should sound like a sharp crack. Ice becomes rotten when air and / or dirt get in between the grains of ice and it becomes honeycombed and loses its strength. 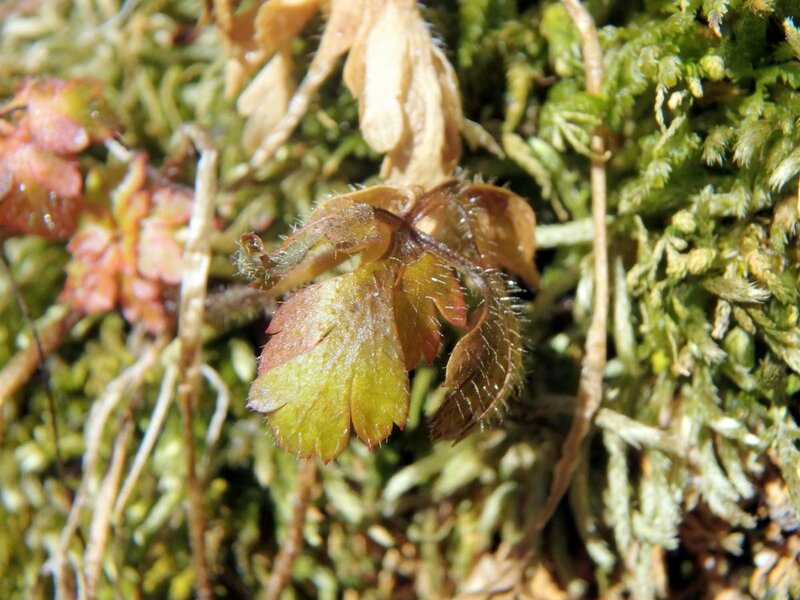 The beautiful great scented liverworts (Conocephalum conicum) made it through the winter just fine despite many of them being completely encased in ice. 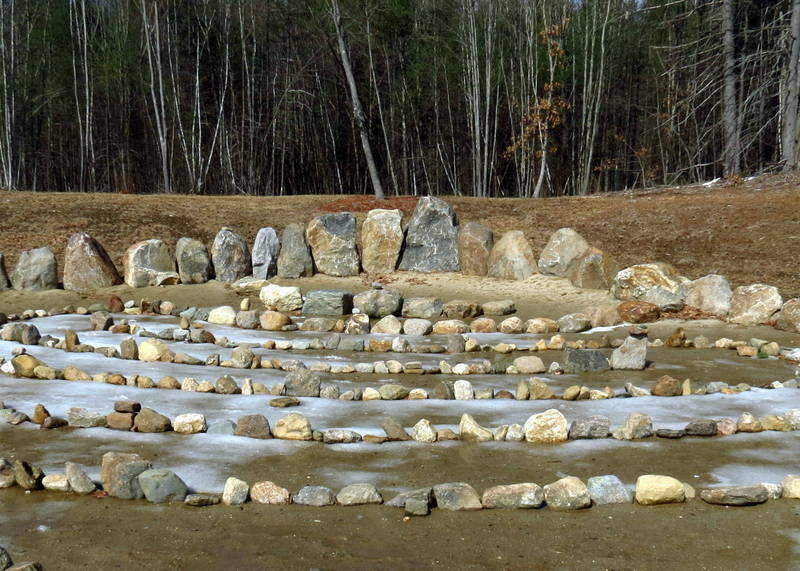 They like to grow in places where they are constantly splashed by or dripped on by very clean ground water but of course in winter that means ice. 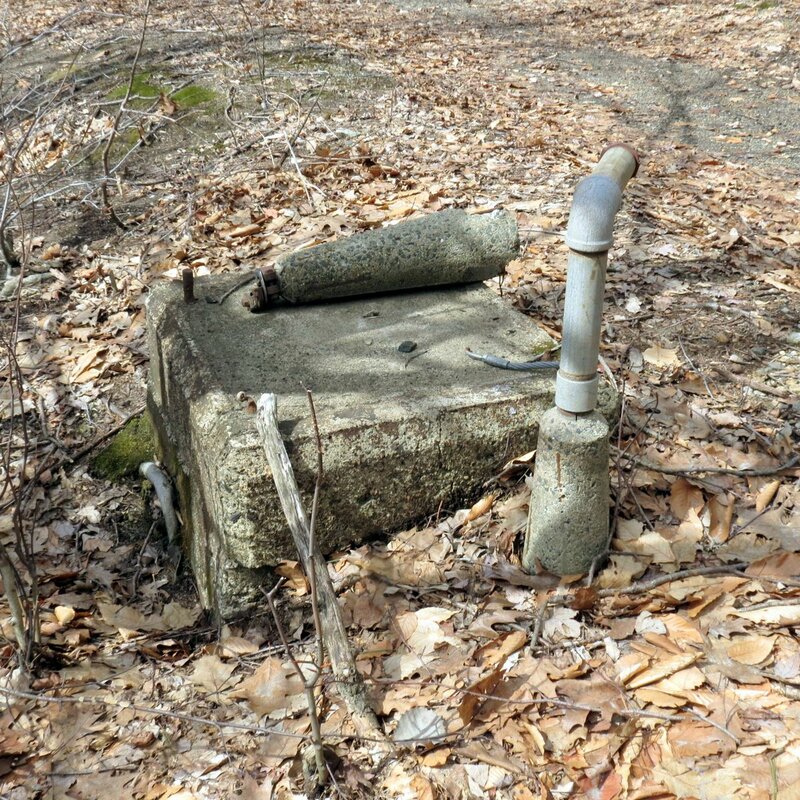 They show that the groundwater here is very clean and most likely drinkable. This is the only place I’ve ever seen this beautiful plant and they are one of the things that make this place so very special. 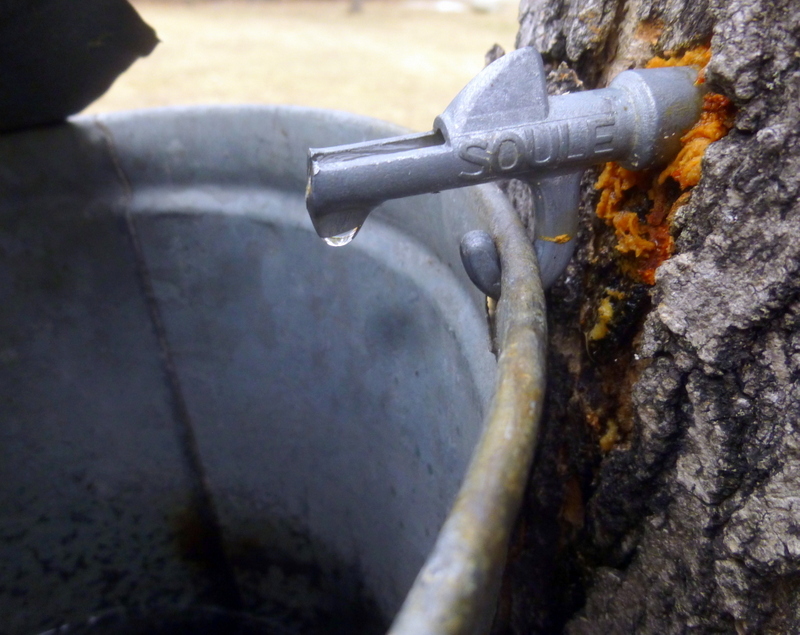 Their amazing scent is where their common name comes from; if you squeeze a piece and smell it you smell something so clean and fresh scented you’ll wish it came in a spray bottle. I didn’t have my rubber boots with me to walk through the drainage ditches so I had to take this shot from about 6 feet away, but at least you can see the pores and air chambers outlined on the many leaf surfaces. It makes them look very reptilian and leads to the name snakeskin liverwort. 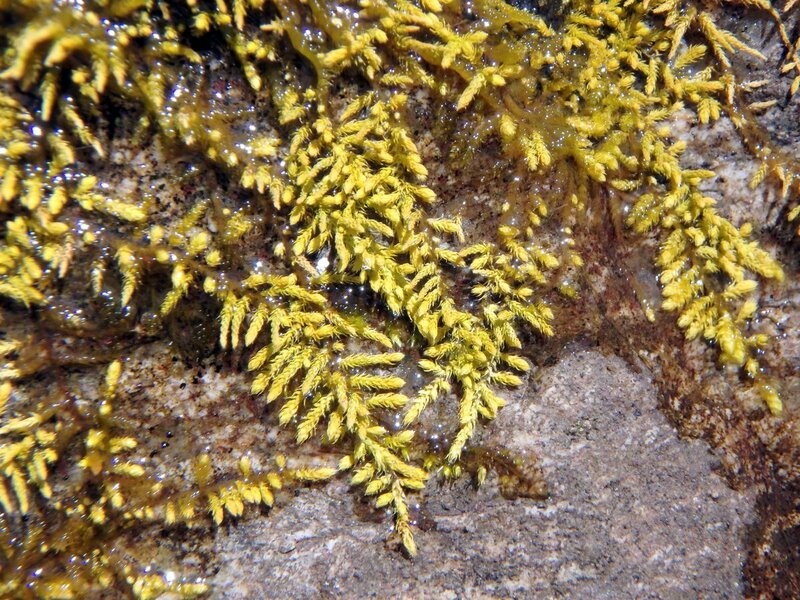 The green algae called Trentepohlia aurea looks to be spreading some. Though it is called green algae the same pigment that colors carrots orange makes it orange as well. It’s also very hairy, but I couldn’t get close enough to show you. Algae produce millions of spores and colored rain has fallen all over the world because of the wind taking the spores up into the sky. If you ever hear of red rain chances are it’s algae spores coloring it. It was so nice to see so much green for a change. It was also nice and warm here, which was a surprise with all the ice. I was surprised to find the fertile frond of an ostrich fern (Matteuccia struthiopteris) because I’ve never seen one growing here. Now I want to come back to get photos of the fiddleheads, which are pretty and very hard to find in this area. 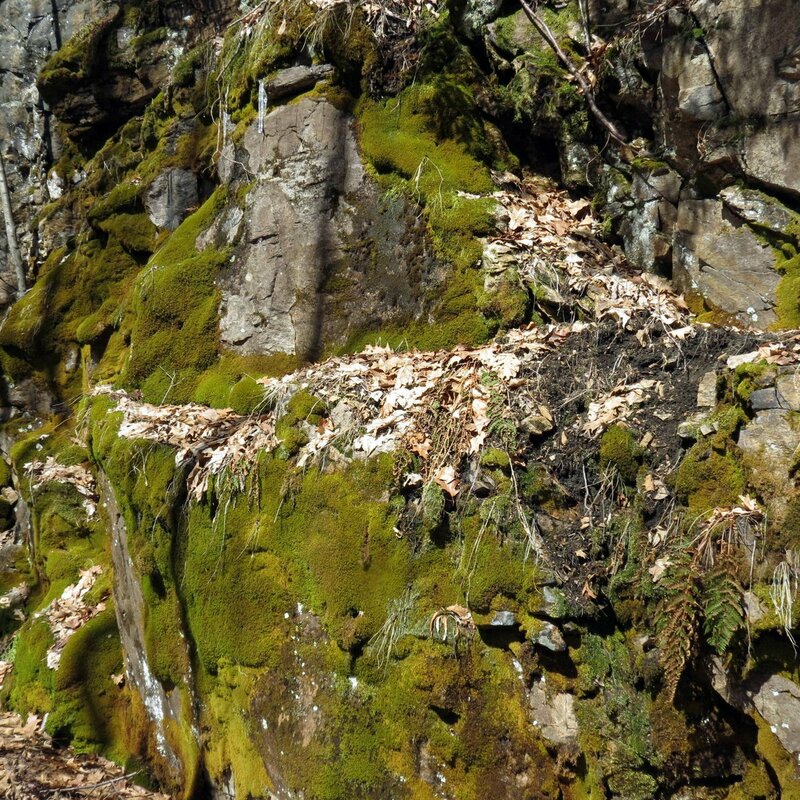 There are thousands of ostrich ferns growing along the Connecticut River but most of the land along it is privately owned. 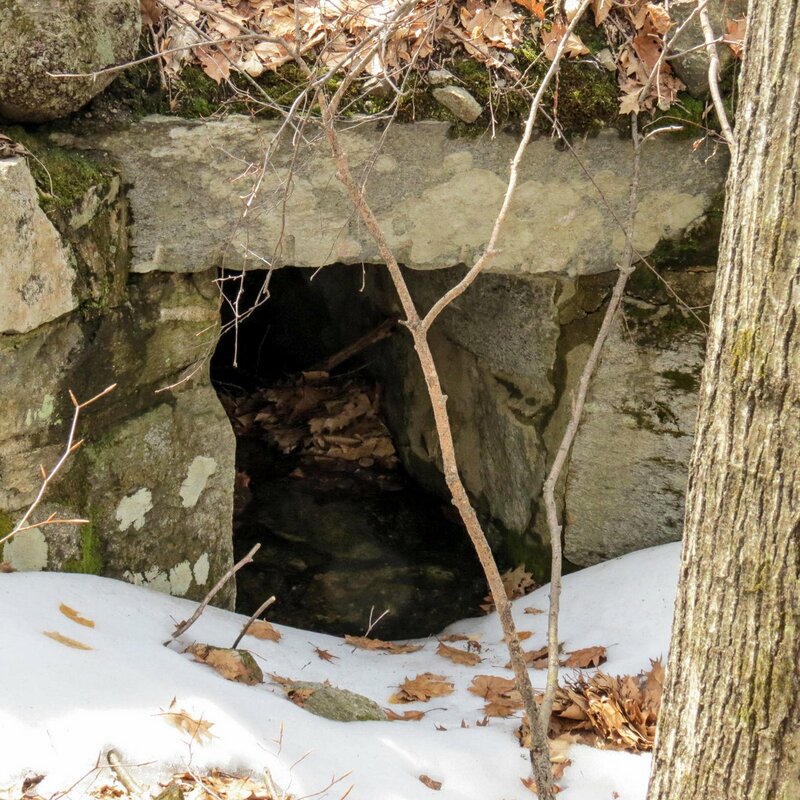 Well, in the end I never did find coltsfoot plants in bloom but I certainly found lots of mysteries along the trail on this day. Here’s another one that maybe one of you can solve. I know I’ve seen this plant and I should know its name, but I can’t think of it. 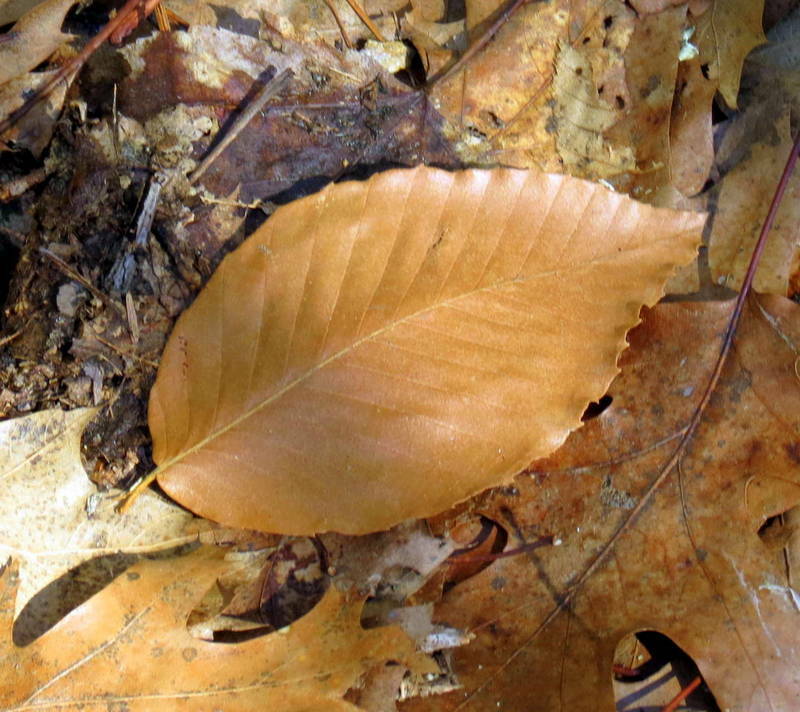 The leaves are large at about an inch and a half across, and I think the bronze color is just what they do in winter. 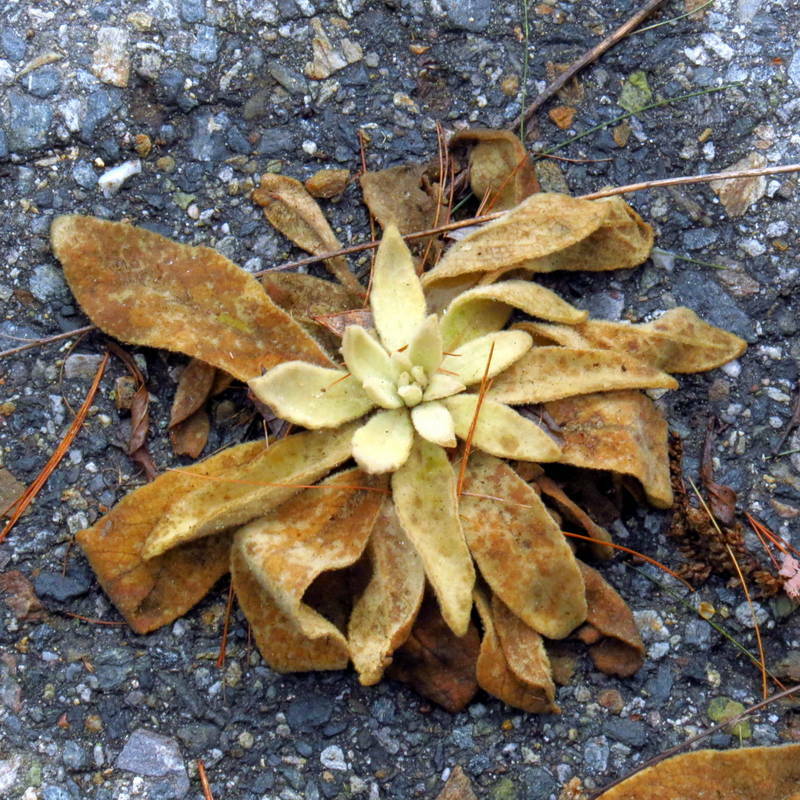 They sprawl on the ground in all directions from a central crown like a violet, but the leaves are too big to be a violet. It’s a pretty thing but without flowers it’s hard to identify.